Today’s Hale Library is cavernous, dimly lit, dusty and loud. Showers of sparks fly as work crews weld new pipes in place. A jackhammer clanks and stutters as they remove damaged entryway tiles. Tomorrow’s Hale Library? It will be welcoming, well-lit and comfortable. Right now on the first floor, workers on aerial lifts install new pipes and duct work. Metal studs cover the limestone facade of the 1955 stacks addition. 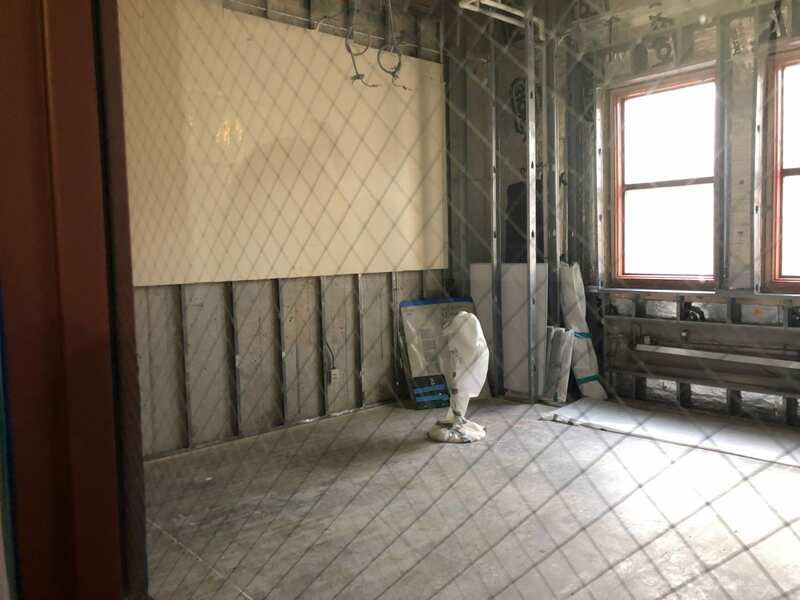 But when the Dave & Ellie Everitt Learning Commons opens on Hale Library’s first floor in fall 2019, this wall will be partially covered by white board surfaces, offering plenty of room for students to study and collaborate. Sections of the limestone will remain uncovered, though. 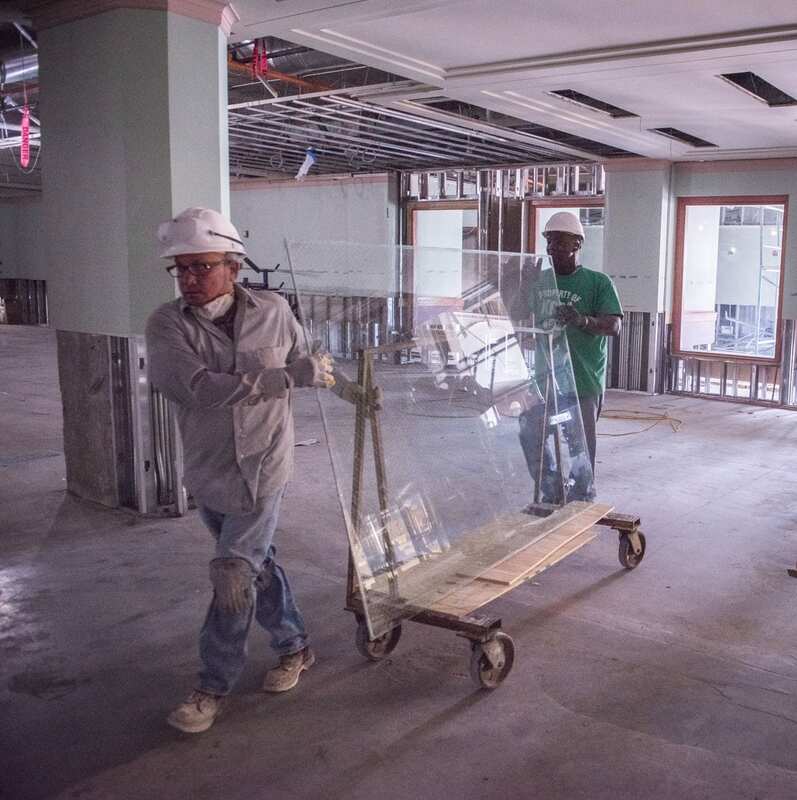 It’s one of the many ways the renovated Hale Library will deliver new, needed amenities for students while honoring the building’s long history. Students take a break from studying for their Human Body final, December 2017. 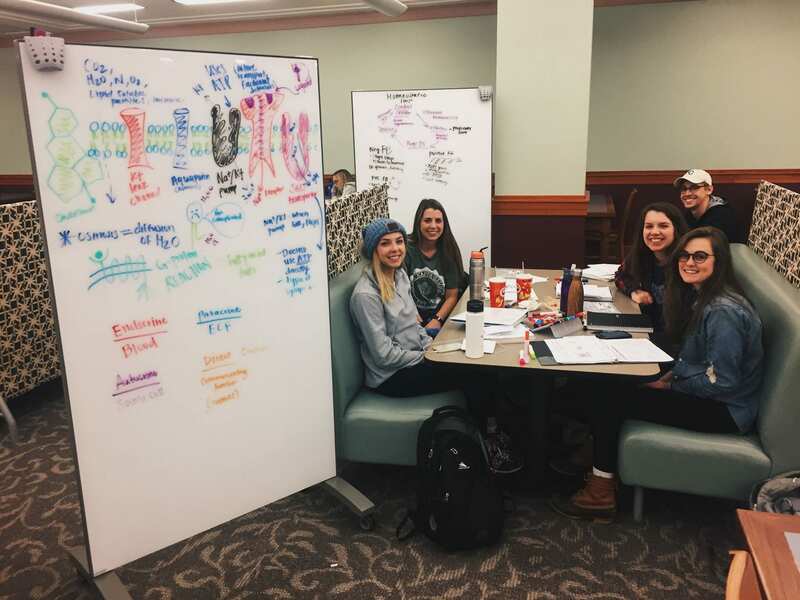 And students will be able to access those white boards at all hours of the day because–drumroll please!–the Dave and Ellie Everitt Learning Commons will be open 24/7. We’ll be able to close the first floor off from the rest of the building so that students can have the study space they need when they need it–even if that’s at 3:00 a.m.
Damaged sections of drywall have been removed from the old white board study area on second floor, and it’s ready for a revamp. April 15, 2019. When the second floor opens in spring 2020, it will feature a similar white board wall. The first and second floors of the 1927 building, Historic Farrell Library, will open during one of the last phases. 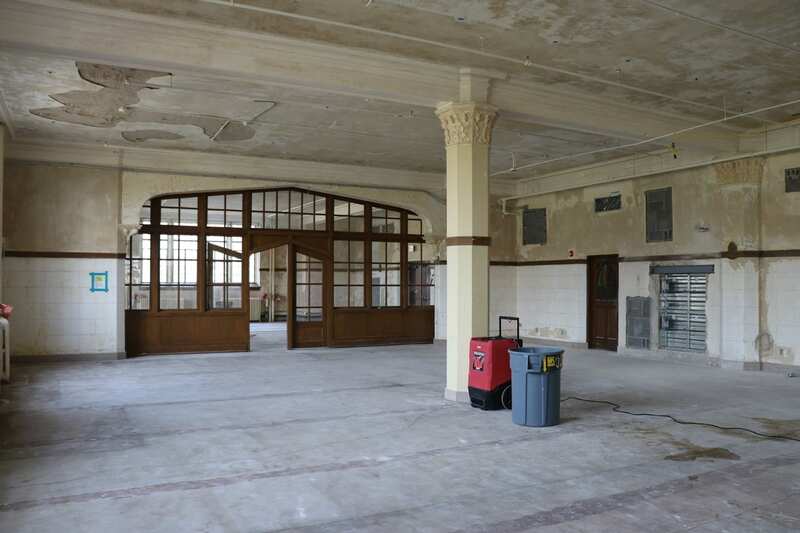 When they do open, though, the amazing natural light and plaster work will take center stage. Previously, few Wildcats ventured into these rooms as they were densely packed with collections and office cubicles. In the renovation, they’ll be transformed into public gathering spots. 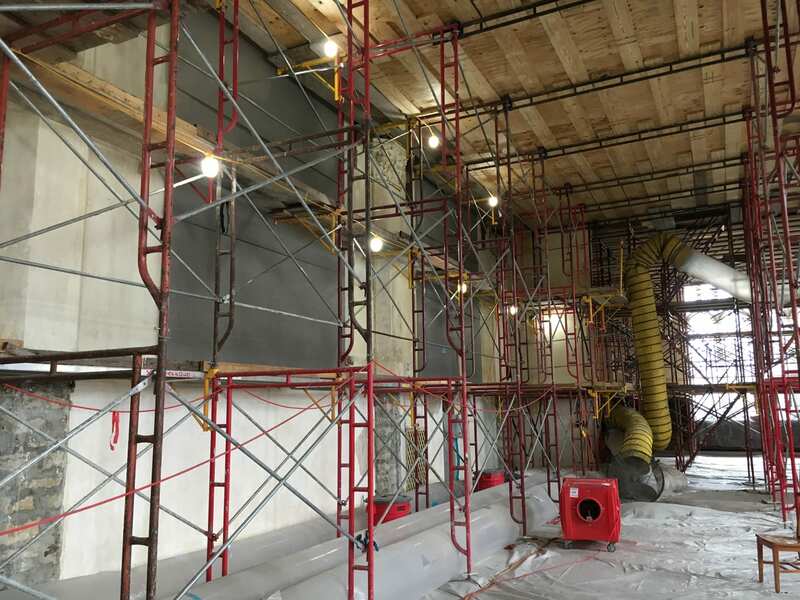 The second floor (shown above) will feature current periodicals and plenty of comfortable seating. 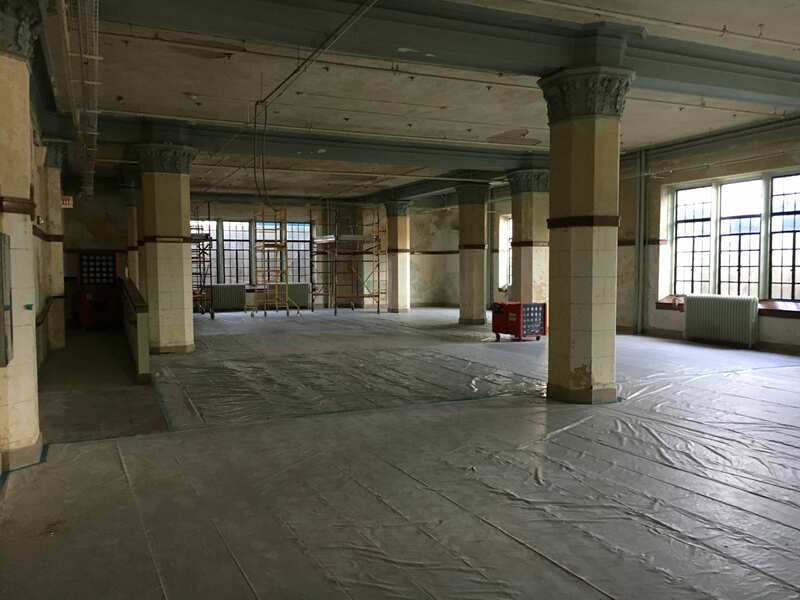 The second floor of Historic Farrell Library has been cleaned out and is ready for its rebirth as our campus’s new living room. Previously, it was home to staff cubicles. April 15, 2019. 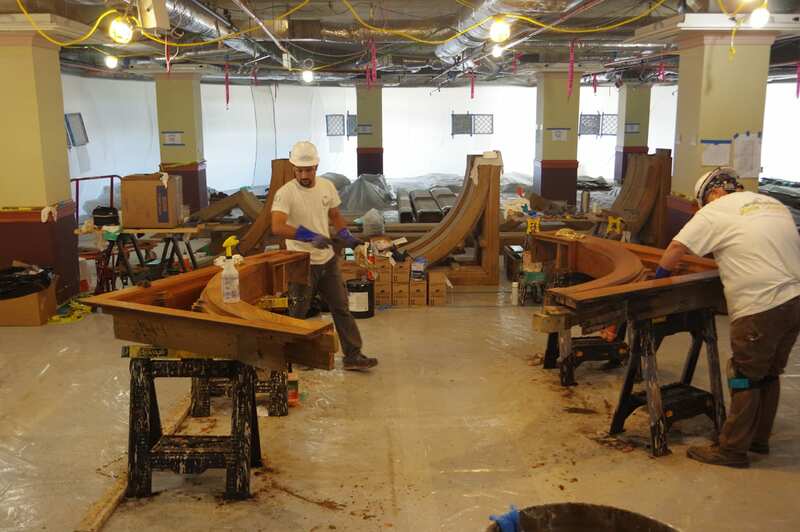 Wood salvaged from Historic Farrell Library sits on the first floor of the 1927 building. It will be reused throughout the renovated Hale Library. April 15, 2019. 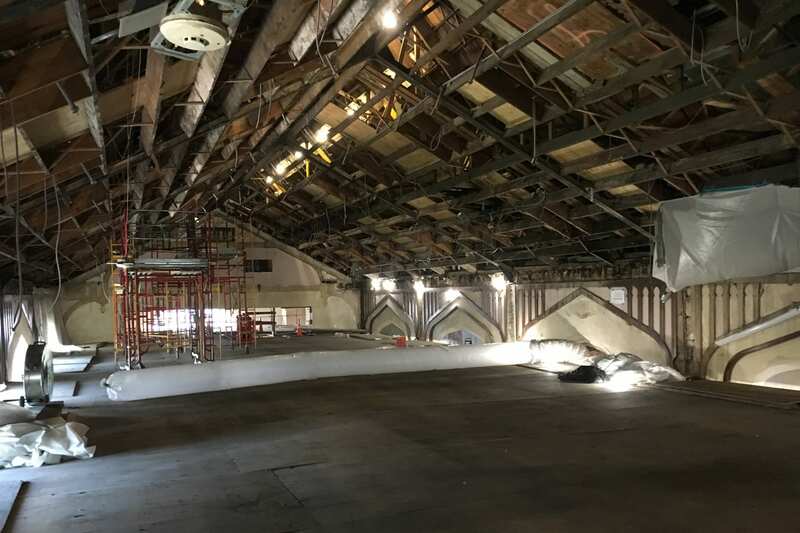 Directly below that living room space, the first floor of the 1927 building will include the same comfortable seating plus juvenile literature and curriculum materials, some of our highest use collections. 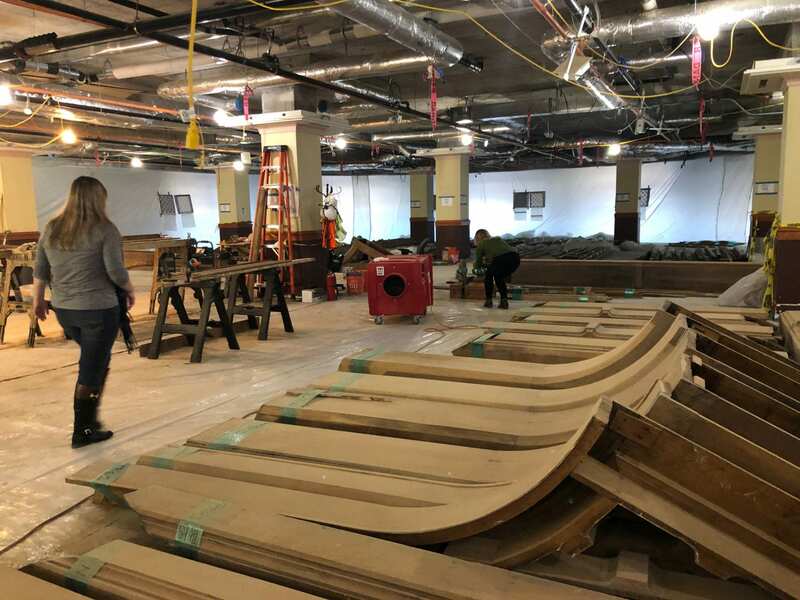 And for those of you wondering about food and drink options, rest assured that the Dave & Ellie Everitt Learning Commons will include an exciting new dining venue. 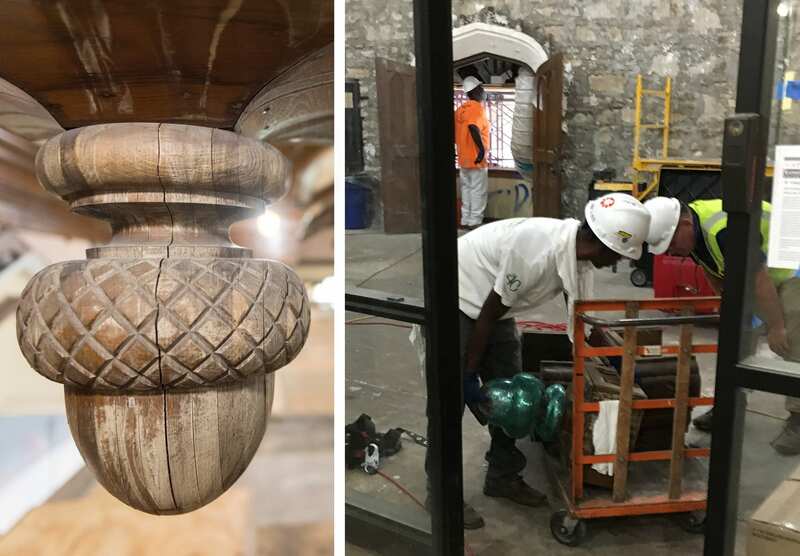 Named in honor of the Hale Family, the new café area will feature a warm, welcoming seating area with wood details salvaged from Historic Farrell Library. 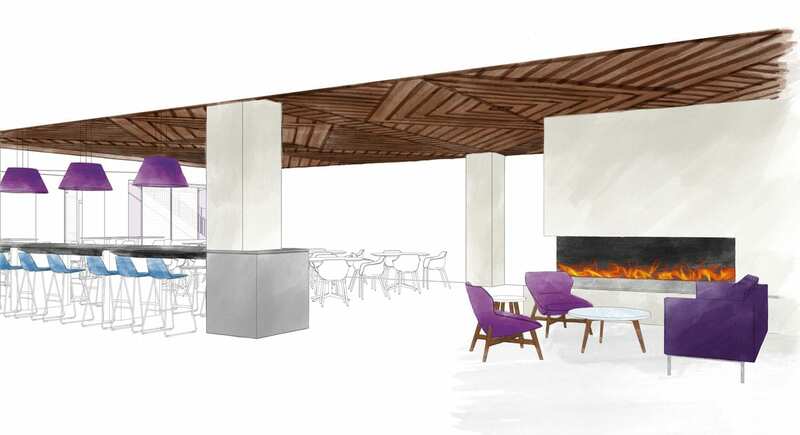 Visitors will be able to choose from a variety of settings in which to enjoy a meal or a cup of coffee, including comfortable lounge chairs situated around a large two-sided fireplace, a feature frequently requested by students. We look forward to sharing more photos as these spaces come to life. If you have questions about the planned space, ask them in the comments section. 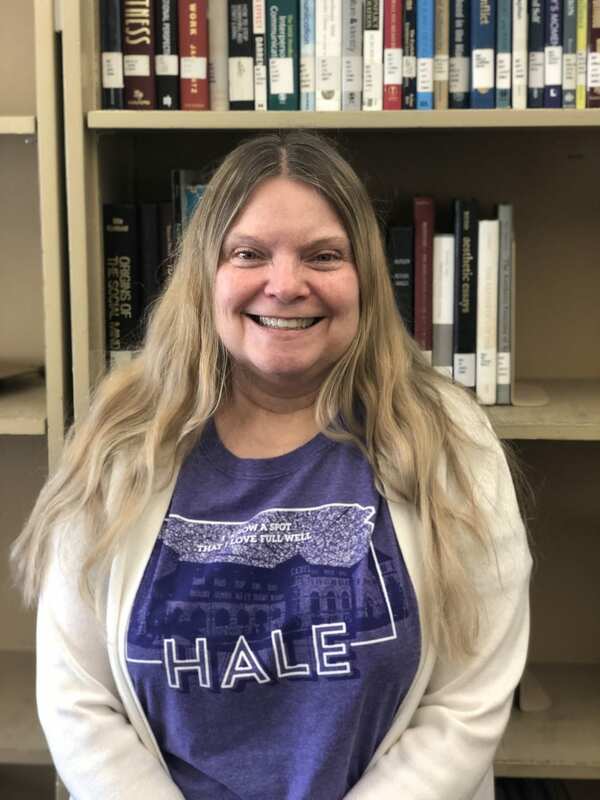 And if you’d like to help make the future of Hale Library a reality, visit our Help for Hale webpage or contact Chris Spooner, KSU Foundation Associate Vice President of Development Programs, at 785-775-2130 or chriss@ksufoundation.org. The walls came tumbling down on Hale Library’s first floor last week! We have even more great shots of the demolition and the dramatic progress going on behind that purple construction fence. A light in the old vending machine alcove shines through a newly created opening in that space’s north wall. The wall at left featuring a large bank of windows blocked off the sunflower entryway from the rest of the first floor. 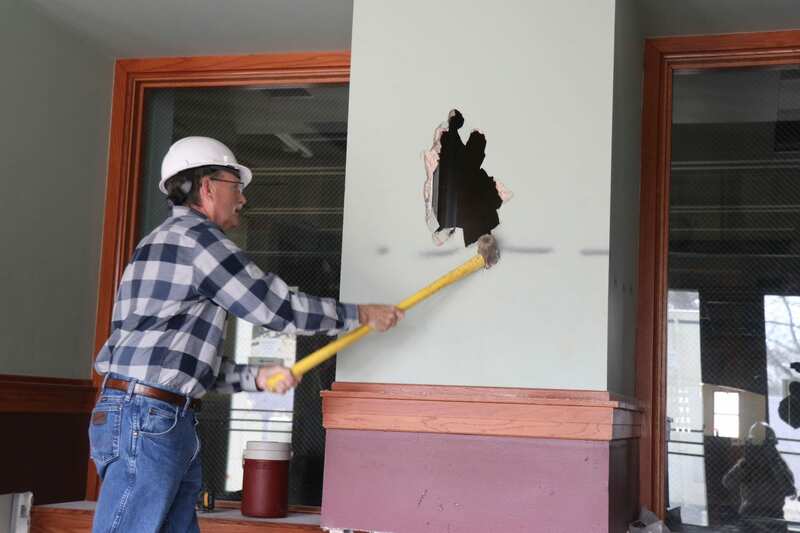 Associate Dean Mike Haddock did his best Wreck-It Ralph impersonation on the wall that separated the sunflower entrance from the rest of the first floor. 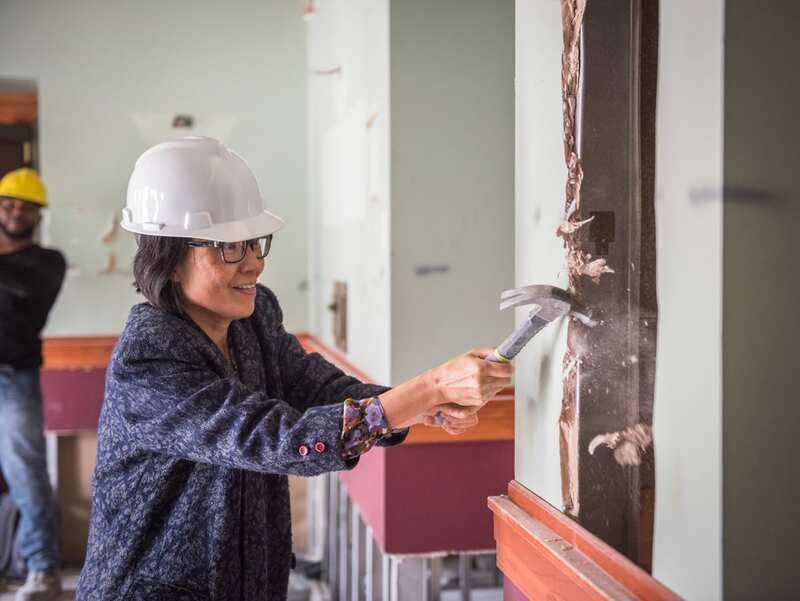 Associate Dean Sheila Yeh takes a whack at the wall. 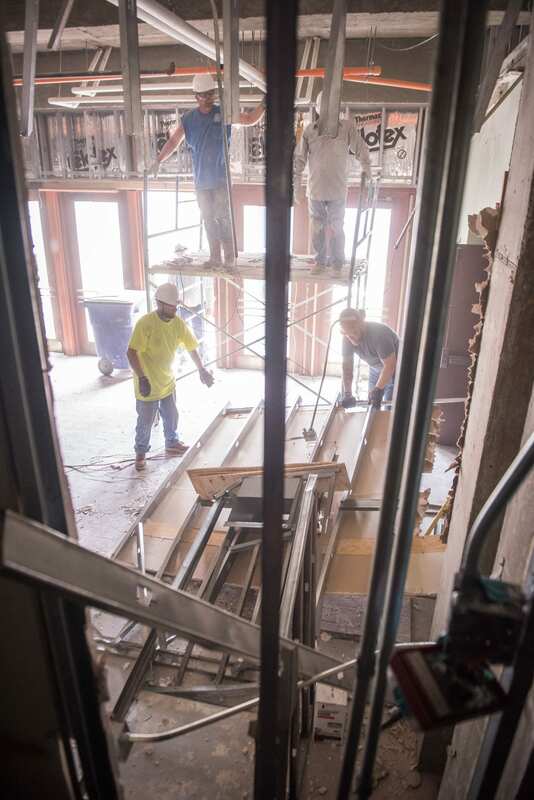 Construction workers lower a large section of drywall and metal framing to the ground after creating an opening between the sunflower entrance doors and the rest of the first floor. A construction worker throws a section of metal framing on a pile of debris. They are recycling all of the materials that they can. Two construction workers wheel out a window pane that allowed visitors at the sunflower entrance to look into the first floor but prevented them from walking into the space. As of this week, the entire wall is gone and the sunflower entrance opens directly into the first floor. 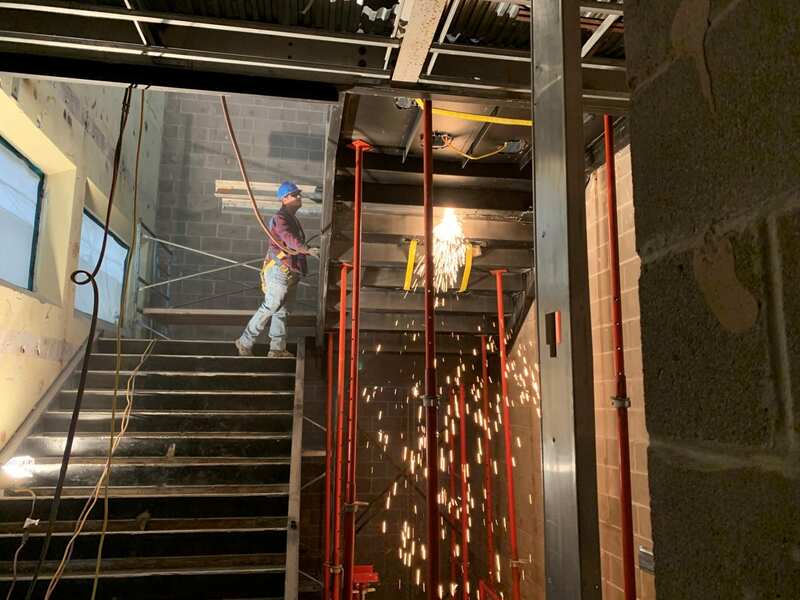 This will be the main entryway for the Dave & Ellie Everitt Learning Commons, which will open fall 2019. A view of the sunflower entrance from inside the first floor. 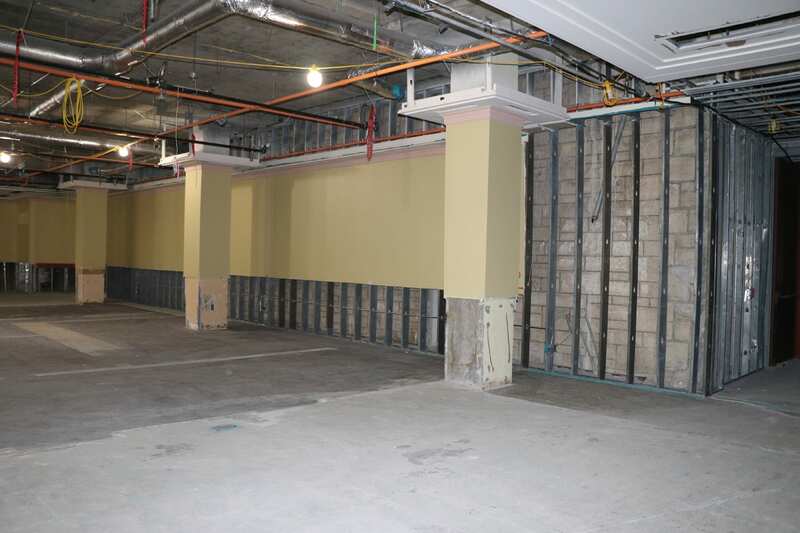 Note that the alcove where the vending machines were has also been removed. 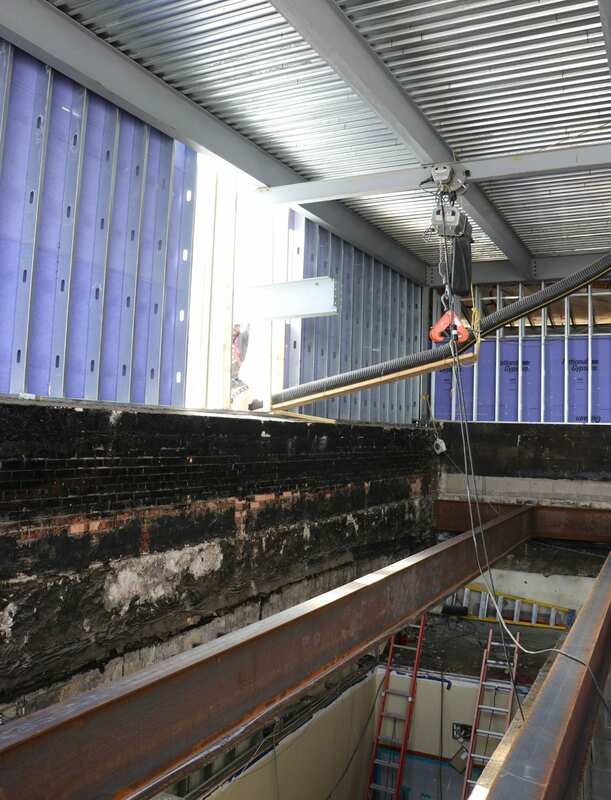 A construction worker uses a remote-controlled mini excavator to pull down duct work in front of the first floor elevators. The entire first floor has been opened up, and the walls that separated Einstein Bros. Bagels from the rest of the space are gone. A new cafe area named for the Hale Family will be constructed closer to the Learning Commons entrance. 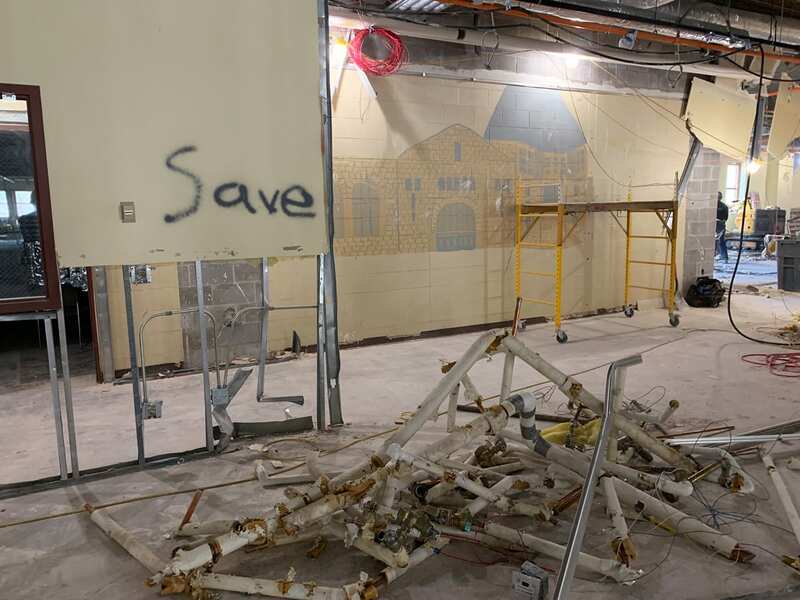 When crews removed drywall from a wall behind the first floor librarian offices, they discovered a mural of Hale Library painted on the concrete block. As the space opens up, we can more clearly envision what the Dave & Ellie Everitt Learning Commons will look like. Stay tuned! 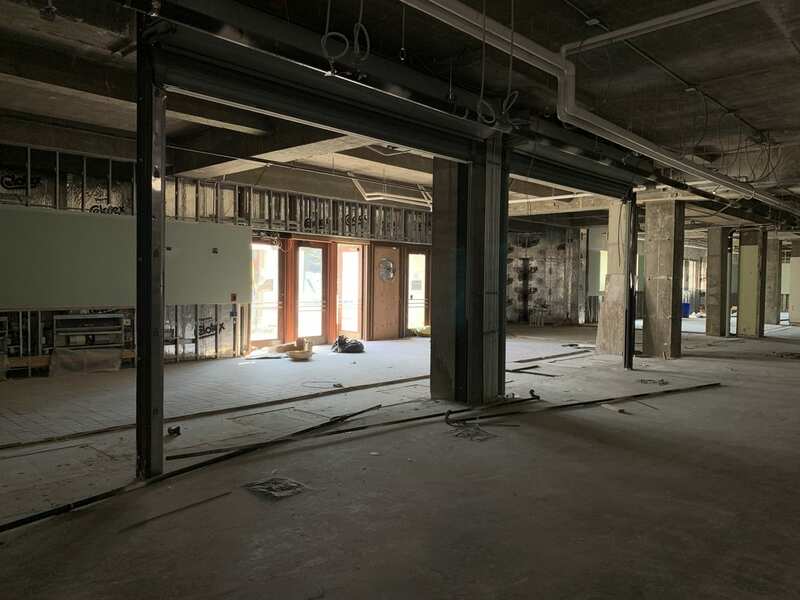 Next week we’ll share drawings from the architects at PGAV so you, too, can get a glimpse of Hale Library’s first floor in its fall 2019 state! 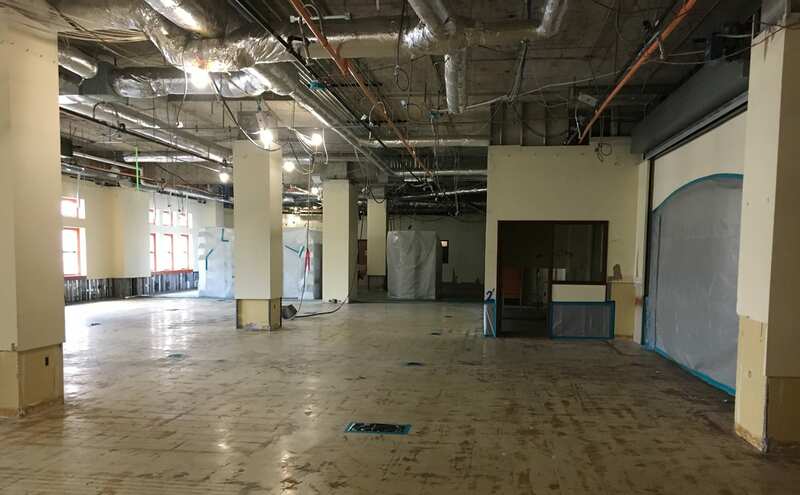 Demolition and construction are in full swing in Hale Library! 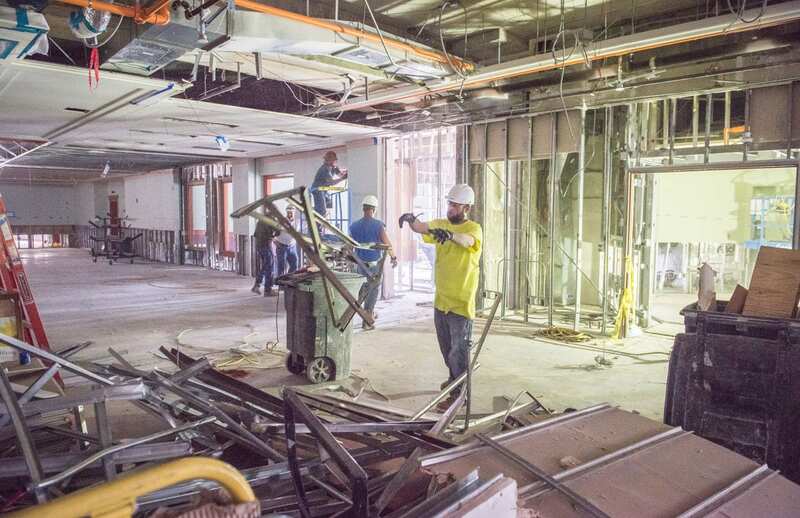 When we visited on Monday, March 26, more than 60 workers swarmed through the building. 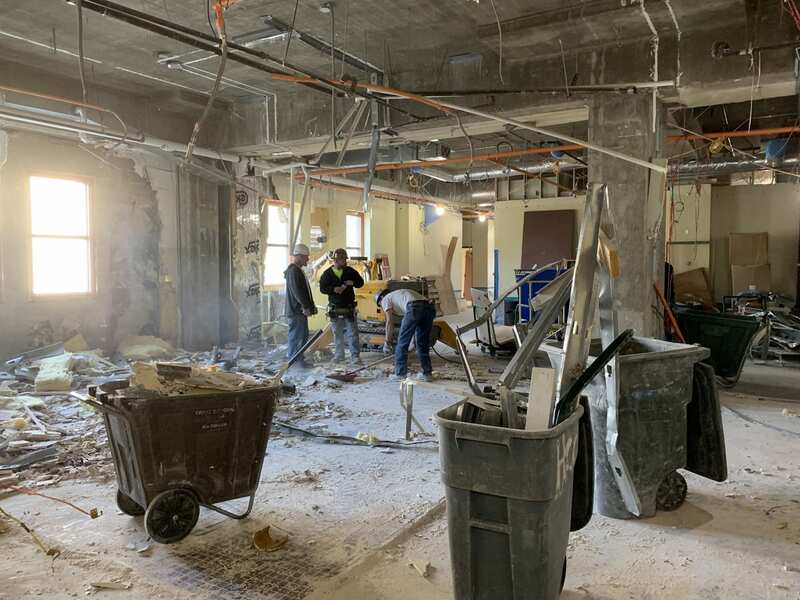 On the first floor, they were stripping out drywall and tearing down walls in preparation for the creation of the Dave & Ellie Everitt Learning Commons, opening Fall 2019. One feature of the Learning Commons? Improved access! 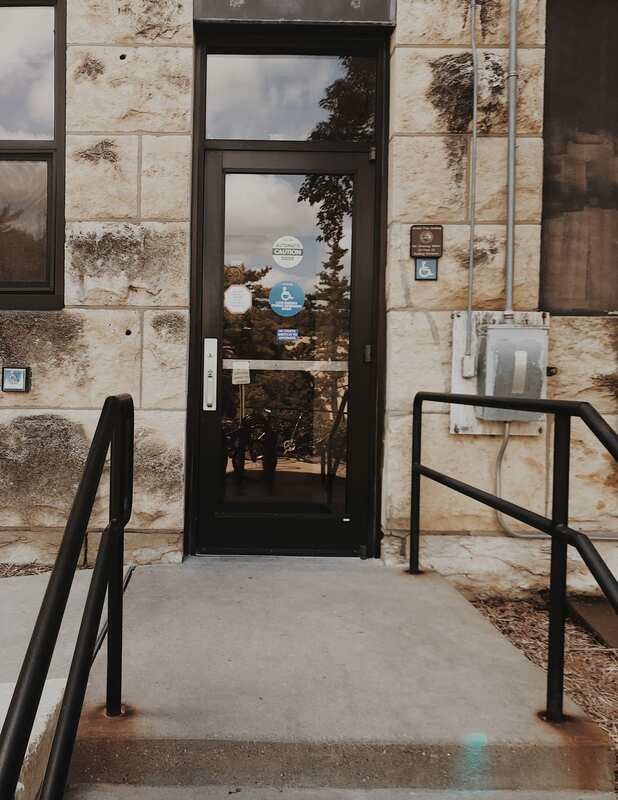 If you’ve visited Hale Library, you know it has two exterior entrances: One at the end of a long ramp that originates at the southwest corner and one at the opposite end of the building near Mid-Campus Drive. The latter is called the sunflower entrance because of the wrought-iron sunflower sculpture above its doors. Previously, when a visitor used the sunflower entrance, they came inside and encountered a wall of windows that blocked their access to the first floor. Instead, they had to climb the stairs or take an elevator to the second floor in order to enter through the main gates. Another trip down the stairs or the elevator was required to get back down to the first floor. 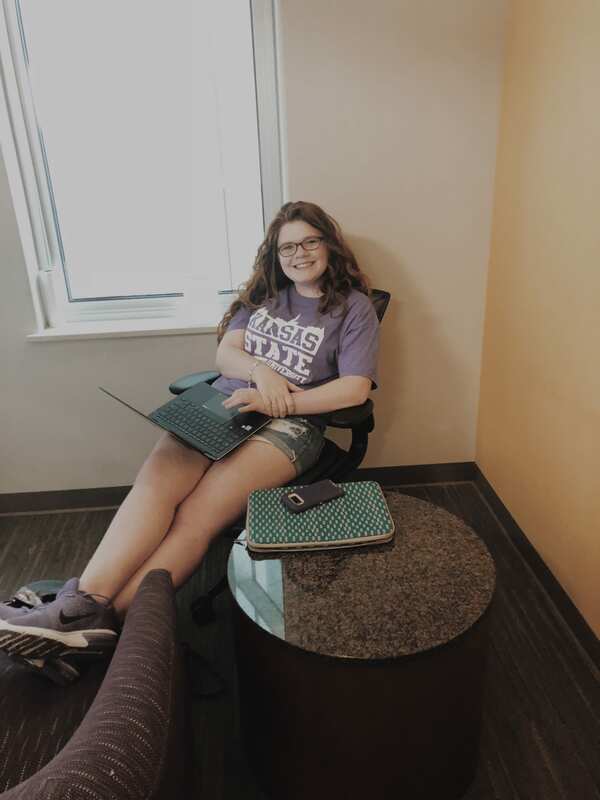 Unsurprisingly, this configuration baffled Hale Library’s visitors and first-time users (and frankly, even K-Staters who have been around for awhile). 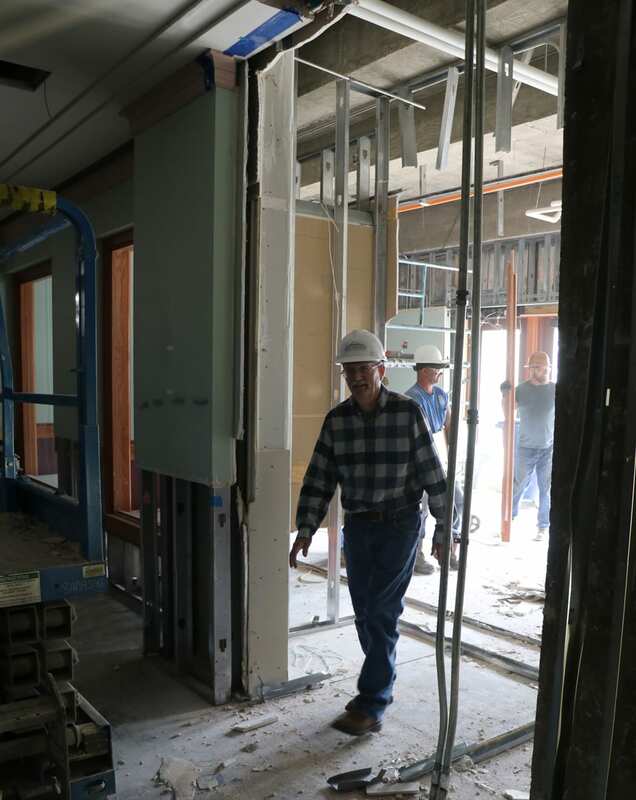 Associate Dean Mike Haddock takes a swing at the wall that separated the sunflower entrance from the first floor. But no more! This week, the wall came down. 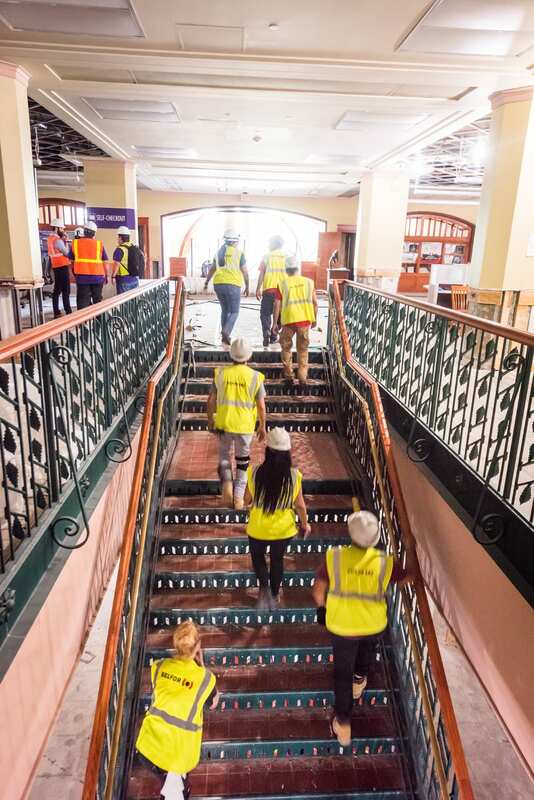 When Hale Library’s first floor reopens in fall 2019, visitors will walk through the sunflower entrance directly into the Dave & Ellie Everitt Learning Commons on Hale Library’s first floor. That’s one small step for Associate Dean Haddock, one giant leap for future visitors to the Dave & Ellie Everitt Learning Commons! Haddock enters the first floor through the opening created during demolition. 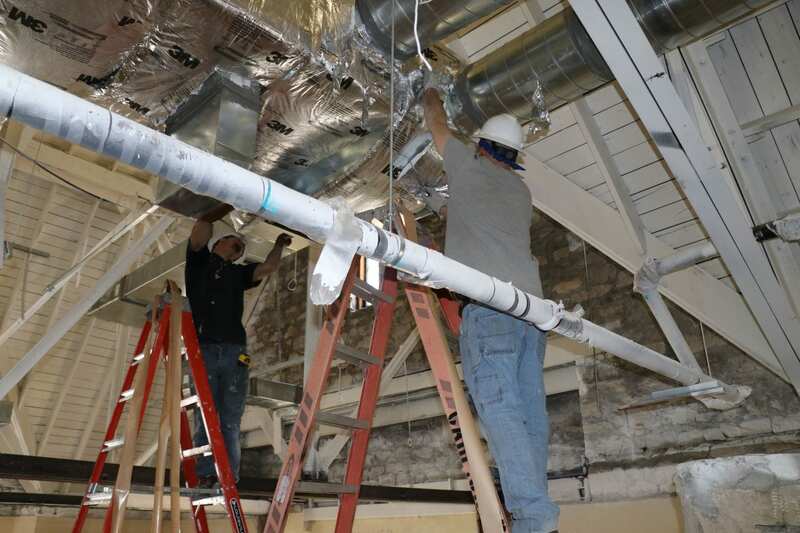 Meanwhile, on the third floor, workers are installing new duct work in the Great Room ceiling. 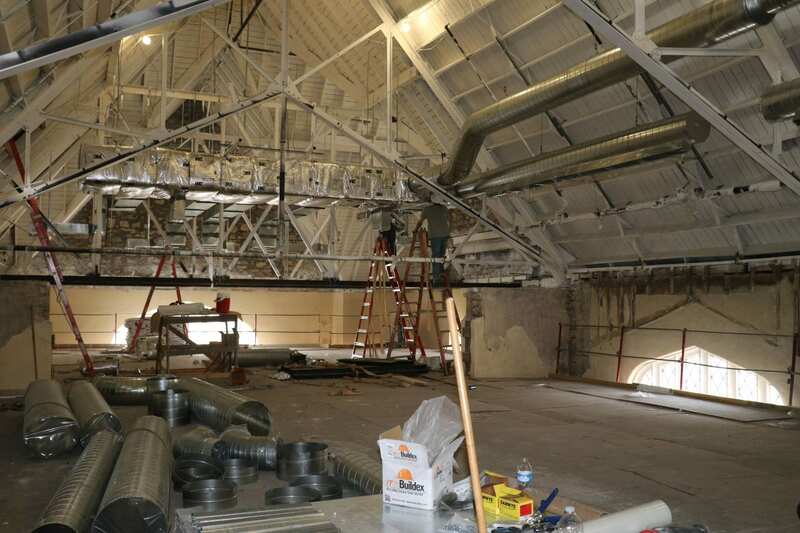 The new duct work will improve ventilation and heating and cooling throughout the oldest parts of the building. 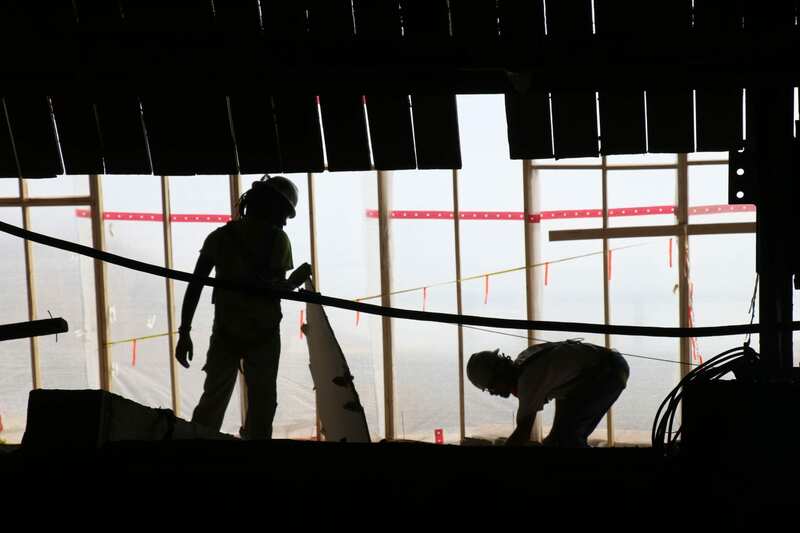 Workers wrap insulation around new duct work in the Great Room. 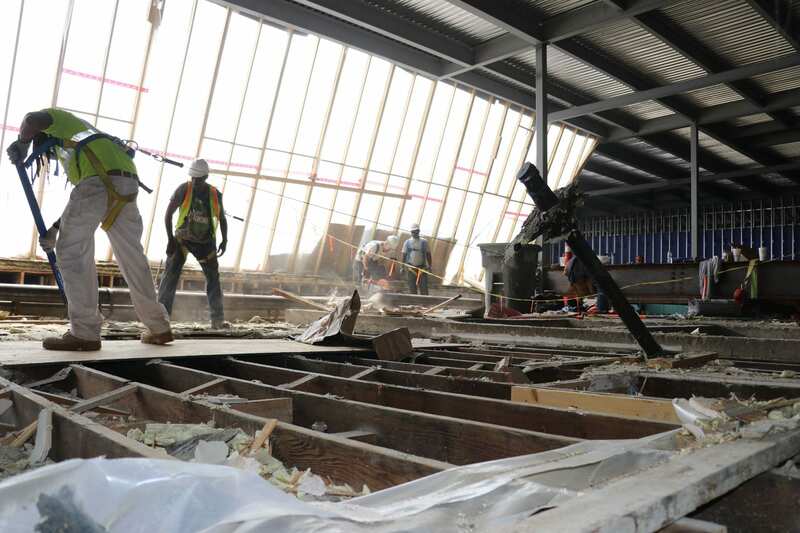 A crew removes debris in the attic space immediately south of the Great Room, just above the Academic Learning Center. Outside, on the north side of the building, scaffolding is going up in preparation for an imminent roofing project. 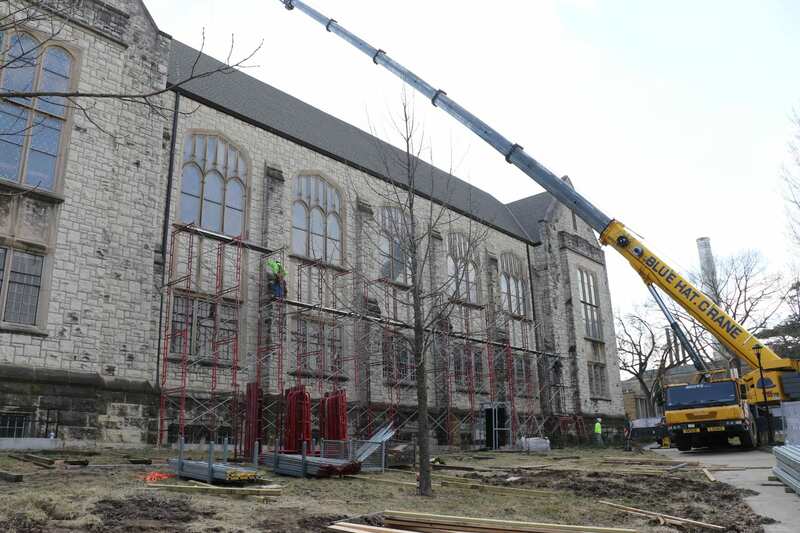 A crane is parked nearby on the south edge of the quad. 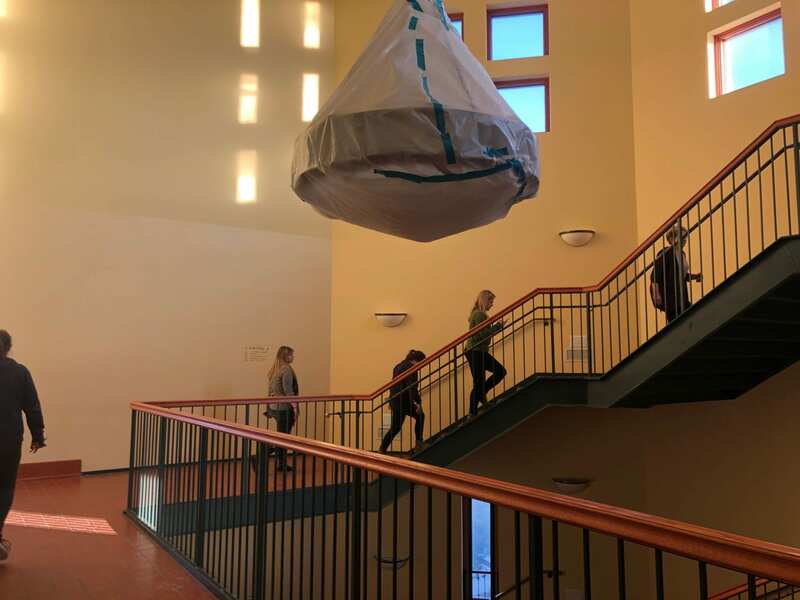 It is maneuvering steel beams from the roof into a space above the fourth floor Academic Learning Center where the fire started. The north side of Historic Farrell Library (the 1927 section of the Hale Library building). 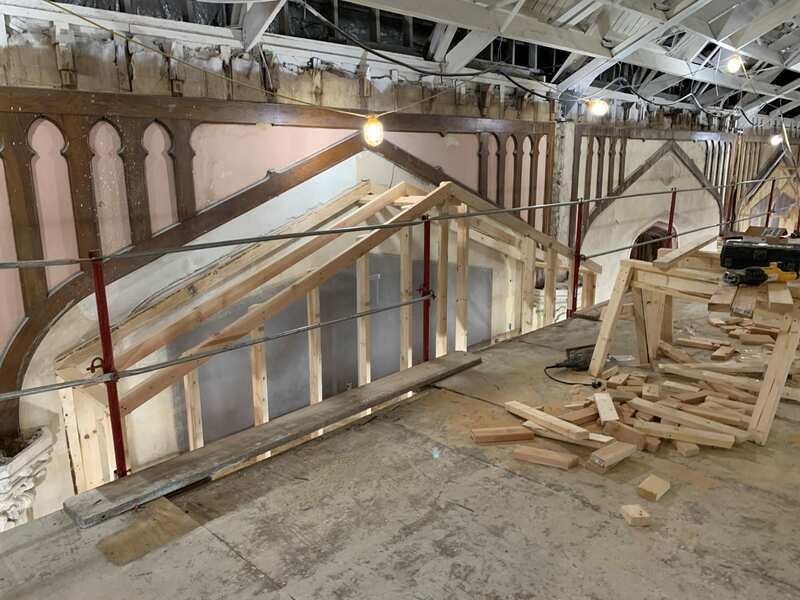 The crane extends over Historic Farrell Library’s roof and moves the beams through a gap in the penthouse wall, which is below and to the right of the crane’s lifting hook. 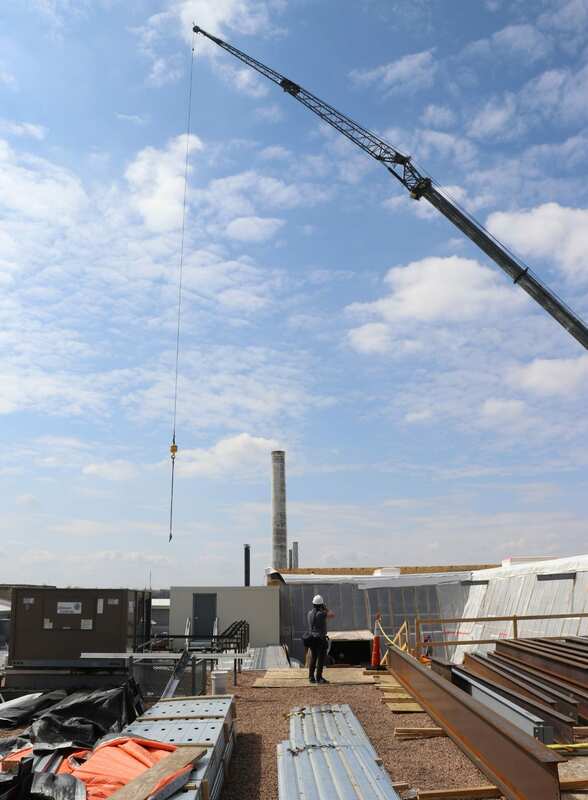 Since the crane operator on the ground can’t see over the building, the workers rely on communication via wireless radio to complete every step of the process. 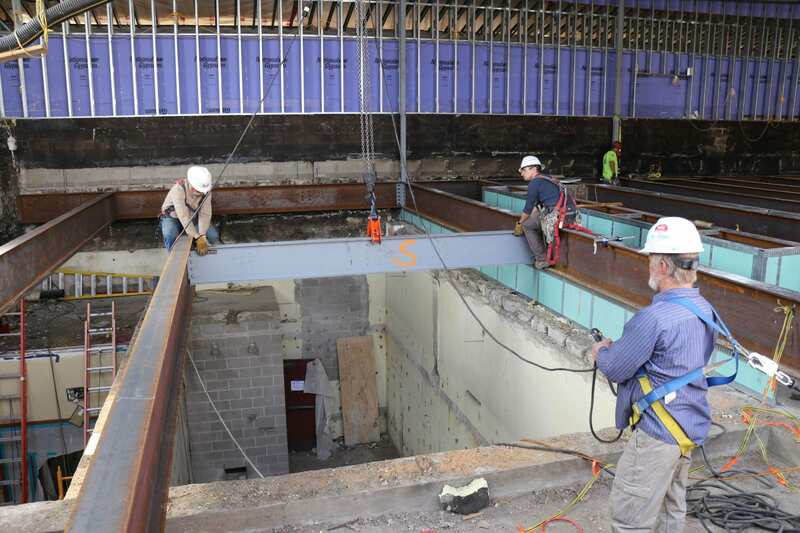 A worker on Hale Library’s roof guides a steel beam into the penthouse and onto a winch system in the ceiling that moves the beam into place. Two steelworkers position the beam. Most of the walls are black from years of roofing tar, but in this photo, the wall behind the worker in the florescent yellow shirt was also blackened by the fire. Associate Deans Sheila Yeh and Mike Haddock look on. From the outside, Hale Library appears quiet and empty. On the inside, it’s a different scene entirely. We look forward to bringing you more construction updates in the coming weeks. Two workers clean debris from the attic space adjacent to the Great Room. Award season continues! If they created an all-team Big 12 librarian category, these would be our contenders: They’ve all been nominated for the Brice G. Hobrock Distinguished Faculty Award. The Hobrock Award was established by the Friends of K-State Libraries to honor Dean Emeritus Hobrock upon his retirement in 2004. 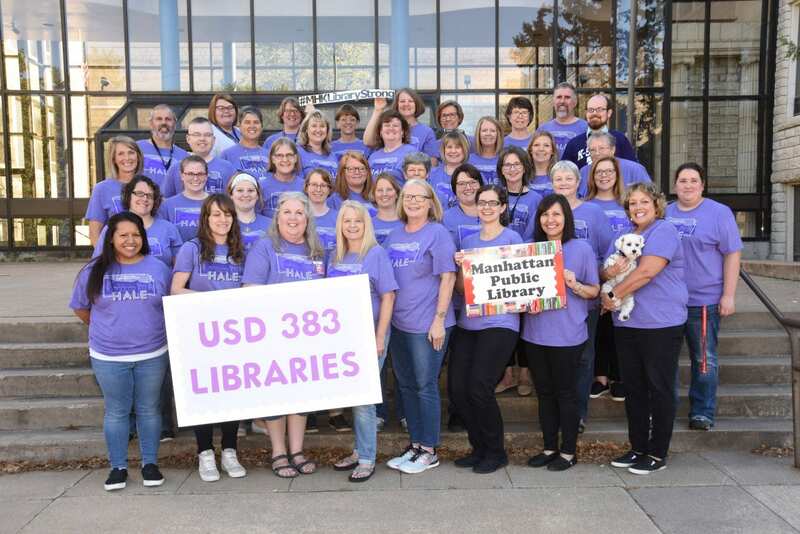 Annually, the award recognizes outstanding librarianship and superior accomplishments among the K-State Libraries faculty. Nominees are evaluated based on their professional activities during the last two years. One recipient is honored with a plaque of recognition and an award of $1,000. 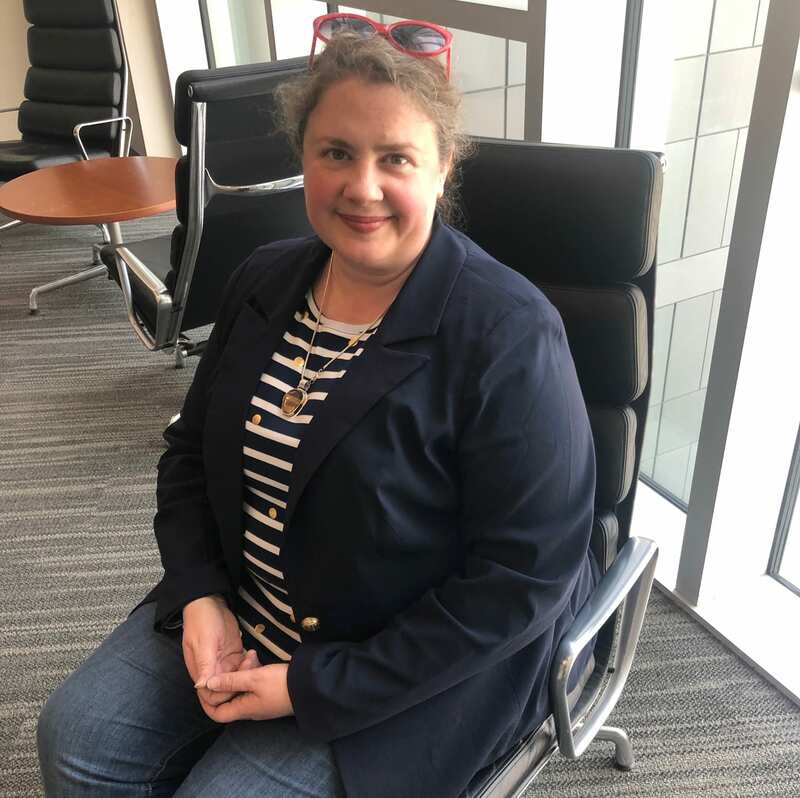 Jo Crawford was nominated for her dedication to securing the best possible journal prices in the face of increasingly difficult economic conditions. Collection development librarians oversee purchases and subscriptions, deaccession underused materials and make other strategic decisions regarding how the Libraries spends their acquisitions dollars. Jo, who currently focuses on science materials, has worked in this challenging field since 2011. The Libraries currently spend about $5 million each year on subscriptions to electronic databases and journals. However, publishers have been raising their prices for years. 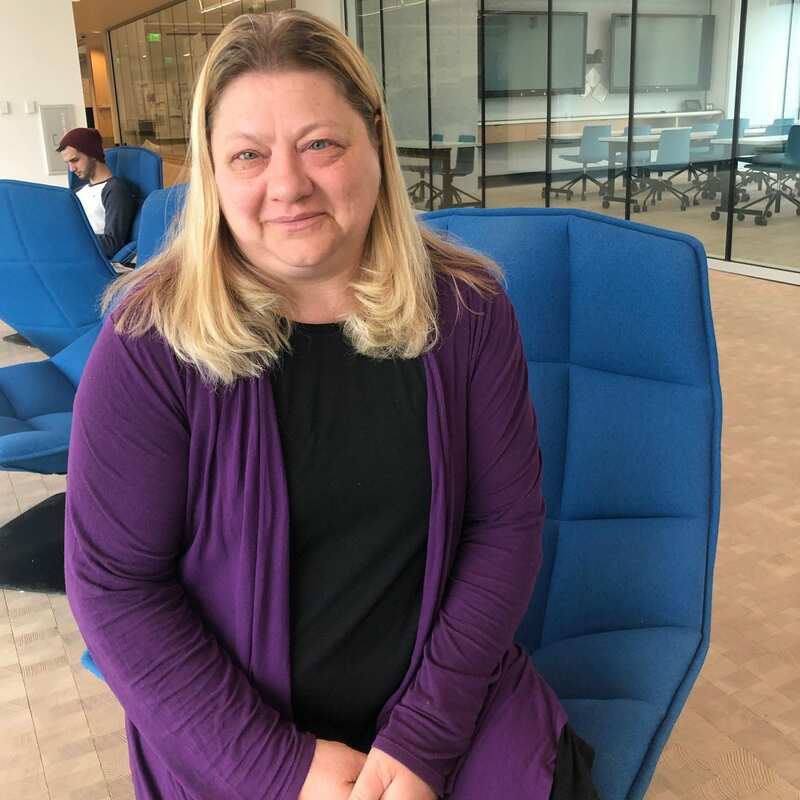 Jo’s nominator noted that she has been a dedicated employee, working long hours in Hale Library to find the best prices possible in order to get the materials our researchers need, even in the face of inexorable subscription increases. Casey Hoeve, associate professor, was nominated for outstanding scholarship and leadership. 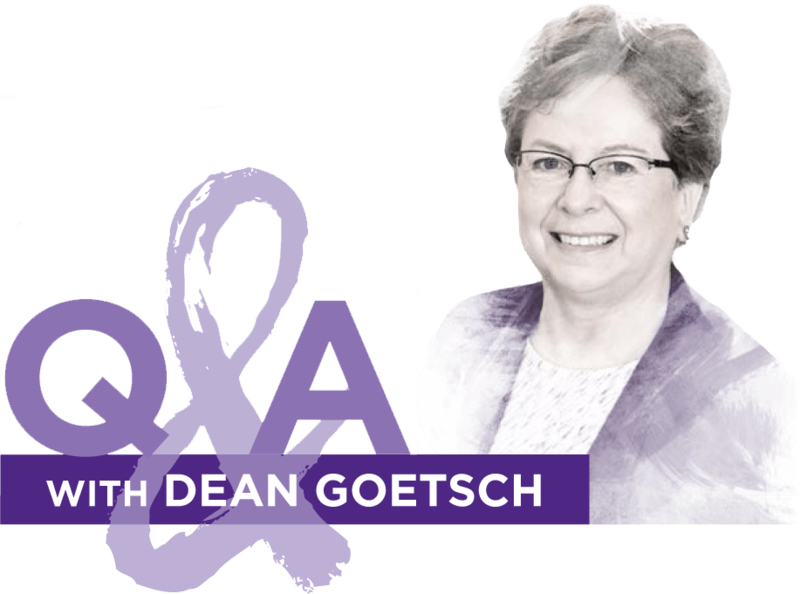 Like other K-State faculty members, our librarians conduct research, write journal articles and books, and present and lead committees for professional associations in their field of study. Char Simser, professor, was nominated for professional excellence and patient mentorship. 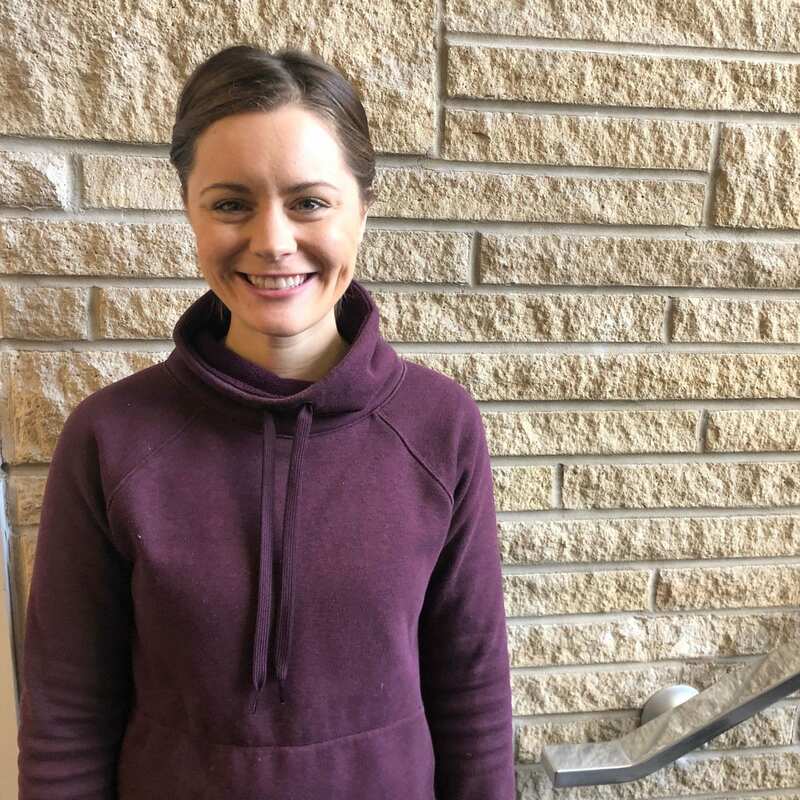 Char, coordinator of electronic publishing, works hand-in-hand with the editors who create their online scholarly journals through K-State Libraries’ online open access publisher, New Prairie Press. There is a significant amount of setup work associated with creating a new journal, and Char has helped dozens of organizations navigate that process. Ellen Urton, associate professor, was nominated for outstanding contributions in support of faculty teaching. Not all students come to K-State prepared to conduct college-level research. Academic librarians address that challenge by teaching research skills in classrooms across campus. 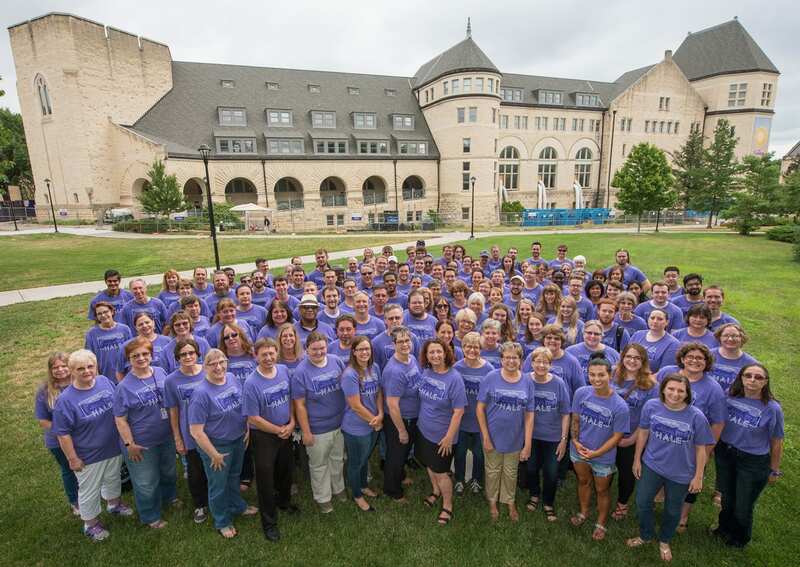 In fact, K-State’s librarians often collaborate with other faculty members and become co-teachers or research partners. The winners will be announced at the All-Staff Recognition Ceremony on Wednesday, March 27. Congratulations to the nominees! Sometimes, you have to strip away the old before you can build the new. 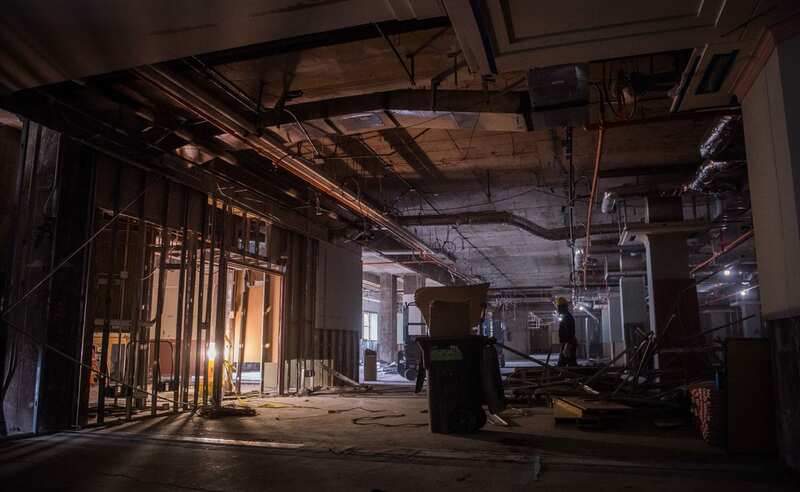 That’s our theme this week, as we bring you dramatic photos of the latest demolition and construction in Hale Library. To help give you a sense of the site of our first photos, the jagged red spot above marks the location of the fire. 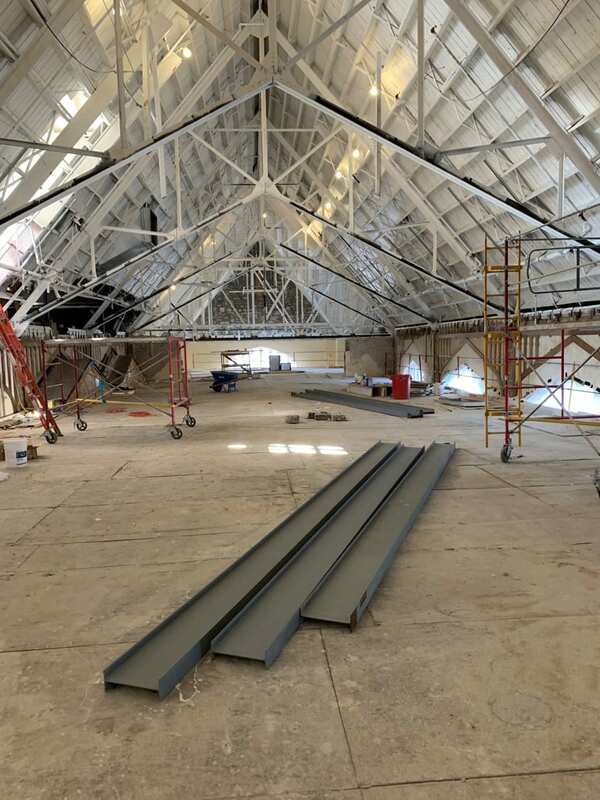 Today, if you enter Historic Farrell Library’s third floor and stand on the false floor built on top of the scaffolding that fills the Great Room, like Associate Dean Mike Haddock did recently, you can see that spot. 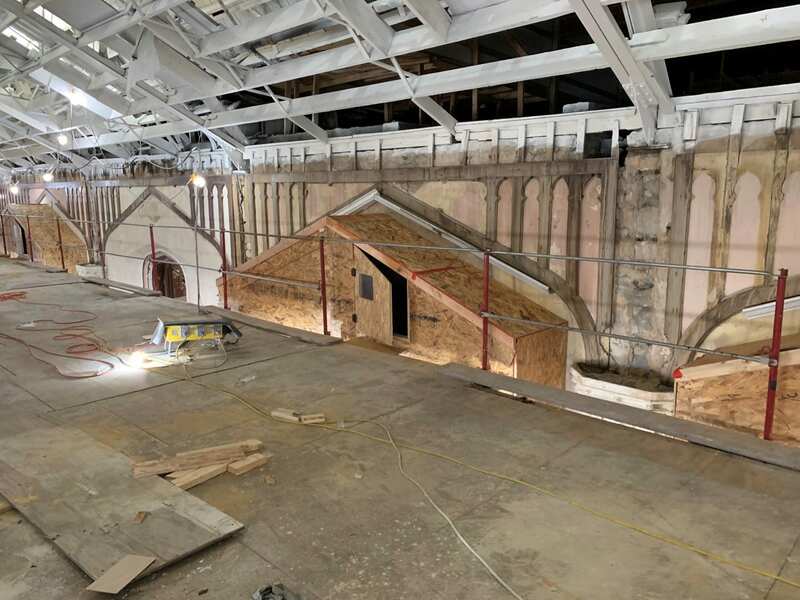 The Great Room murals are covered by the plywood boxes with peaked roofs, which you see in the photo above. The attic space where the fire burned is directly above and behind them. Up close, you can see that the debris has been cleared away. Through the holes in the attic floor you look down into the Academic Learning Center (ALC) where the student athletes met for study tables. ALC staff members were the ones who first smelled the smoke, even before the fire alarms went off. 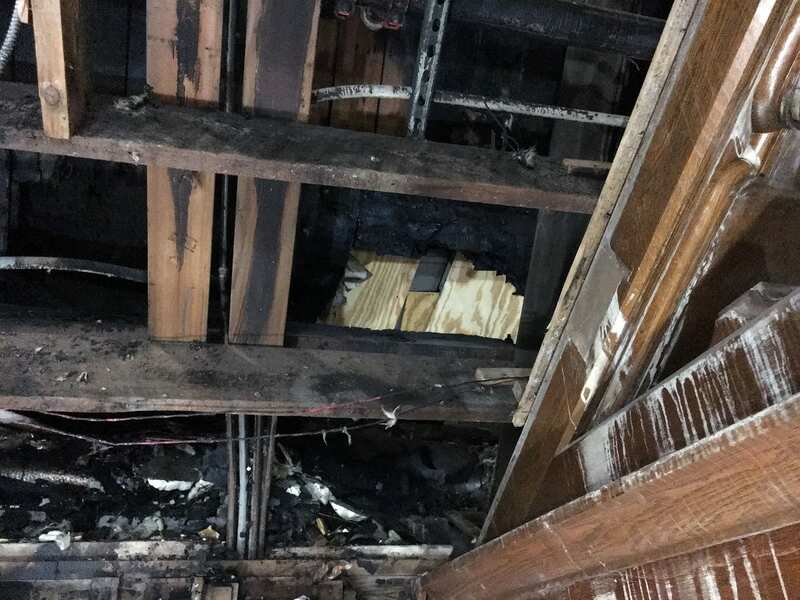 While the charred walls are a clear mark of the destruction, this also serves to illustrate that the actual fire was contained to one location. The vast majority of the damage was from smoke and water. But enough destruction for today’s post. How about some demolition? In Hale Library as we knew it, there were a lot of stairwells–many of them in tucked-away corners of the building that weren’t highly trafficked. 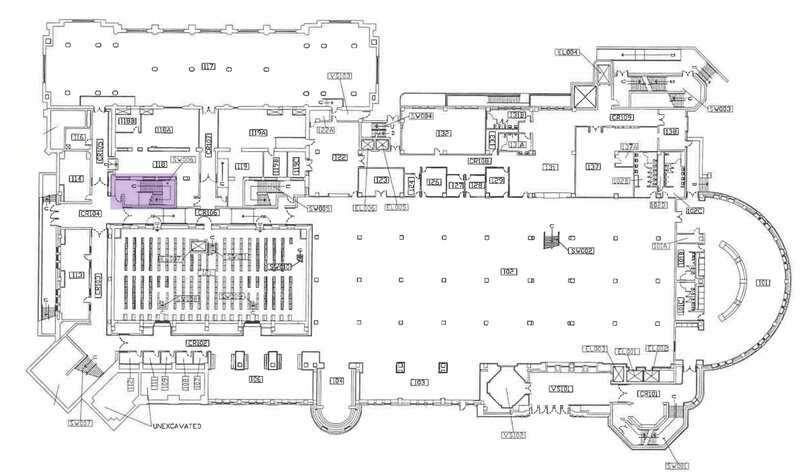 They took up prime real estate, so in our renovation, we’re reclaiming the stairway highlighted in purple above. Before we can renovate, though, it has to be demolished. It might not look very innovative right now, but workers have jack-hammered away concrete to clear away space for the Innovation Center on Hale Library’s first and second floors. 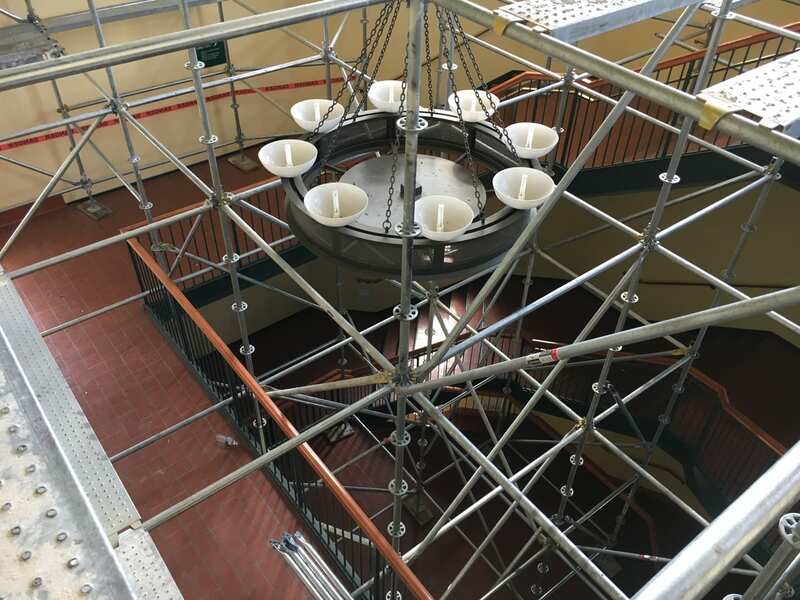 After the concrete was hauled out, crews used blowtorches to disassemble the frames of the metal staircases. 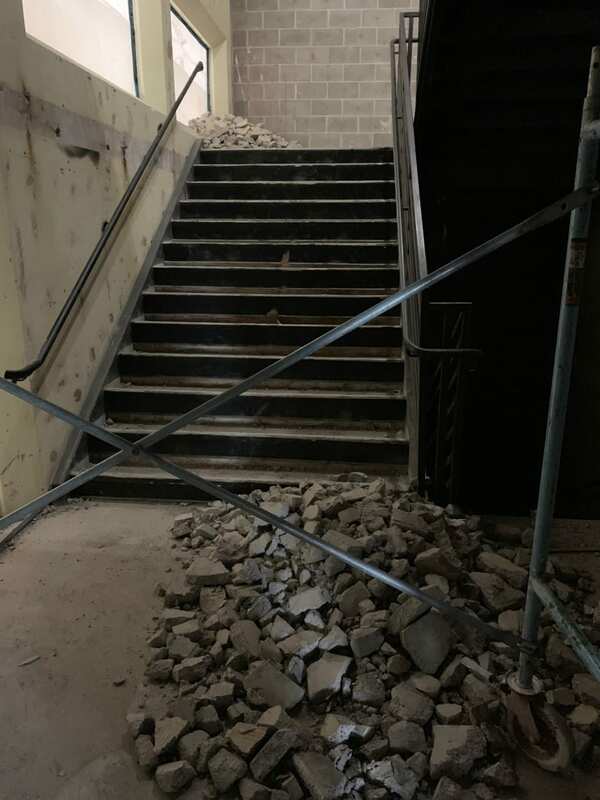 Here you can see that the demolition has cleared out the stairs between third and fourth floor. As of today, that entire stairwell has been emptied. Progress! In the Innovation Center, users will generate virtual reality experiences through 360-degree video or 3-D animation. 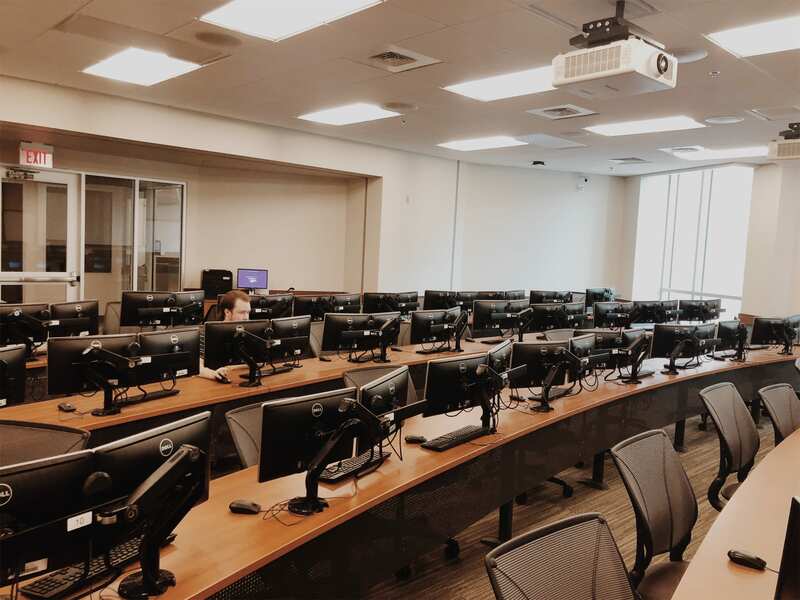 They will create artificial intelligence, edit audio and video and learn to use state-of-the-art technology that is not readily available elsewhere on campus. through the building from the first floor up to the fourth. This is what Mike sees when he turns and faces east-north-east toward Willard Hall and Mid-Campus Drive. For most of us, the exciting part of construction comes when you get to look at the shiny, clean end product. 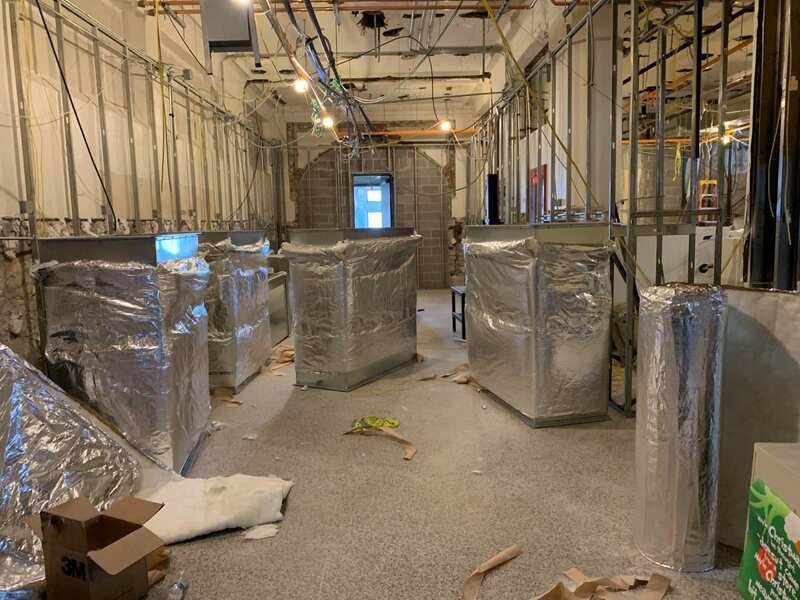 We’re not there yet, but there’s really important work going on now so that the new Hale Library’s infrastructure can support all of those shiny, clean new spaces, like the previously mentioned Innovation Center. Case in point regarding infrastructure: The steel beam over the doorway in the photo above is new reinforcement. 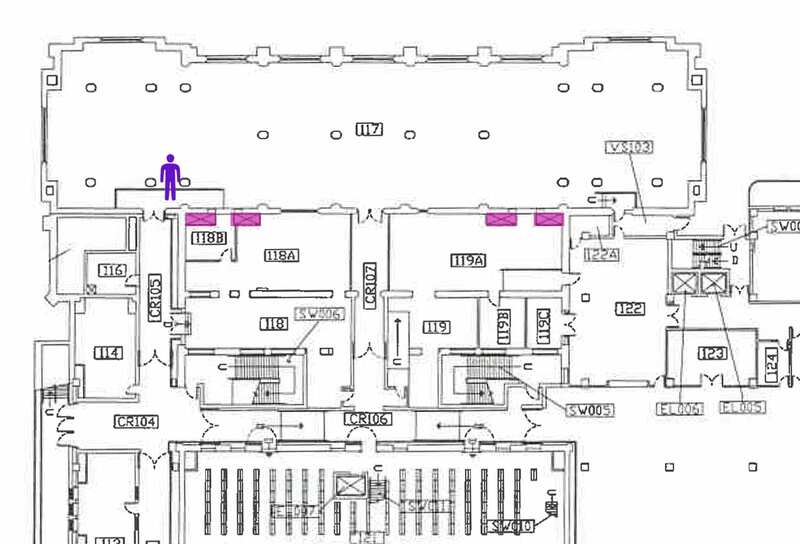 If we were to walk through that doorway, you’d find the chases that are highlighted in pink on the floor plan above. On second, third and fourth floors, guardrails have been built around those chases for safety, since they’re essentially like an open elevator shaft. 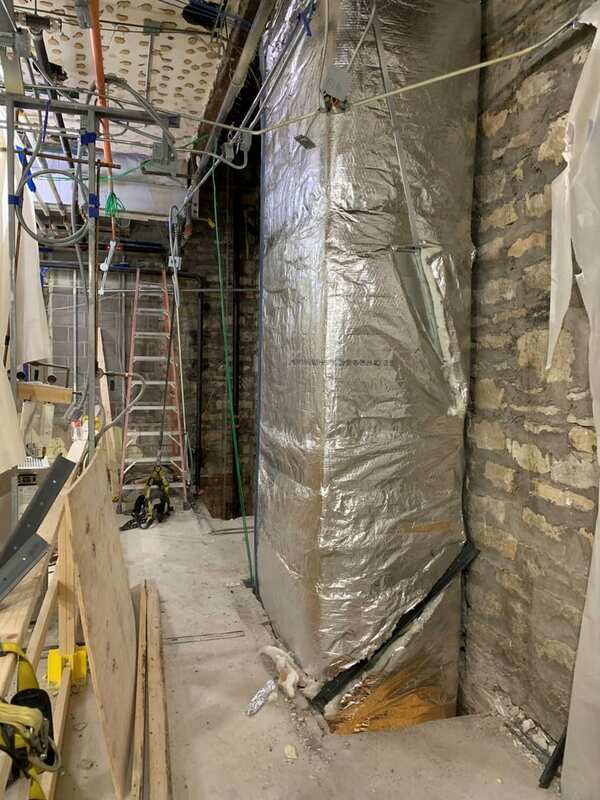 Over the last month, workers have been installing ductwork wrapped in insulation into those chases. The ductwork runs through the building from top to bottom. This is just some of the construction work on Hale Library’s infrastructure. With improvements like these in place, the building will have improved air quality and more efficient heating and cooling. Progress is happening. It’s not shiny and clean, but it’s important work that will take us one step forward to our new Hale Library. As always, if you have questions about the process, please comment on the blog post or contact us at libcomm@ksu.edu! To all of our student and faculty readers, happy spring break! We won’t be posting next week, but we’ll be back on March 19. 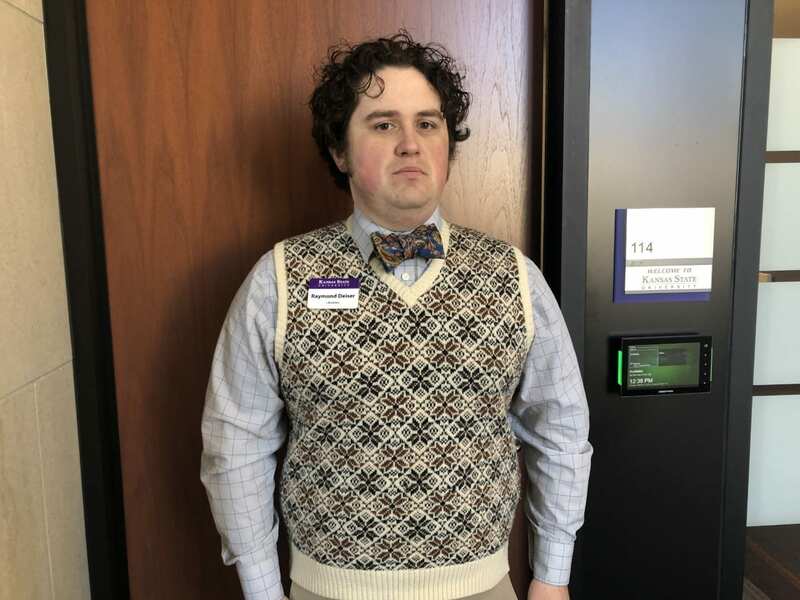 The K-State Libraries employee award ceremony on March 27, 2019, will be especially meaningful. We don’t often come together to recognize our peers’ hard work, both pre- and post-fire, since we’re spread out over a dozen different campus locations. The Dean’s Award is one of three employee awards that will be presented that afternoon. It’s given annually to a non-tenure track professional who has been with the Libraries for at least two years. Alice can resolve any and all technical questions about LibGuides, RefWorks and Canvas. Her depth of knowledge is amazing. Alice’s work on LibGuides makes it easier for us to keep them up-to-date and functioning smoothly. She responds to questions quickly and follows up in person to resolve any related issues. In addition, her initiative to add default LibGuides links to Canvas class sites is awesome. Her efforts make library resources much easier to find for students who may not take the initiative to proactively seek our help. A year ago, patrons were having a very difficult time with RefWorks citation records from a specific source. She dug into the problem and realized the metadata practices of the creator weren’t interfacing well with RefWorks. As a result, we were able to advise students and instructors in that field to be aware of the problem and follow up accordingly. 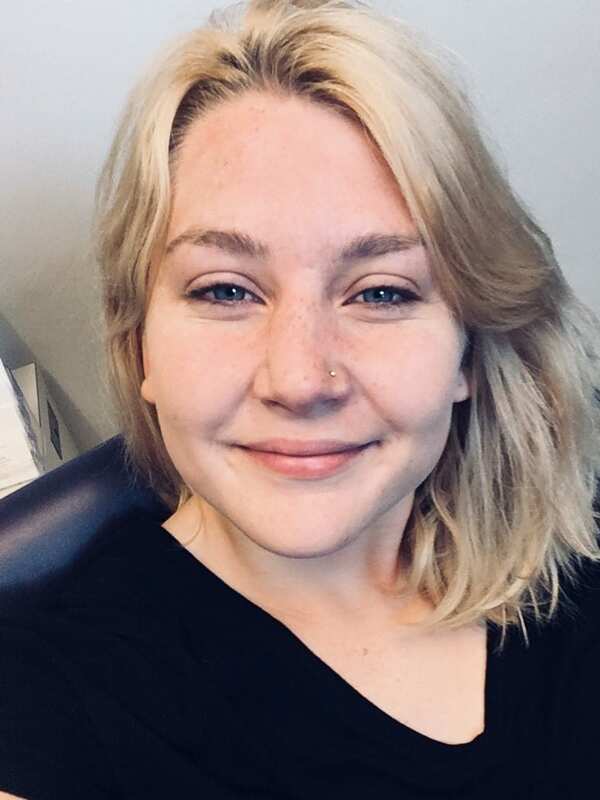 Allyssa oversees the hiring, training, scheduling, and evaluations for 12 student workers who collectively cover 77 hours of desk time per week. Her communication skills and her exceptional training program have been instrumental in the success of our services. 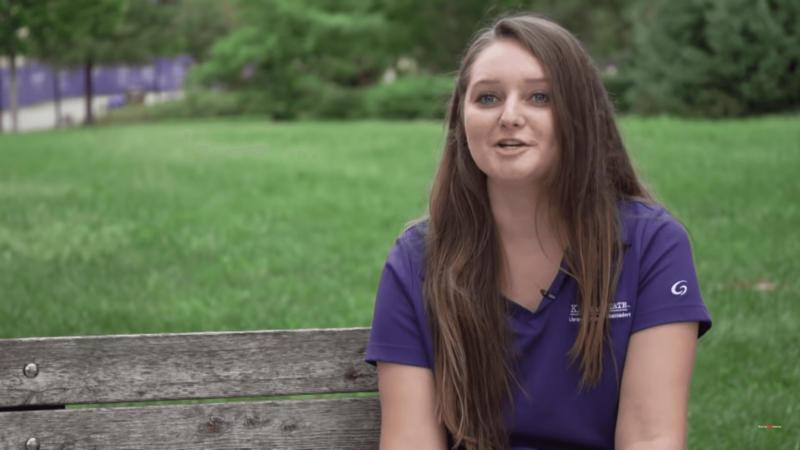 Last summer Allyssa worked to launch a Peer Research Consultant program to provide K-State students with access to one-on-one research help that funnels into the more advanced assistance offered by our Academic Services Librarians. Her work with the PRCs has transformed the ability and aspirations of the four students who became consultants. In addition, Allyssa is an outstanding writer, teacher, researcher, and leader. 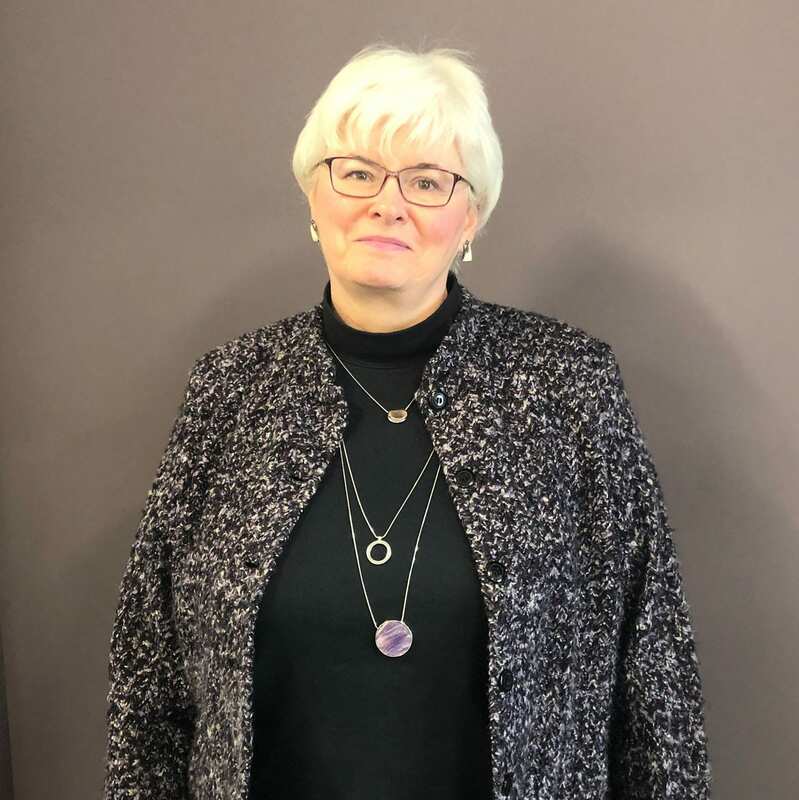 Her professionalism and high expectations for service quality have been instrumental to our ability to provide outstanding help to patrons throughout several migrations of our main service desk and changes in our staffing model. 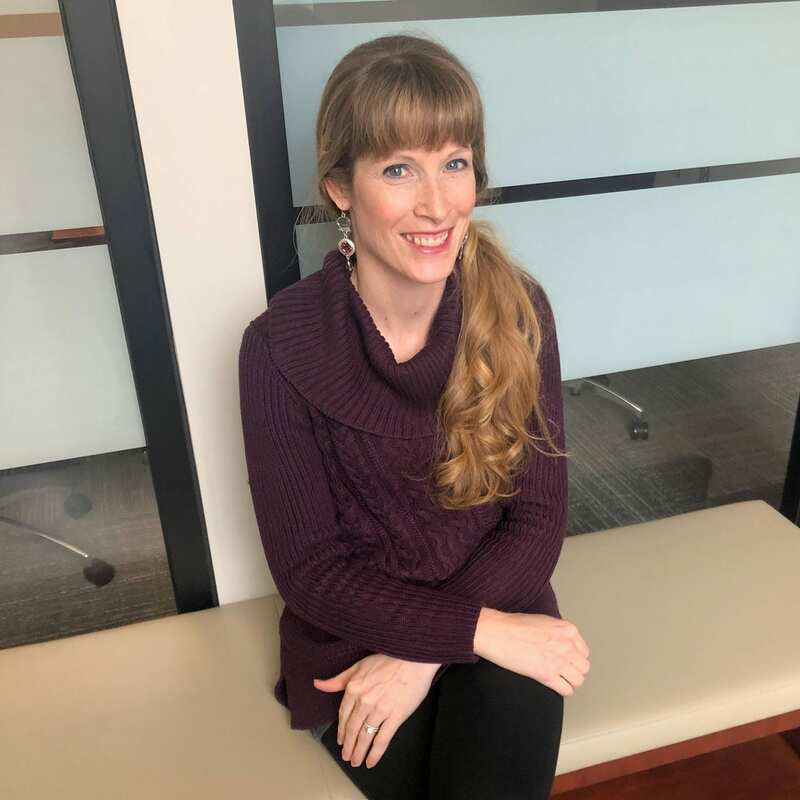 Kathy has been coordinator since spring 2018. 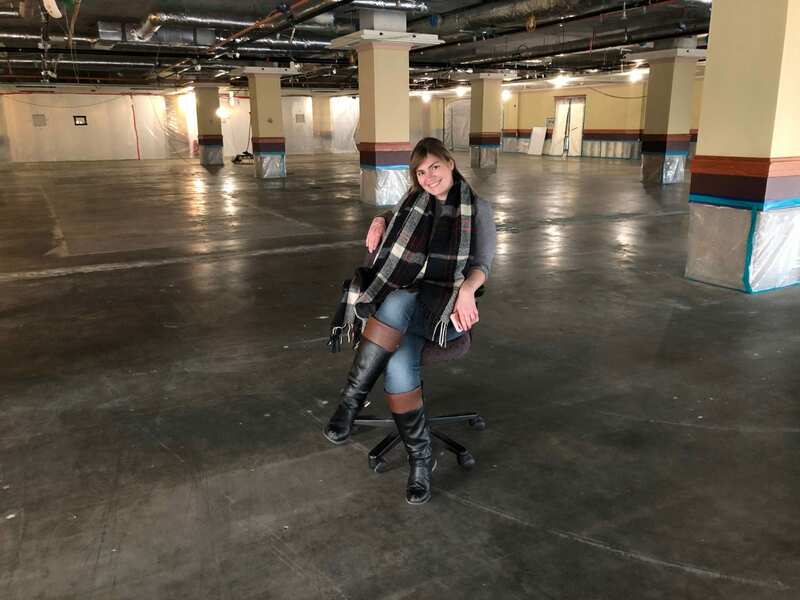 She worked hard to plan the unit’s move to a new office inside of hale library. A few short weeks after the move was complete, the fire changed everything. 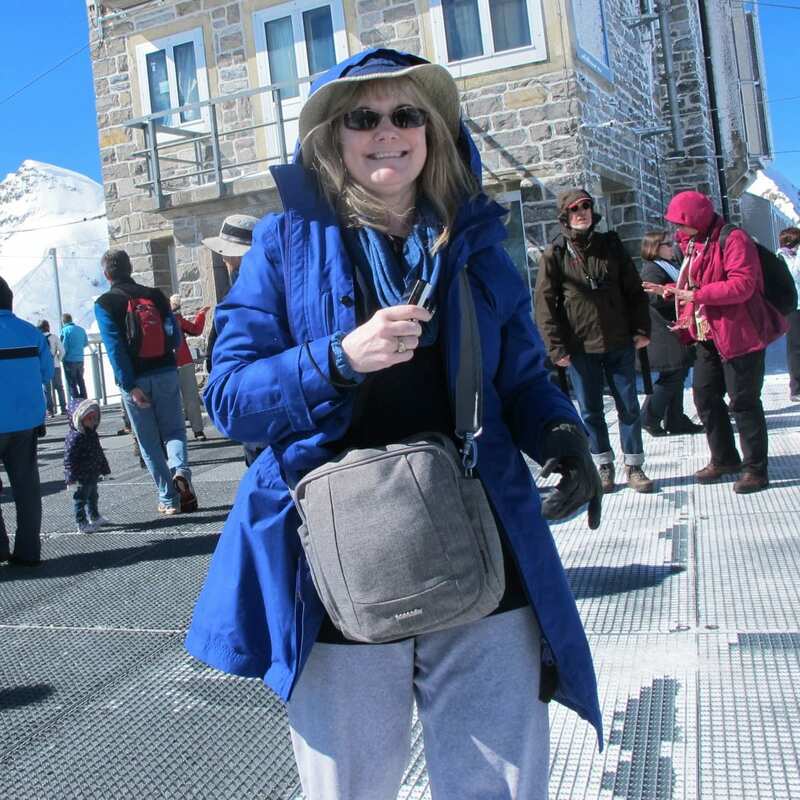 Kathy worked many late nights and on weekends to ensure that patrons would still be able to obtain the articles and books that were essential to their publications, teaching and grants. 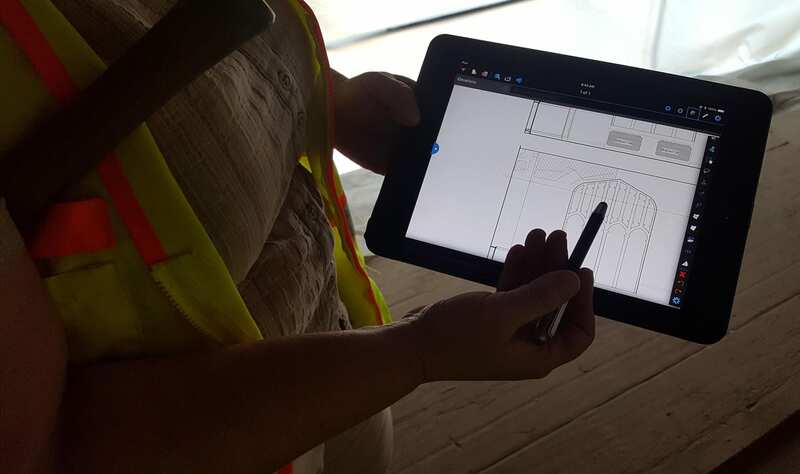 While managing constant changes in the aftermath of the fire, Kathy saw opportunity to improve the user experience. She modified request forms to provide users with control over which items would be delivered to which locations. 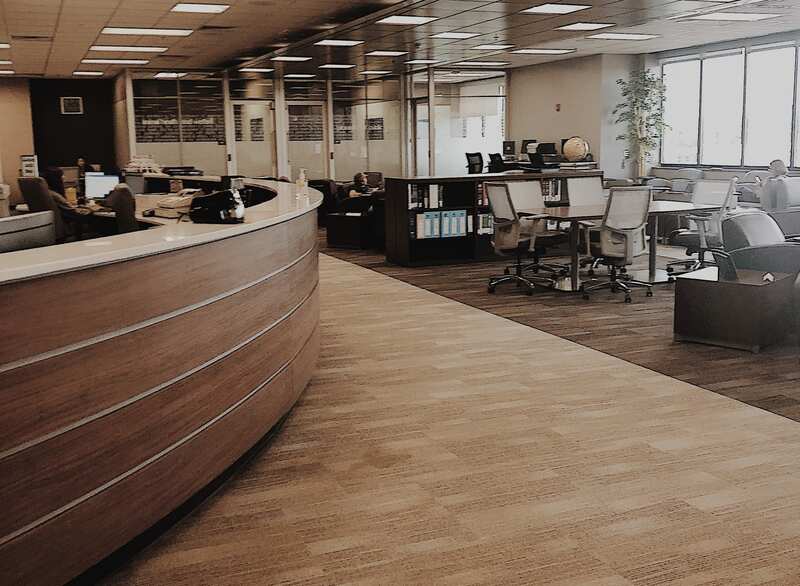 She and her team worked hard to keep up with demand; at the same time, she introduced enhancements such as a pilot project that delivered physical loans to department offices. 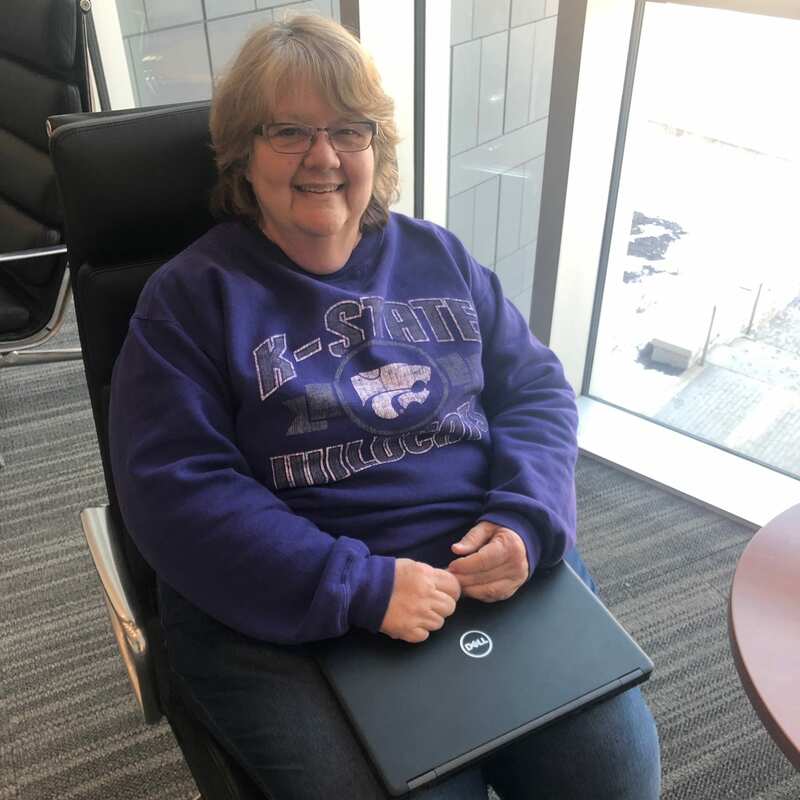 Kathy’s expertise, kindness, and strong work ethic are a major part of K-State Libraries’ success. After the fire, Renée worked tirelessly to keep everyone’s computer access up and running, which in turn allowed everyone to continue the critical tasks related to restoring library services. Imaging 125 machines in less than a day to get new computers up and running is a monumental task for any group… The amount of organization that it took to do that job within that timeframe is beyond most things I have ever witnessed. In addition, two full-time employees left at the same time this summer. Renée pushed forward with a group of student workers and prepared LIST for more change and the onboarding of two new full-time employees. When her new employees arrived, everything was ready for them. In short, Renée is the glue for the Library Information and Support for Technology (LIST) unit and invaluable to the Libraries as a whole. Tara is incredibly organized and productive. She’s also a reliable, patient coworker. She consistently produces creative, beautiful, effective designs. Sometimes projects shift and Tara has to scrap something she’s worked hard on and start from scratch, but she never misses a beat. She goes back to the drawing board and comes up with something even more amazing than her initial design. For example, the summer magazine was ready to go to press in late May. 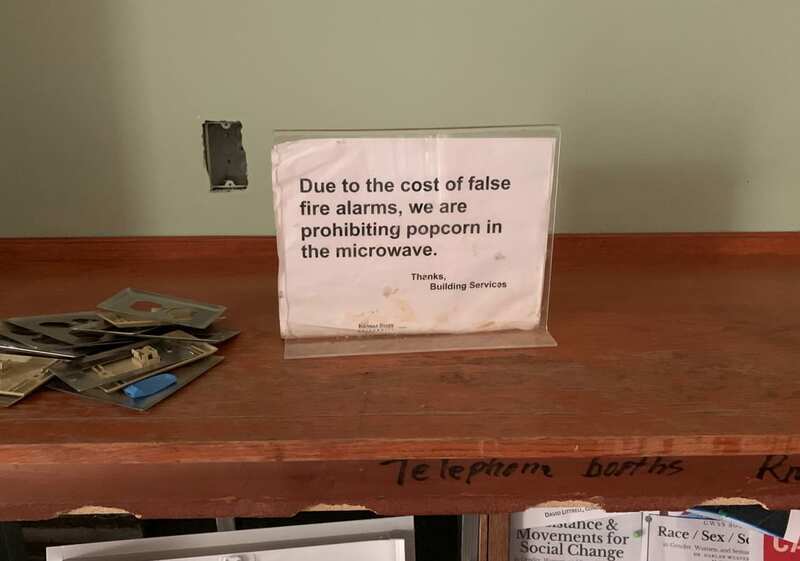 In fact, it would have been sent to the printer the week the fire happened. An entire completed issue had to be put on hold so we could create a new version that covered the fire and its aftermath. 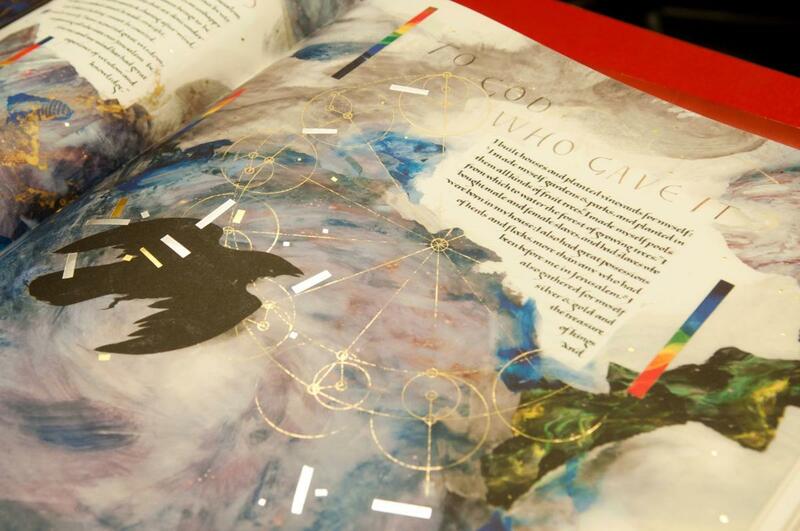 Tara was unfazed, and her output for the special issue about the Hale Library fire was a case study in great storytelling through design. Sarah is one of the hardest working, productive employees I know. She juggles multiple duties and produces more content than most people probably realize. Additionally, she is an extremely talented writer and storyteller. Sarah’s story about the fire in the last issue of the Libraries Magazine is a prime example of her talent. After the fire, Sarah took on the responsibility of managing and creating the content for the Hale Library blog. The blog has been key in our ability to communicate in a timely manner, and it was a lot of work, especially in the first few months. She was posting two stories a week in an environment where accuracy was vital, but information could change by the hour. As other work has returned to “normal” Sarah has continued producing the blog while managing her already full workload. Kathryn’s leadership and dedication after the fire made the difference between setting us on a path to a successful recovery or not. Her years of unsung work on the Libraries’ Collection Disaster Plan paid incredible dividends. 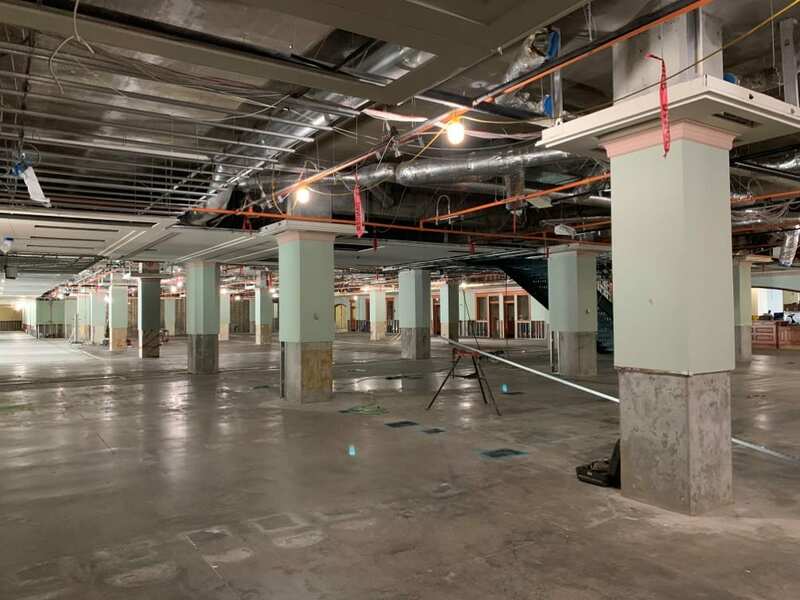 Having the plan and the various relationships in place meant the Libraries were able to move quickly to address the perils Hale’s collections were in as the air conditioning, electricity, telecommunications and other basic building services failed. More than one party outside of the Libraries commented how well we were coping. Much of the credit should go to Kathryn. While the scale of our disaster was (and still is) daunting, her plan made it less so and gave the impression we had everything figured out. 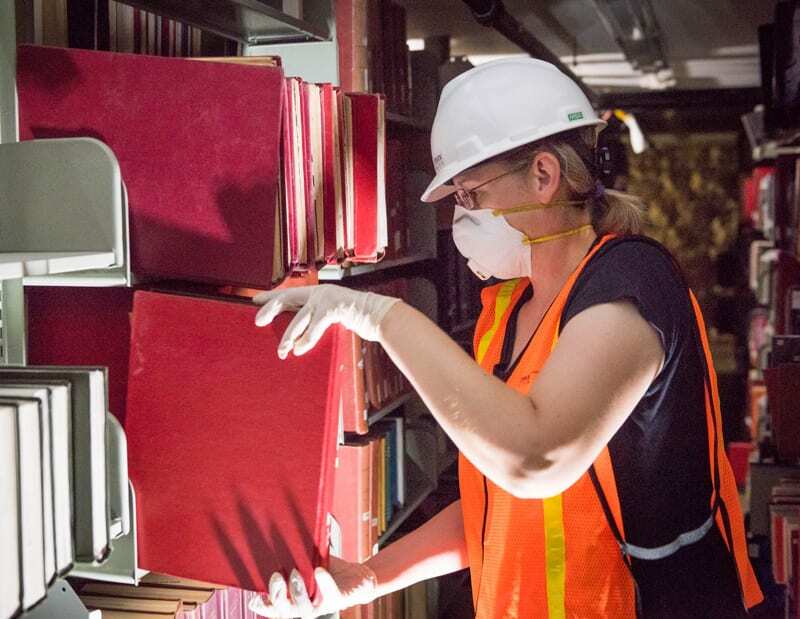 Kathryn’s follow-through was vital given the level of detail involved in packing out and mapping the removal of over 1.5 million items from Hale Library. 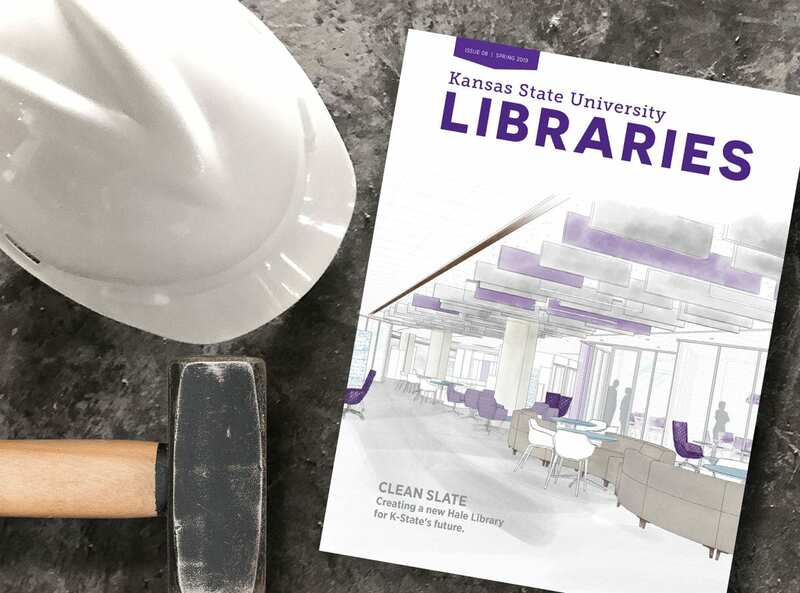 On Feb. 13, 2019, architects from PGAV joined K-State Libraries all-staff meeting to discuss next steps for the Hale Library renovation. IT coordinator Renee Gates, architects Pat Duff and Jennifer Goeke and Dean Lori Goetsch confer following the February all-staff meeting. The key take-away: Construction on most of the first floor has been scheduled. Meanwhile, designs for floors two through five are under development. So in relation to the graphic above, we are at the end of Stage 3 when it comes to the first floor, and between Stages 1 and 2 for the other floors of the building. Mike Schaadt of PGAV architects gives Libraries employees an update at the February meeting. Who are the architects in charge of this process? 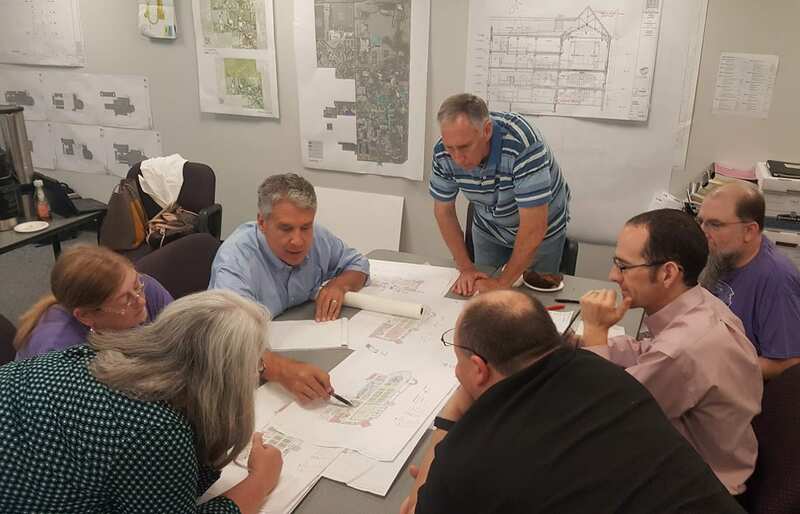 PGAV is based in Prairie Village, Kan., and they’ve worked on the design of more than 25 libraries, archives and special collections facilities in the last several decades. 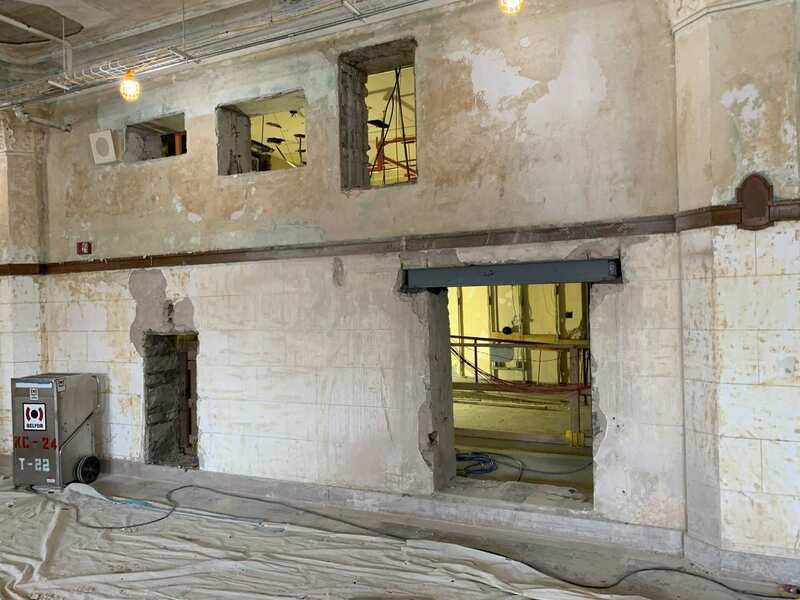 Note that Farrell Library, the 1927 portion of the building that includes the Great Room, will open last: The plaster walls are still wet, and plaster dries very slowly. The process can’t be rushed if the integrity of the material is going to remain intact. 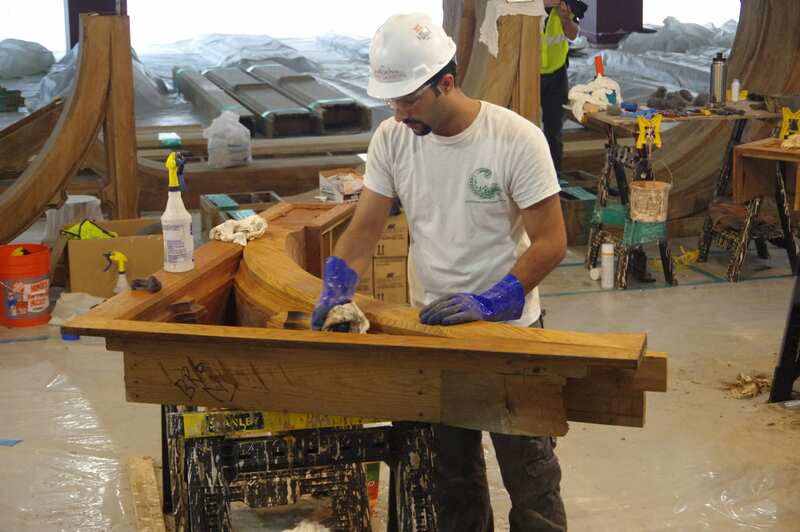 The historic conservation of the Great Room murals and the woodwork is also very complicated. 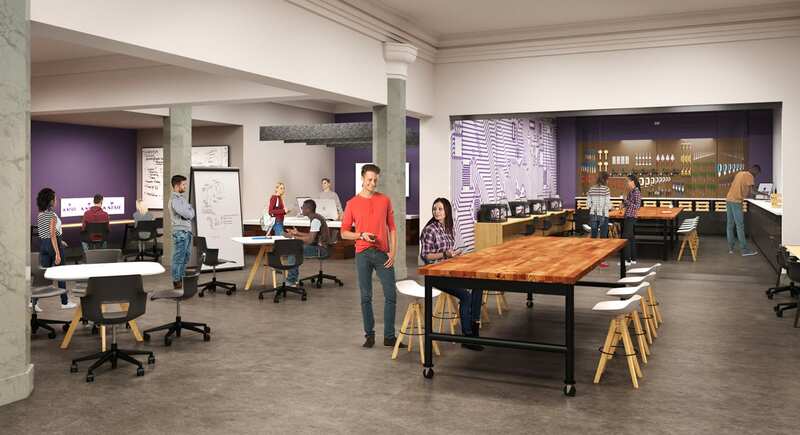 But rest assured that the new Hale Library will incorporate the things that K-State students ask for most. We’ve spent nine months in concert with PGAV and the university community to develop spaces that fill a wide variety of needs. 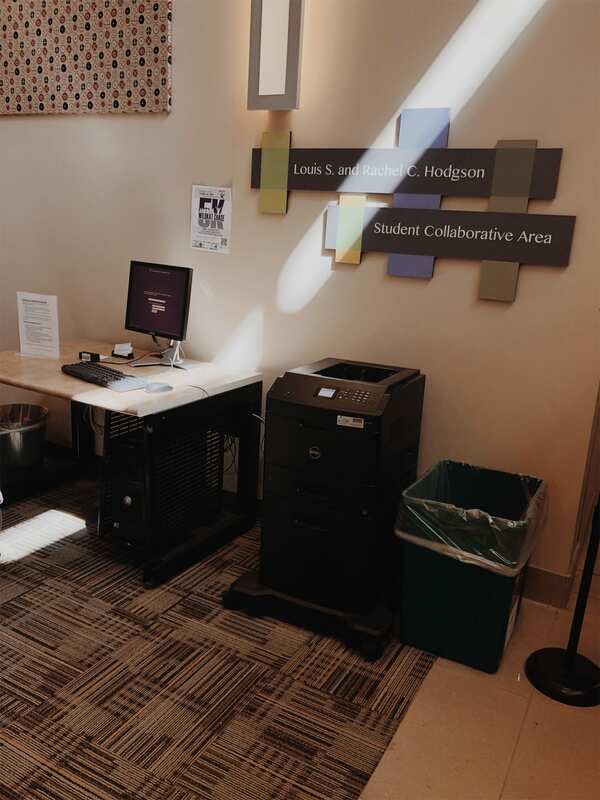 For years, noise complaints have been one of the top issues reported to the Hale Library Help Desk. Third floor was the quiet floor, but because of the way sound traveled through the building, it was never truly quiet. Now we have the opportunity to rezone Hale Library’s noise levels: In the renovated building, first and second floors will be the most active and bustling. Third floor will be quiet, with some talking allowed, while fourth floor will be the place to go for really intense quiet. 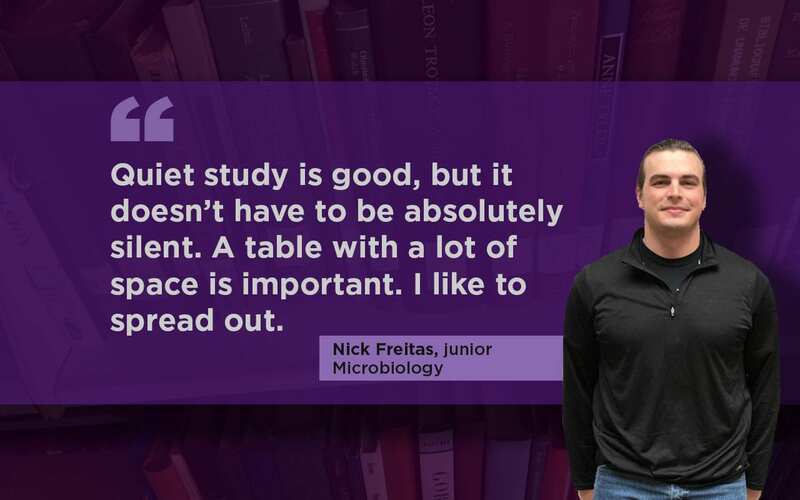 That means students like Nick might want to try a big table on third floor for an optimal study experience. One of Hale Library’s amenities that students say they miss most since the fire is the white boards. They were always in high demand—which also meant we had to replace them frequently. In the new building, students like Erin will have plenty of white board options to choose from. In fact, Hale Library will have entire walls covered in white boards, including long stretches on first and second floor. 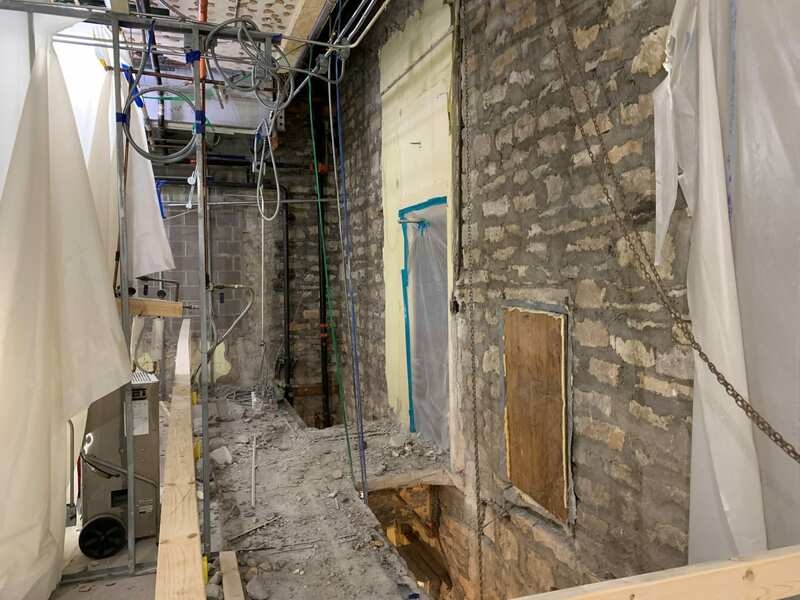 Those walls will be punctuated by strips of limestone that offer a glimpse of the 1955 addition’s exterior that was covered in subsequent expansions. Hale Library spaces were repurposed multiple times over the years. In the most recent iteration, the first and second floors of Historic Farrell Library housed collections and office cubicles. 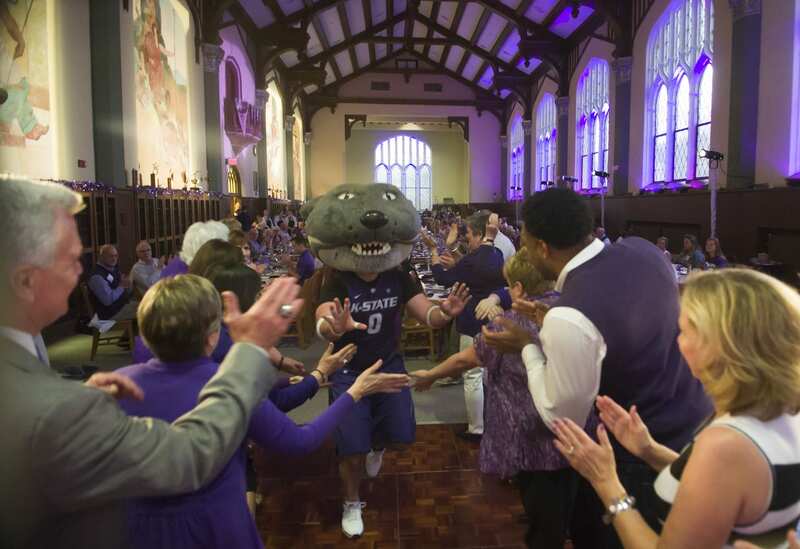 That meant that the larger K-State community rarely had the opportunity to appreciate the gorgeous natural light and architectural details in those spaces. In the renovated 1927 building, the first and second floors will be converted into public gathering spots featuring some of our high-use collections like juvenile literature. They will also be outfitted with plenty of soft seating and tables so students like Carlie can study in a room flooded with natural light. 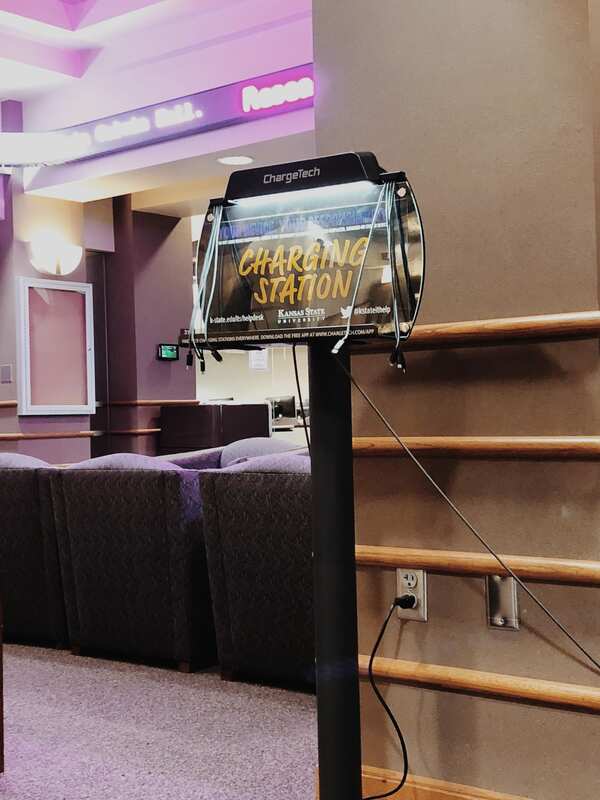 Another retrofit: When the 1997 Hale Library renovation occurred, no one could have predicted how high the demand for outlets would be 30 years later: Today’s students want to charge their laptops and phones while studying. Since the entire building has to be rewired, we will be able to increase the number of outlets in Hale Library exponentially! 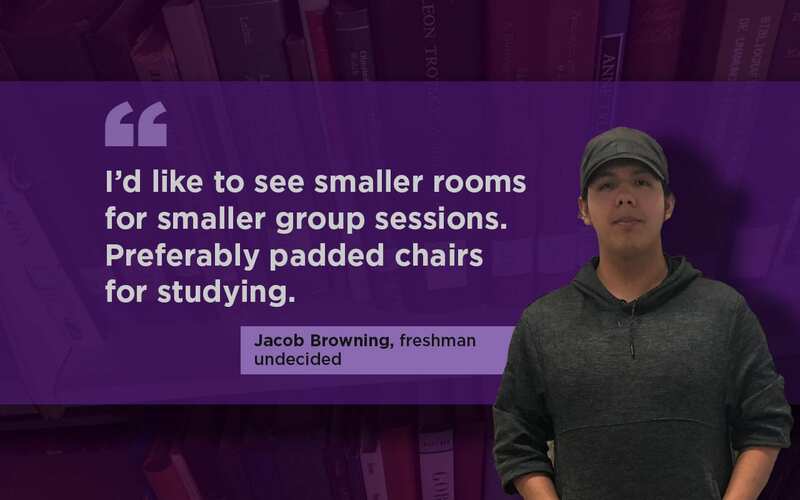 First-year students like Jacob haven’t ever experienced Hale Library. When it reopens, one of the major new improvements will be the reservable rooms that will accommodate groups of all sizes. 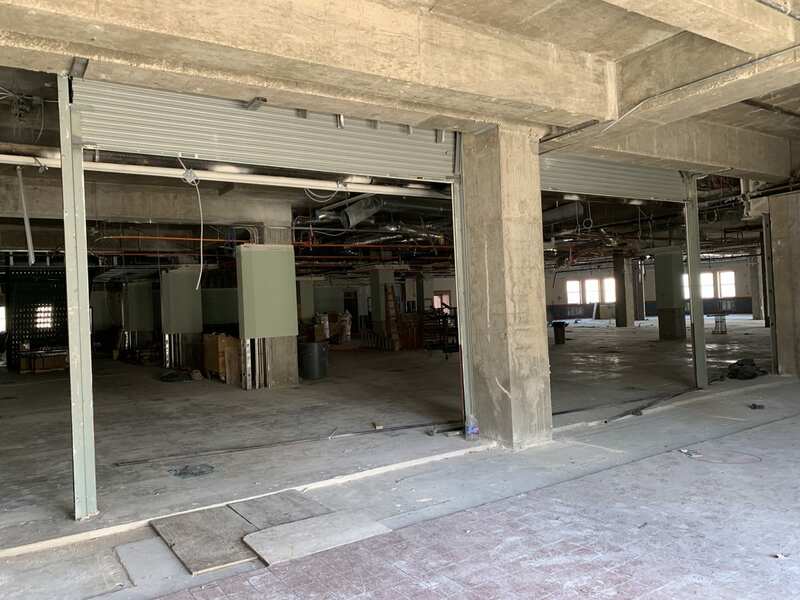 In fact, the first floor, which reopens in fall 2019, will feature at least a dozen of these spaces, and more will be spread throughout the building. 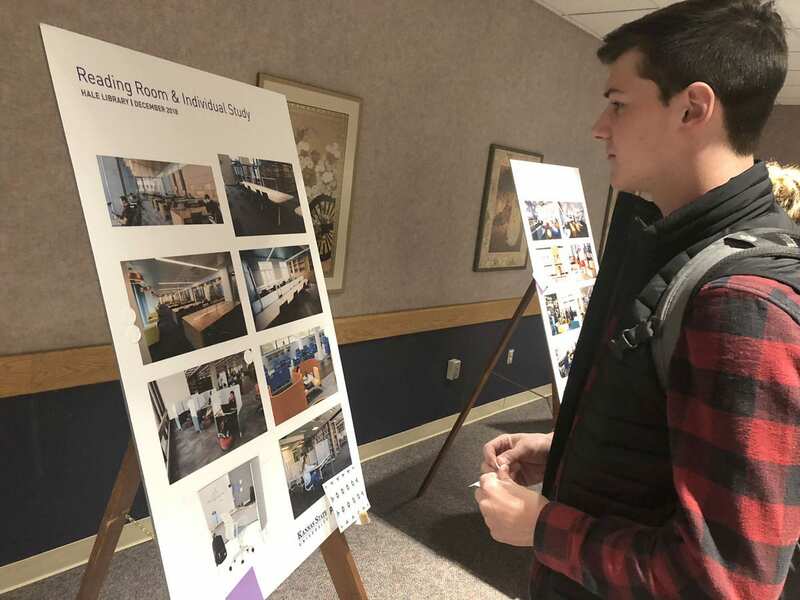 Students will finally have a private spot equipped with video technology to practice presentations, conduct interviews and meet with study groups. 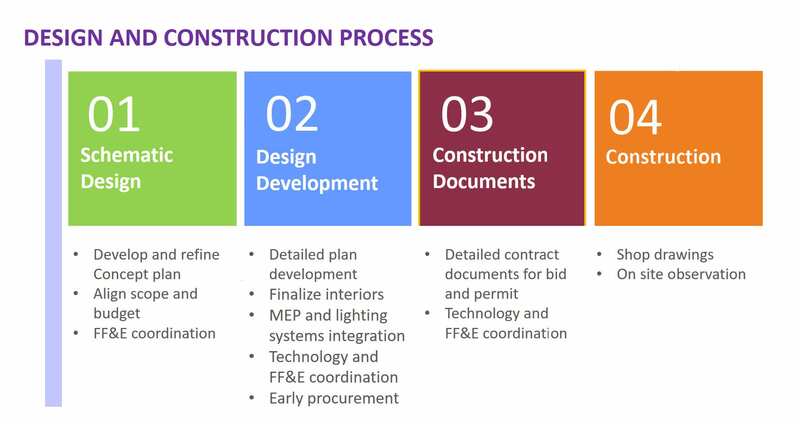 These are just a few of the types of improvements we’ve been planning with PGAV, and we look forward to featuring progress on construction of these spaces in the coming months. Every spring, three K-State Libraries awards honor individuals who have made outstanding contributions to our organization. Since so many folks went above and beyond the call of duty following the fire, the employee awards ceremony this spring will be especially meaningful. We’re excited to honor a few of our outstanding employees. 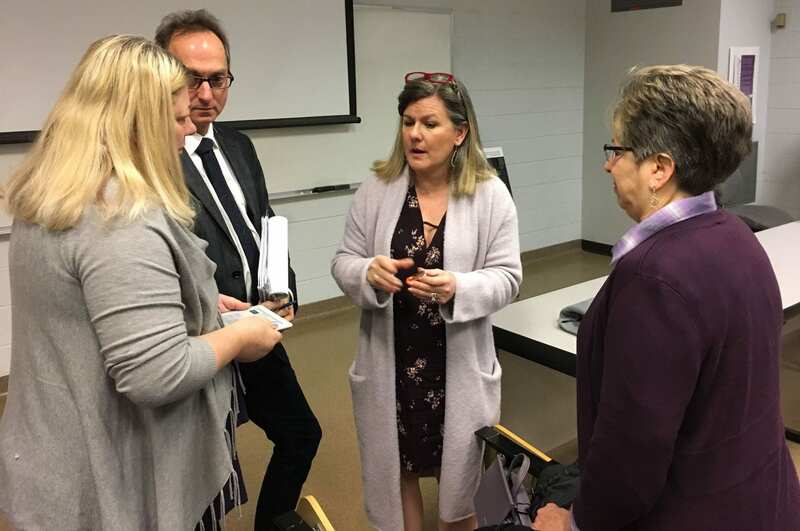 The recipient of these awards—one each for a faculty member, a professional staff member, and an university support staff member—has their name added to a plaque and is presented with $1,000. 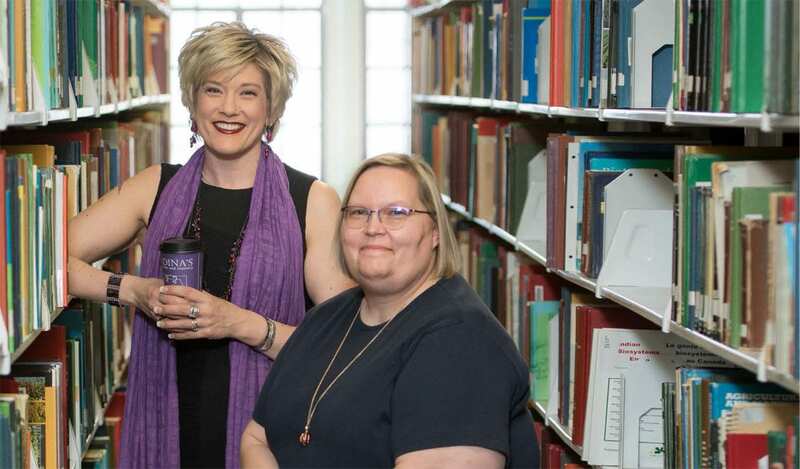 The University Support Staff of the Year award, which has been presented since 1983, is generously sponsored by the Friends of the K-State Libraries. We are proud to introduce our three nominees for the University Support Staff of the Year. All three of them experienced big changes in their jobs after the fire, and all three remain resilient, patient and hard-working. Jesica Sellers works in building services. 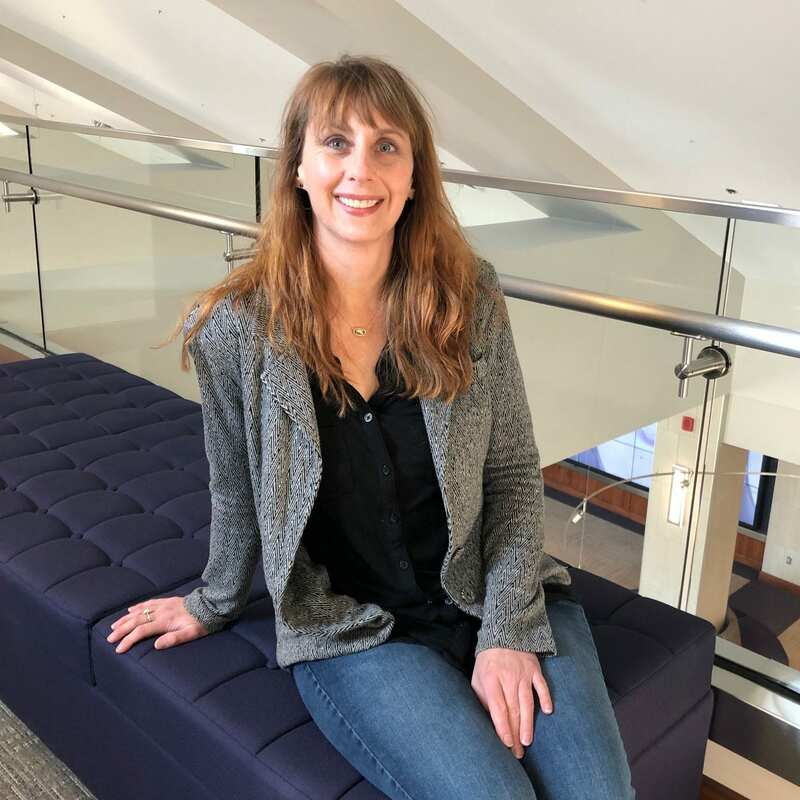 When we were located in Hale Library, her work included addressing building maintenance issues, setting up rooms for events and meetings and coordinating mail delivery. Without Hale, Jesica’s job has changed a lot, and tasks like mail delivery have become more complicated. 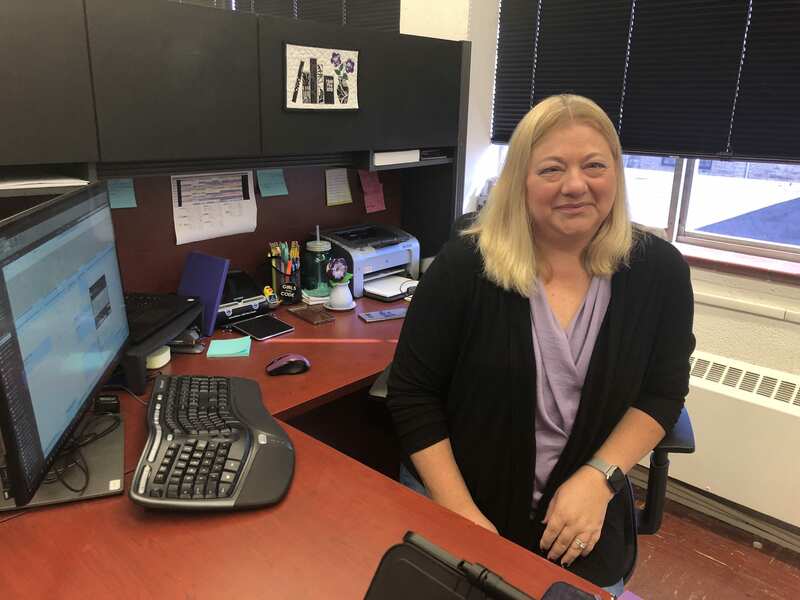 For example, she works with half a dozen students and their shifting schedules to make sure the Libraries’ staff receives mail in ten different buildings spread across the K-State campus. 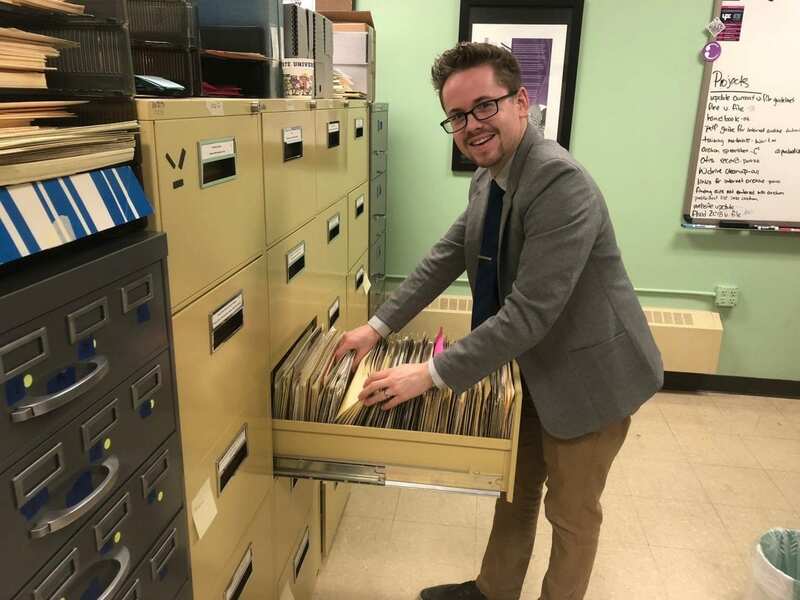 The process of keeping track of millions of items in a library collection falls to the folks who manage the metadata, including copy catalogers like Raymond Deiser. Raymond has several cataloging specializations at K-State Libraries, including government documents and maps. He also helps with music cataloging. 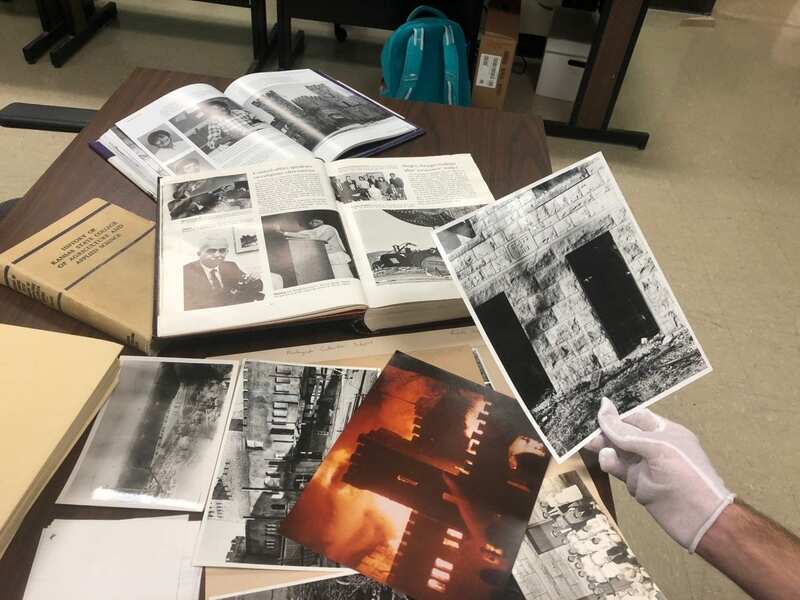 Like all of the other copy catalogers post-fire, Raymond spends at least two days each week at the K-State Libraries Annex, which is located near the Manhattan Regional Airport. As our books and other items that were in the fire are cleaned, as many as possible are being ingested into the Annex so they can be checked out again. First, though, the catalogers have to prepare each item’s catalog record, which is a big job when you’re processing thousands of items. 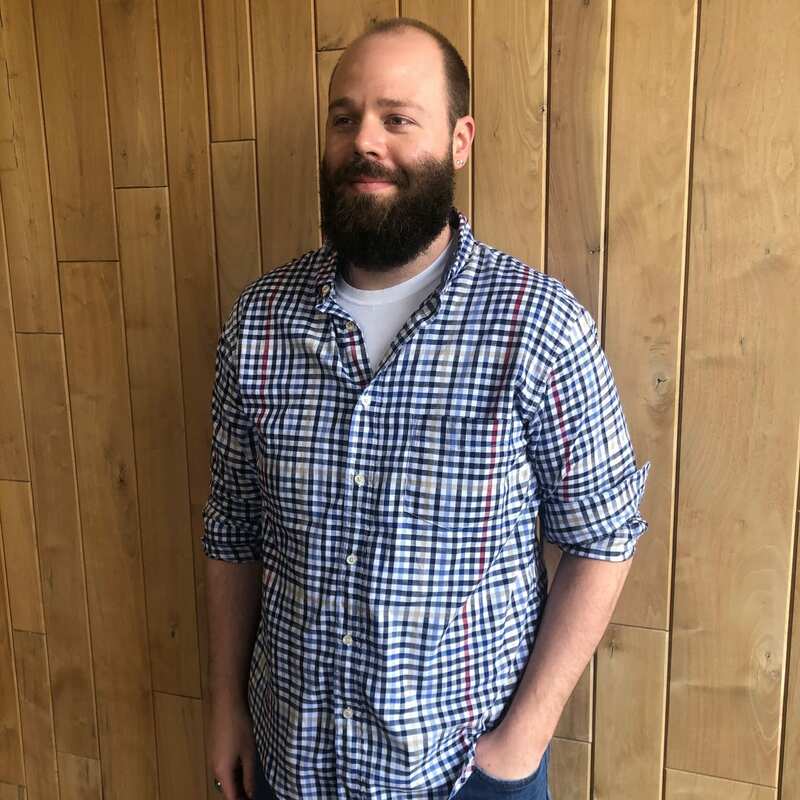 Raymond is also the unit’s in-house expert on Alma, the cloud-based library services platform we use to manage our collection and the way our users find what they need through our website. 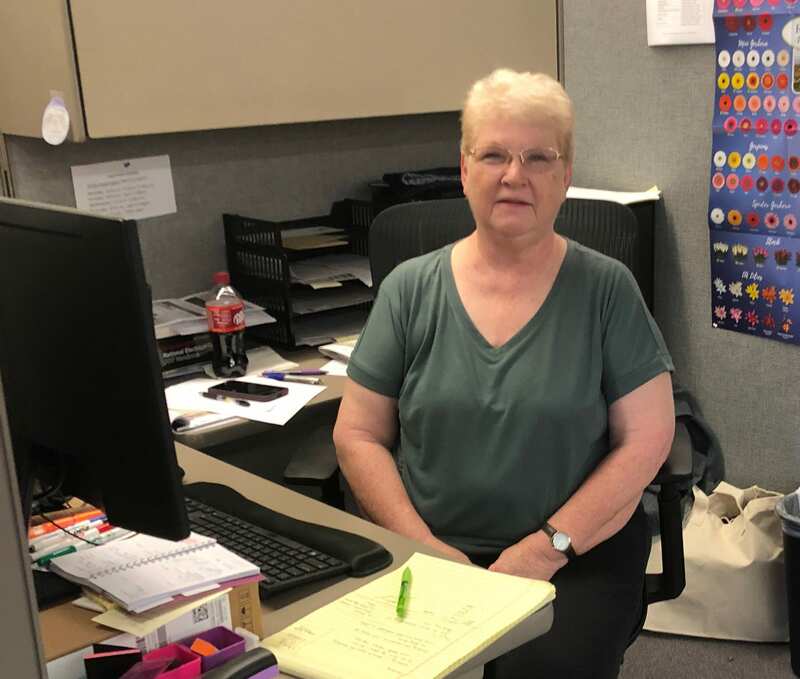 Marcia Eaton works in interlibrary loan services (ILS), and they have been even more in-demand than usual following the fire. 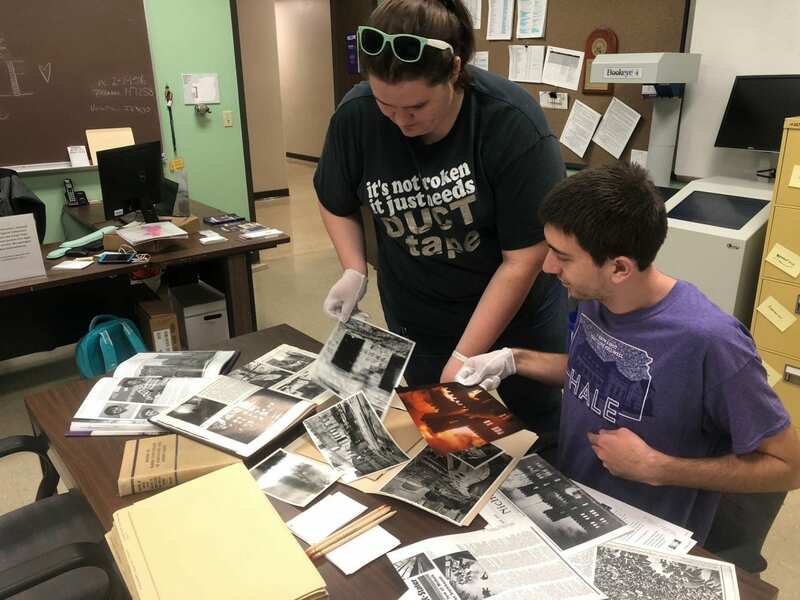 When K-State Libraries doesn’t own the materials our community members need, ILS borrows the materials for them from other libraries around the country. Since most of our physical collection is boxed up and in storage, it’s unsurprising that the number of borrowing requests has skyrocketed. 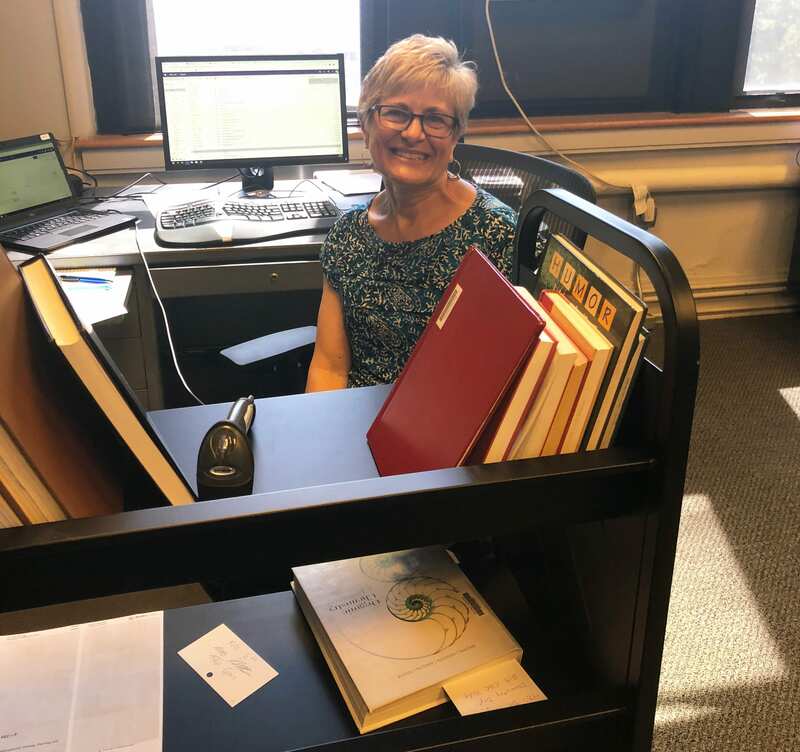 Marcia’s hard work, diligence, and positive attitude greatly contributed to Interlibrary Services being able to handle the increased demand for loans and articles after the fire. Marcia began the year as the sole lender in Interlibrary Services. After the fire she switched to working full-time in borrowing. Congratulations, Jes, Raymond and Marcia! We look forward to introducing the other award nominees and announcing the winners in the coming weeks. 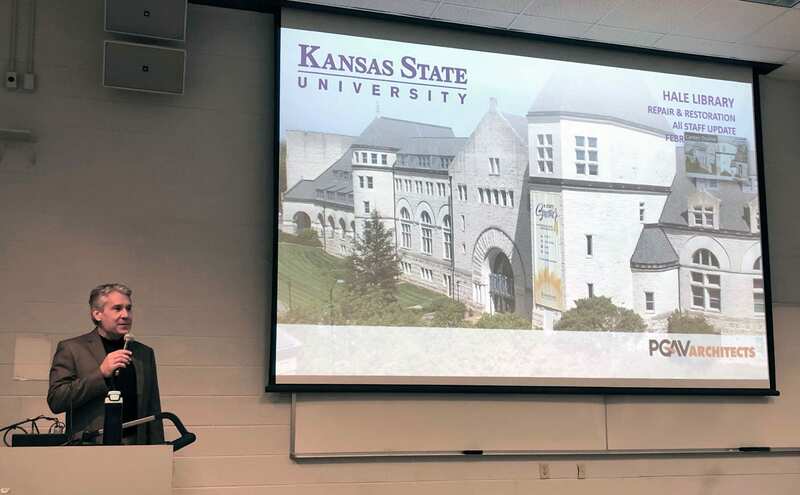 At our recent all staff meeting, Associate Dean Mike Haddock gave the K-State Libraries team a run-down on the latest happenings inside Hale Library. 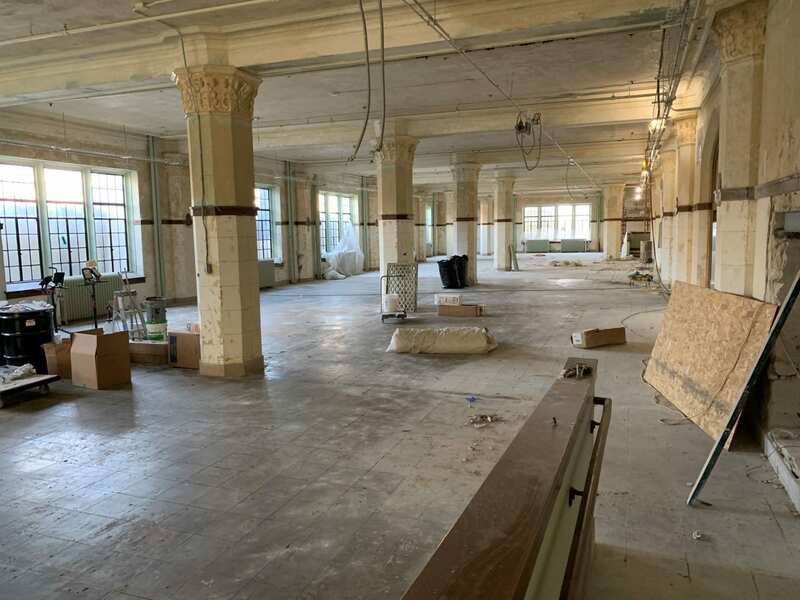 So, as we’re lining up at the starting line for our massive first floor renovation project this spring, we wanted to give you an idea of where things stand. 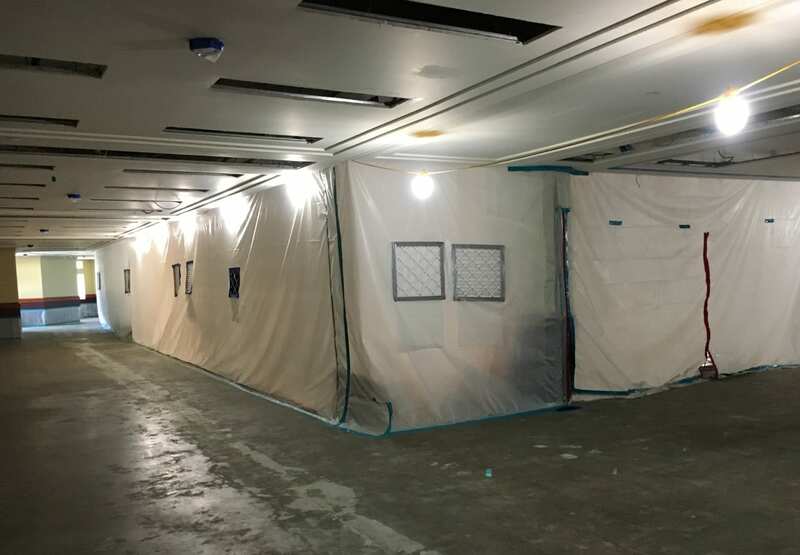 Starting on the ground floor: The first floor is finally clean, so the plastic sheeting that divided the space into sections has left the building. Now, first floor looks…. a lot like the other big, empty, clean expanses on second, third and fourth floors. 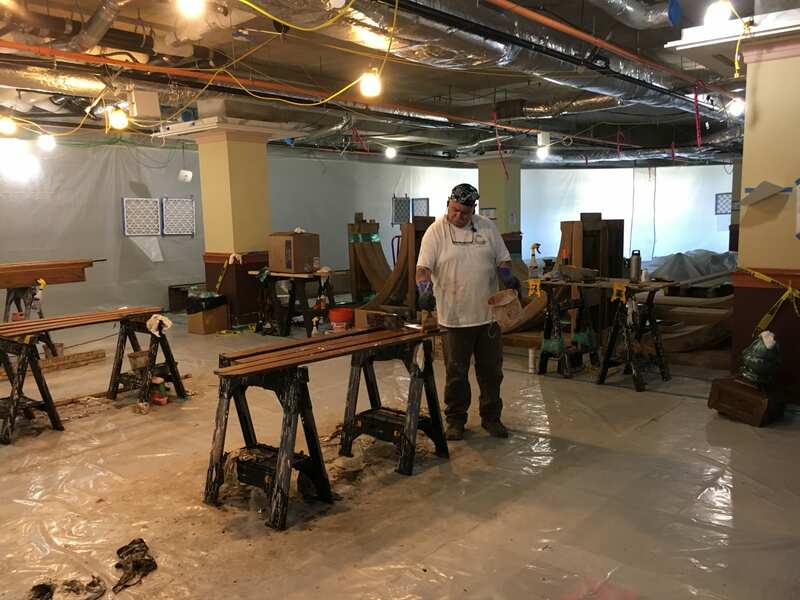 There’s a little more action on the ground floor of the 1927 portion of Hale Library, where crews are removing sea foam green paint from the plaster work. 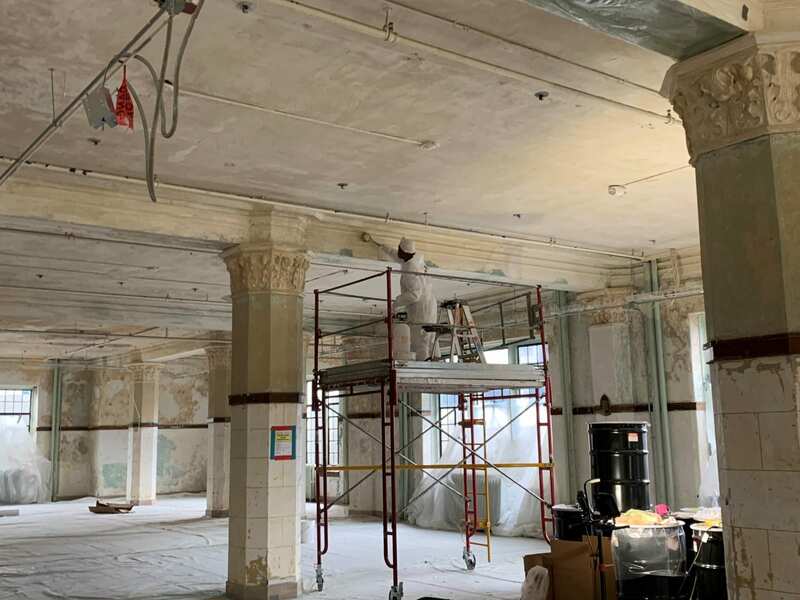 Removing the paint will aid in drying the plaster, which is still retaining moisture from the water that poured through Historic Farrell Library during the fire. This space, Room 117, used to be packed with a lot of shelving, and except for a small group of devotees who flocked to the dozen or so tables that lined the room, few people knew about it. Once it’s renovated, Room 117 will be home to our juvenile literature and curriculum materials collections plus plenty of comfortable seating. More people than ever will be able to enjoy its beautiful architectural details and natural light. Up in the “Harry Potter Room” on third floor, a lot of carpentry wizardry has gone into building protective boxes around the Great Room murals. This will prevent damage during all of the renovation that has to happen in the space. Above, you can see protective dark felt fabric stretched across the murals, and on top of that, a layer of plastic. 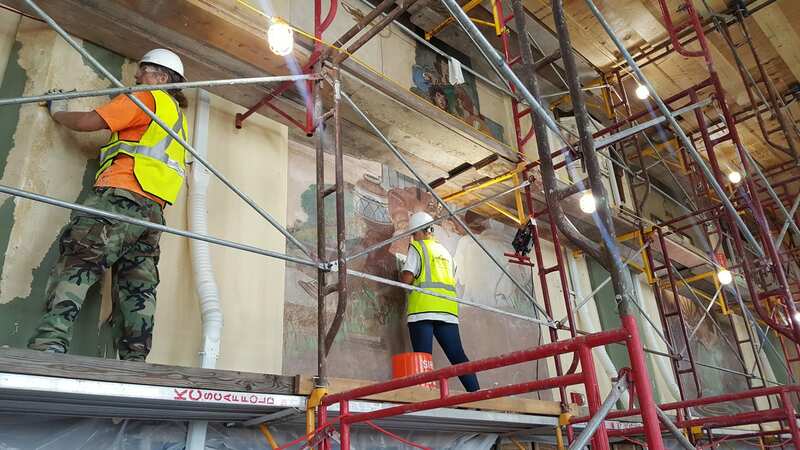 Once the plywood “rooms” around the murals were complete, they fastened small doors at multiple levels up and down the height of each painting so the workers can climb up and down the scaffolding and check on each mural’s condition on a regular basis. 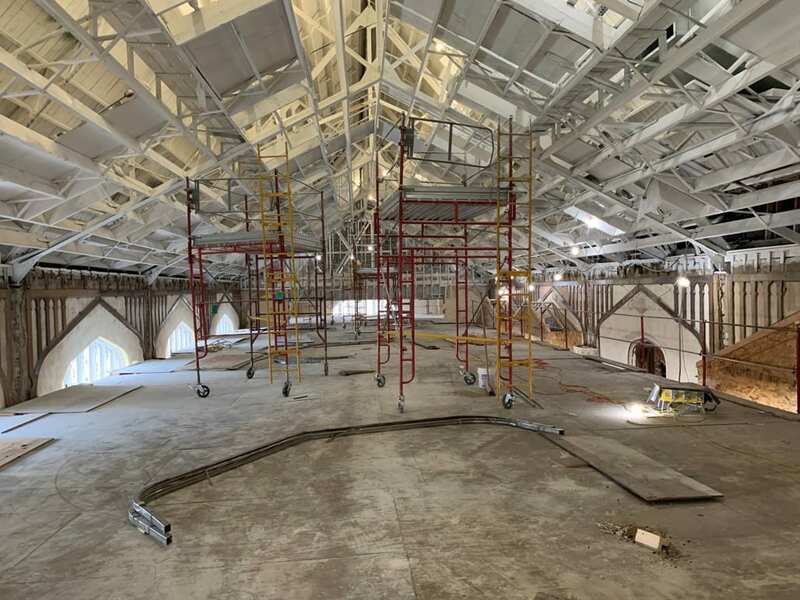 This photo is of the “dance floor” which is supported by the scaffolding that fills the Great Room. The dance floor gives workers access to the underside of the roof. Recently, a lot of the wood supports criss-crossing the space were removed. Next, workers reinforced the existing metal roof supports with steel beams. 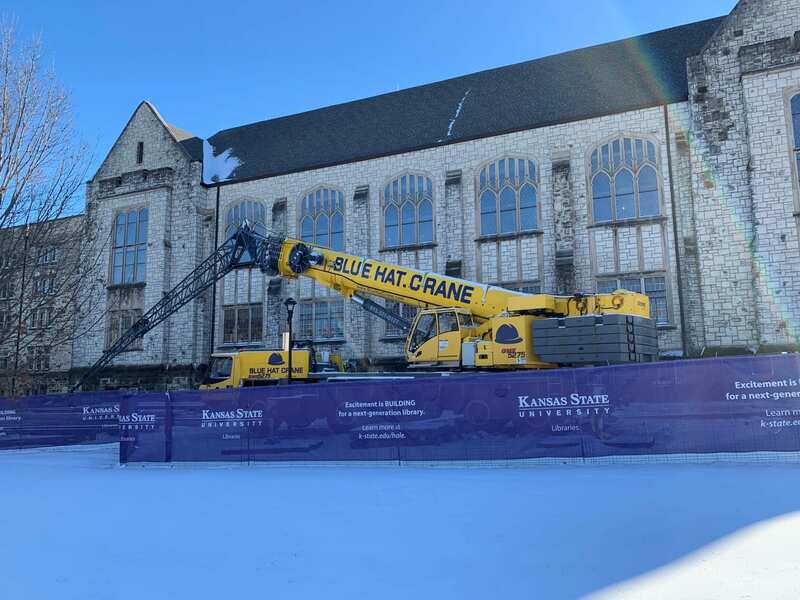 It’s exciting to see improvements like these going in to strengthen the building so it will be here for many more generations of K-Staters. Now, if you were to jump into the photo above, climb the orange ladder from the dance floor, go up through the attic and exit the little portal to the right, you’d arrive on the roof of Hale Library. There used to be some massive air handling units out here on the roof, but those were heavily damaged by the fire and removed with a crane last summer. Now, a new penthouse is going up. Nonetheless, this new home for our HVAC systems will be the nexus for improved heating and cooling across the entire 550,000-square-foot building. 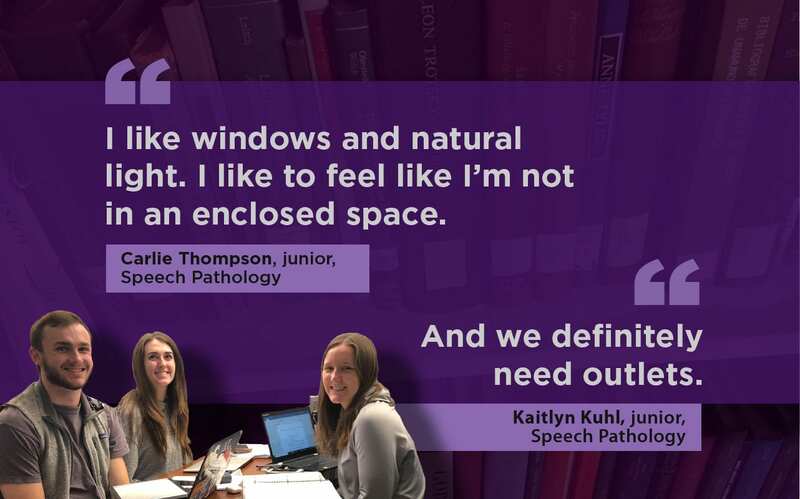 Students who have spent time in Hale Library during the heat of summer and cold of winter (and during those hot-cold-hot fluctuations in spring and fall) have heard us say how difficult it was to control temperatures in the massive space. This penthouse and its equipment will make the new Hale Library dramatically more comfortable! 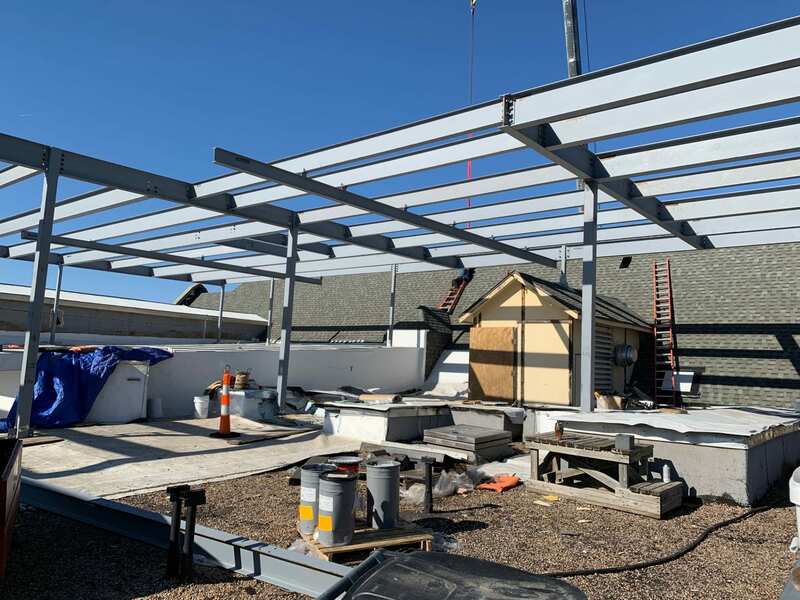 So, from the first floor to the roof, that’s what’s new at Hale Library. 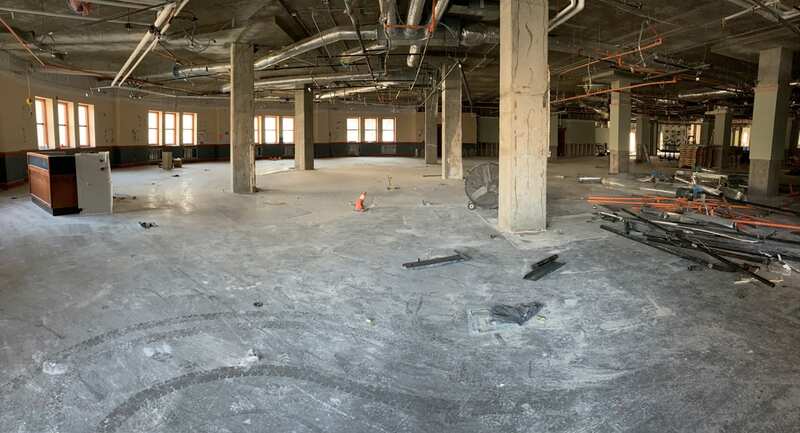 Our renovation begins in earnest very soon, and at this point, we still aim to reopen an amazing first floor space in fall 2019. In the meantime, we leave you with a discovery Haddock made when he was in Hale Library to take these photos. Nothing like a little dark humor to brighten up a cold winter day. From the outside, Hale Library looks relatively normal. Sure, there is a fence around it, and there is obviously some sort of construction going on, but the building’s exterior does not mirror the level of destruction inside. This week we started a new semester, complete with new students wondering why the library is under construction. Even though we have been posting updates, there seems to be a disconnect with students about why Hale Library isn’t open. 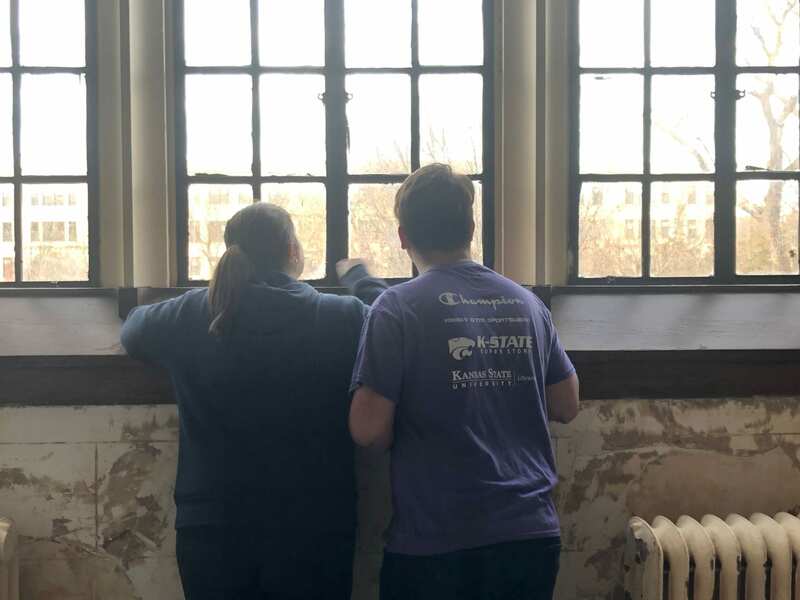 In order to get a student’s perspective on what’s happening inside the building, the week before finals I joined a group of K-State Libraries Student Ambassadors on a tour so I could see the damage through their eyes and get their honest opinions. Gutted office space in Hale. 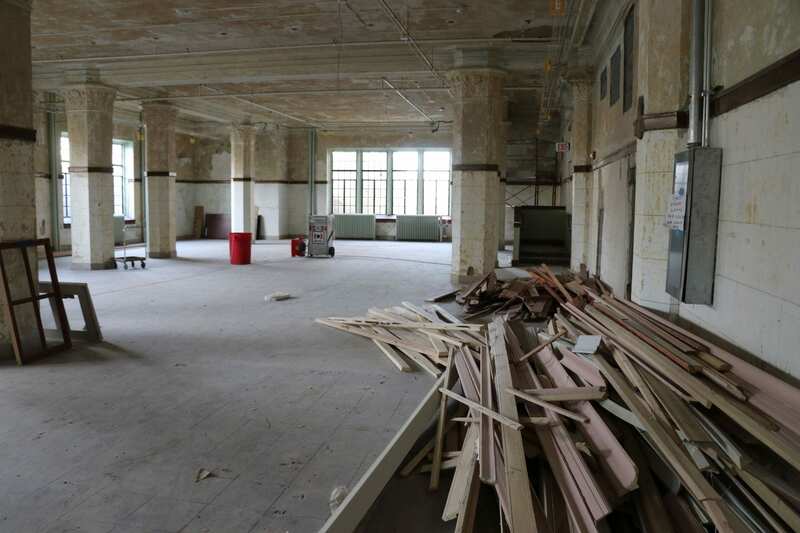 The inside of the building has been stripped of almost all furniture and carpet, with a few remaining belongings sitting on the second floor. Most of the building is unrecognizable, and extension cords trail along the ceiling for lighting. “I remember walking around Hale thinking that I knew where we were, and then Dean Lori would say something and I would realize that I had no idea where I was,” said Matthew Millholm, a junior agricultural education major. The railings lining the stairs aren’t particularly stable; they shift and make loud and frightening noises. 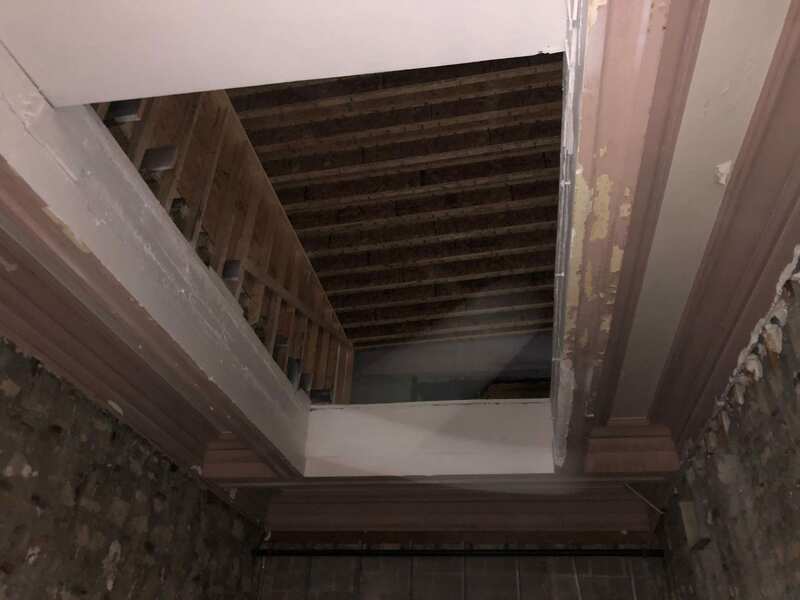 The combination of the exposed wall and partially destroyed tile on the staircase between the first and second floors was haunting, but we made it. From there, we took the elevator to the third and fourth floors, which was terrifying, but in different ways: There are no lights in the elevator. It was pitch dark. 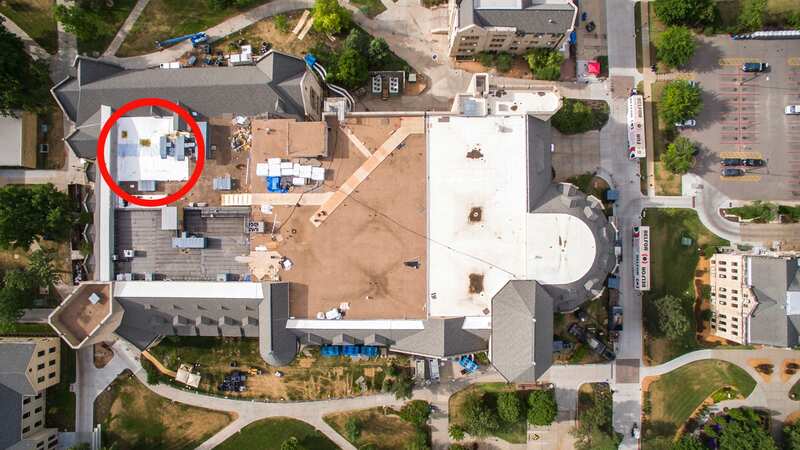 This really brought home what Dean Lori Goetsch explained to us about the power in the building: Right now, all of the electricity is a low level of “construction power” that is brought into Hale Library from outside. As a result, areas that don’t absolutely have to be lit up (like the elevators) are left dark. 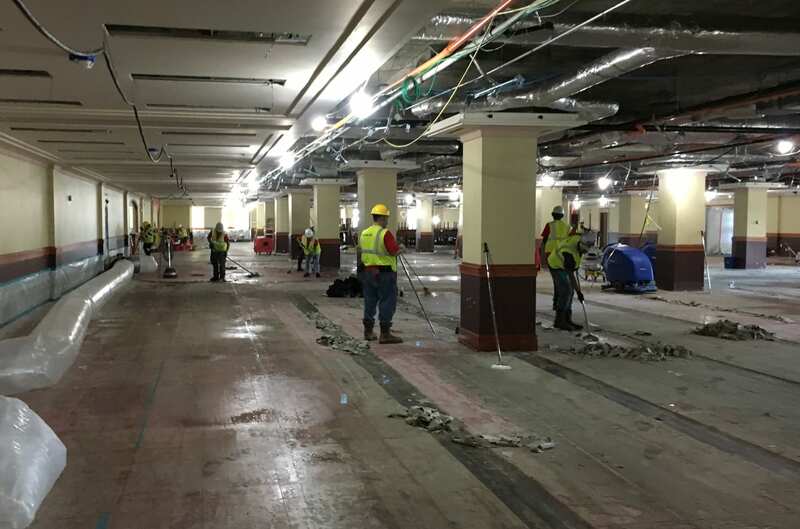 It will be a huge job to replace all of the building’s electrical wiring so that it has its own power again. Two library student ambassadors, Brooke Sullivan and Matthew Milholm, look at students walking below from the room that used to house iTAC. The Great Room has seen better days but is under active construction. We barged in on two workers who looked very surprised to see us. Despite the scaffolding and the construction, the room is still gorgeous. 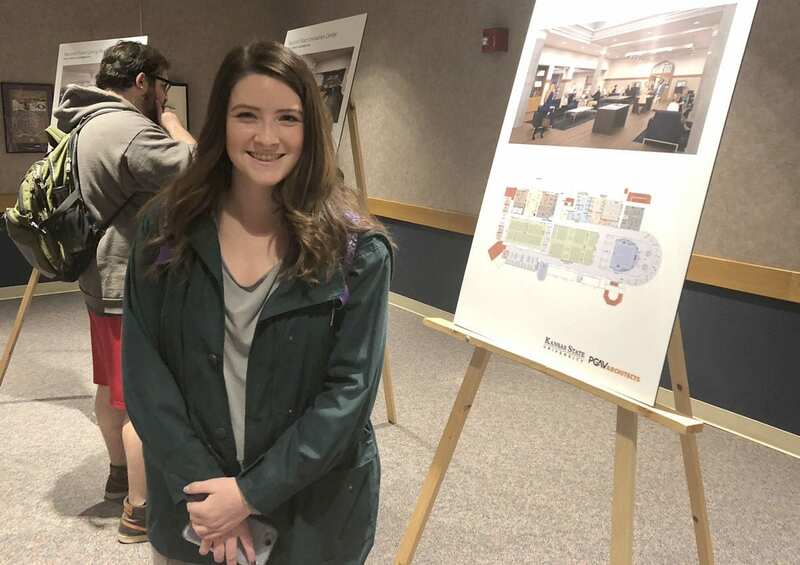 “It was a little bittersweet going inside the Great Room and walking by my old study spot because it really does look like a completely different building now,” Victoria Sparkman, a senior political science major, said. 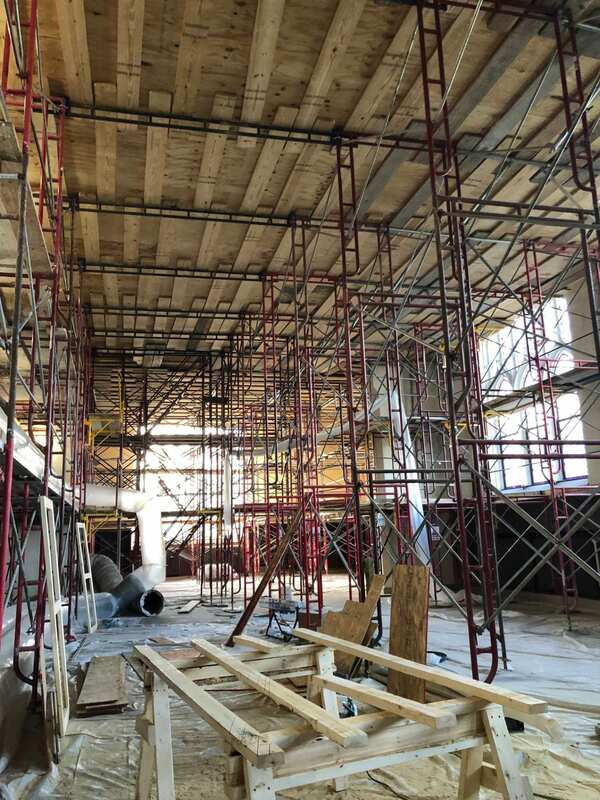 Scaffolding and amazing lighting in The Great Room. After the fire, all the carpet needed to be torn out. As we exited the Great Room, we encountered a portion of the floor that is still alarmingly sticky from carpet glue. Victoria Sparkman sitting in the lone chair in this part of the third floor. Even after all of the demolition and repairs, there are still places in the building that look beautiful. This is the woodworking room, boxed in by plastic sheets and dedicated to repairing wooden trim from the Great Room. Woodworking room on the fourth floor. The fourth floor was probably the most terrifying of all. The students—and, off the record, some of the adults—thought it would have made an excellent haunted house, with the exposed brick, scattered debris, and office space that has been temporarily transformed into a lair of some kind. 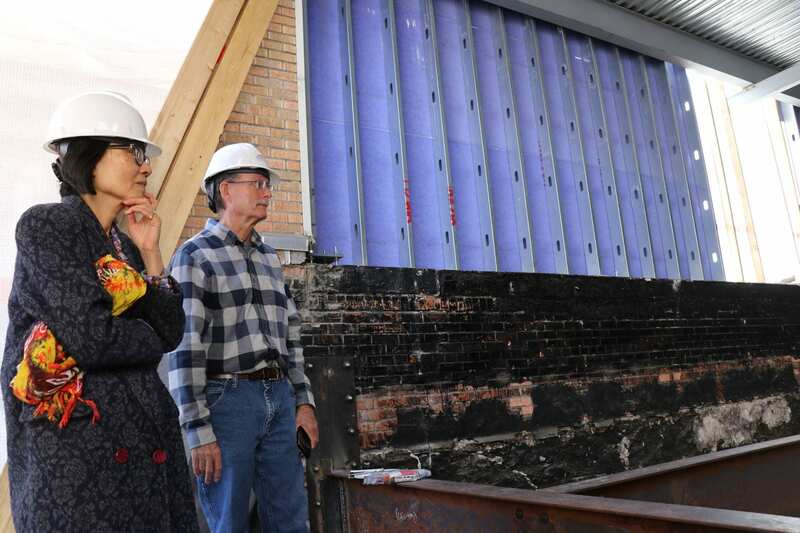 “It was very cool to see the old brick walls that were covered up when Hale was expanded over the years; it was like seeing more of Hale’s history,” Sparkman said. 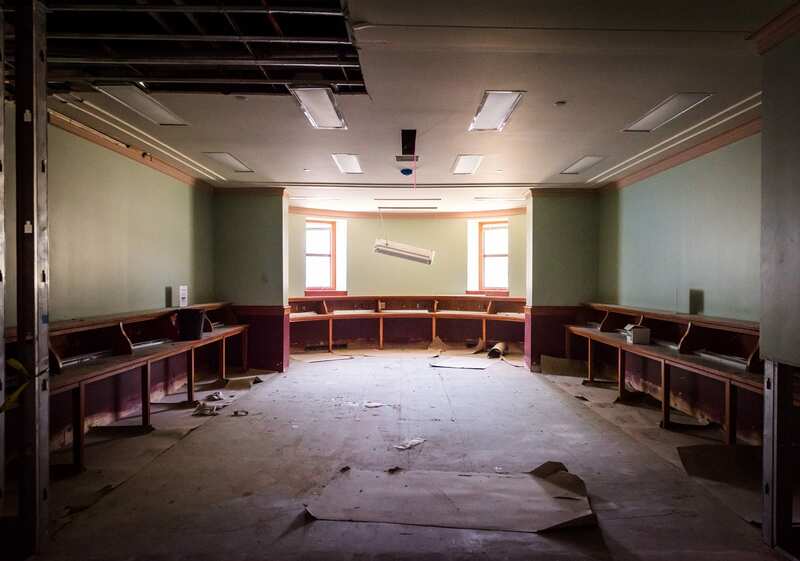 This haunting room was once part of the Academic Learning Center. 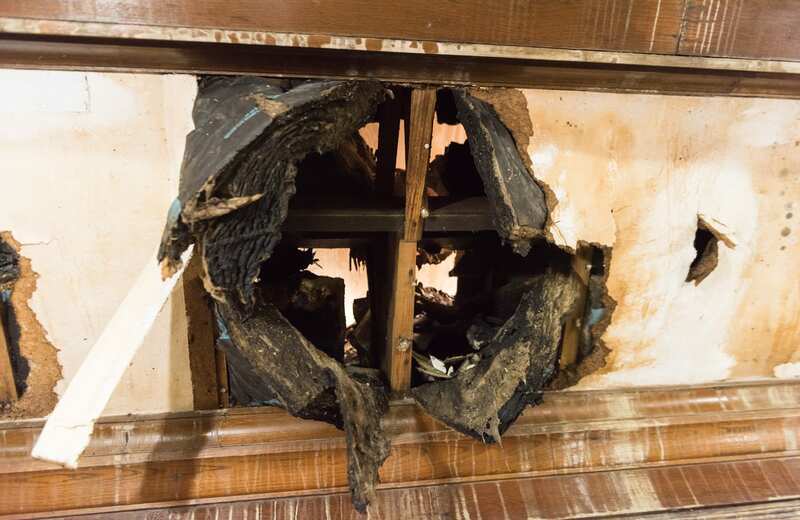 This gaping hole shows where the fire began on the roof above the Academic Learning Center on the fourth floor. Stairway to Heaven (or stairs to the relatively undamaged fifth floor). The fifth floor is surprisingly intact because it was not damaged by the water. Because of this, desks, carpet and other items were left behind. 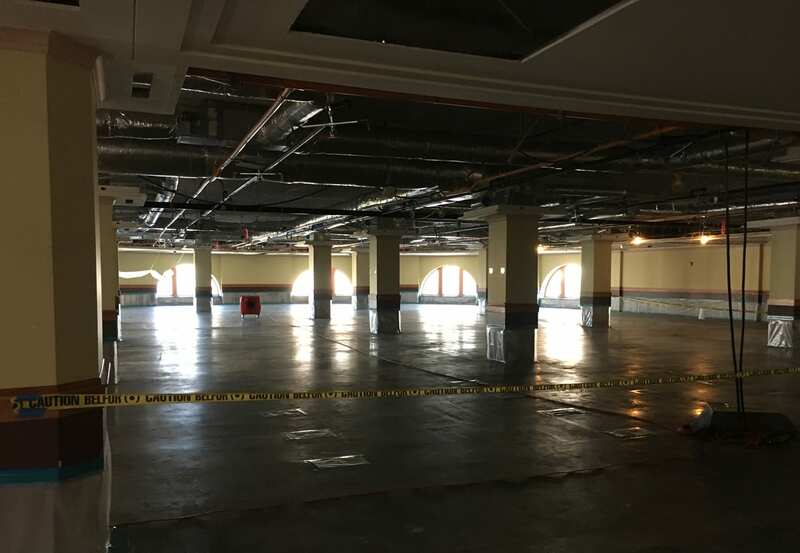 This floor is where special collections were housed, so they escaped intact, although they were moved offsite for storage and will need to be cleaned. 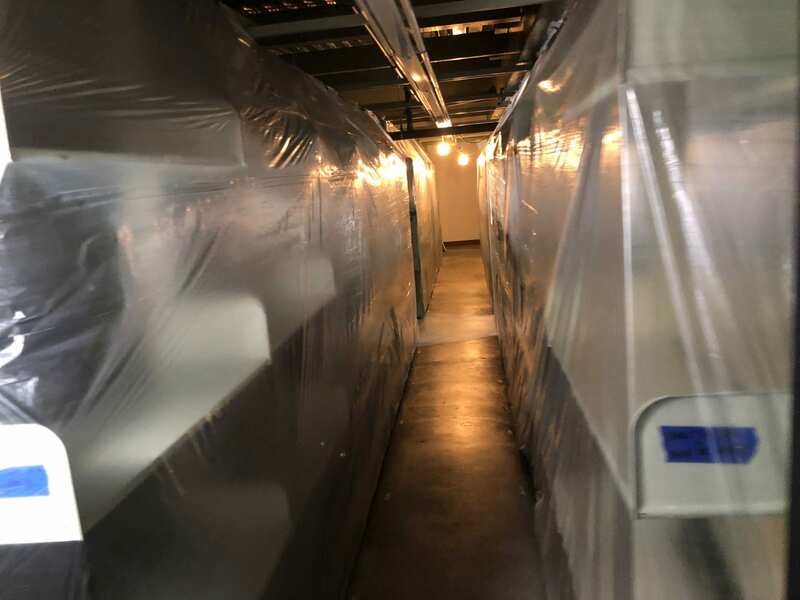 “One of the weirdest things was going to the fifth floor and having it look relatively normal while the rest of the building looked so different,” Wefald said. Me, touching an Abraham Lincoln bust. Allegedly, if you rub his nose you’ll have good luck. The final part of the tour took us to the stacks for special collections. There was a fan on somewhere in the room that made the plastic sheeting move. This, paired with the dangling light bulbs at the end of the dark bookshelves, made for a terrifying experience. At the end of the tour, we were all excited that we had the opportunity to see the inside of Hale. 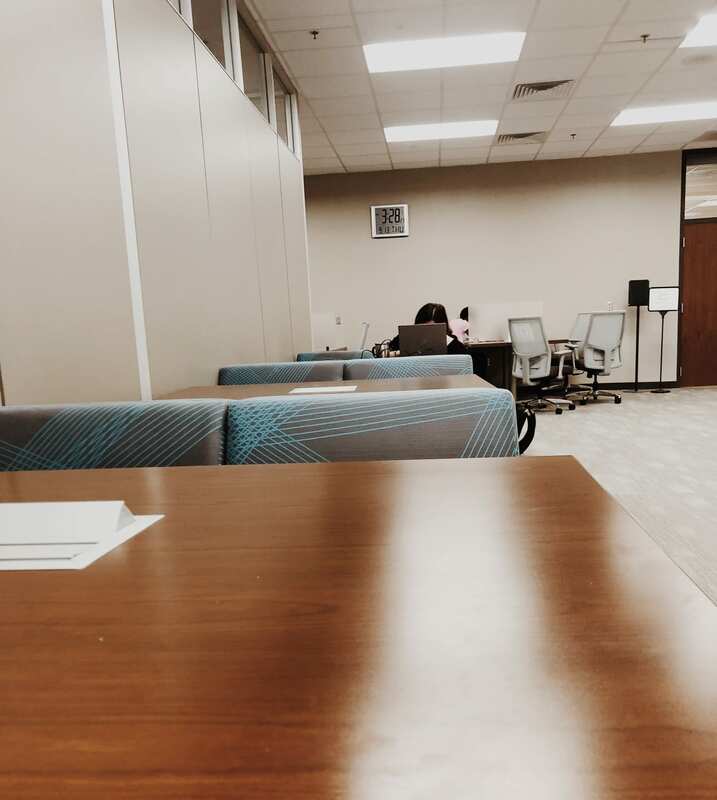 For the students who will graduate before it reopens, it was lovely to be able to say goodbye to the library that has been their favorite study spot for so long. 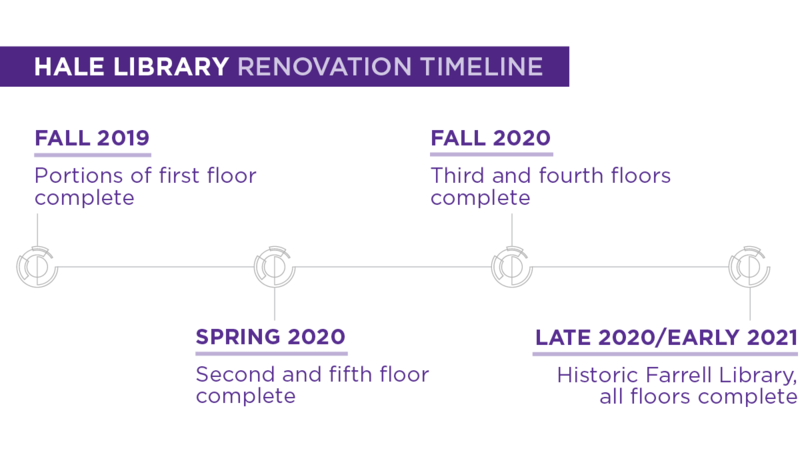 It’s coming: Hale Library’s new first floor will open in fall 2019! Other floors will follow in 2020. 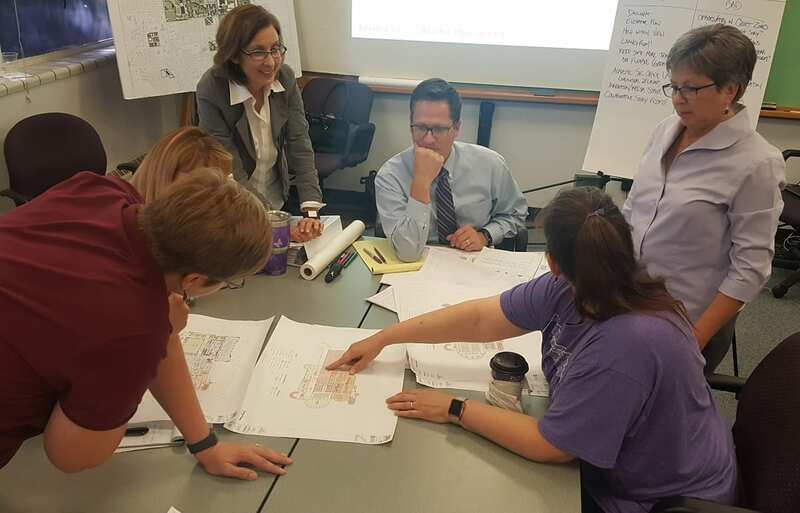 On Tuesday, December 4, architects from PGAV held an open forum to share existing plans for the building and to get feedback from the K-State community. 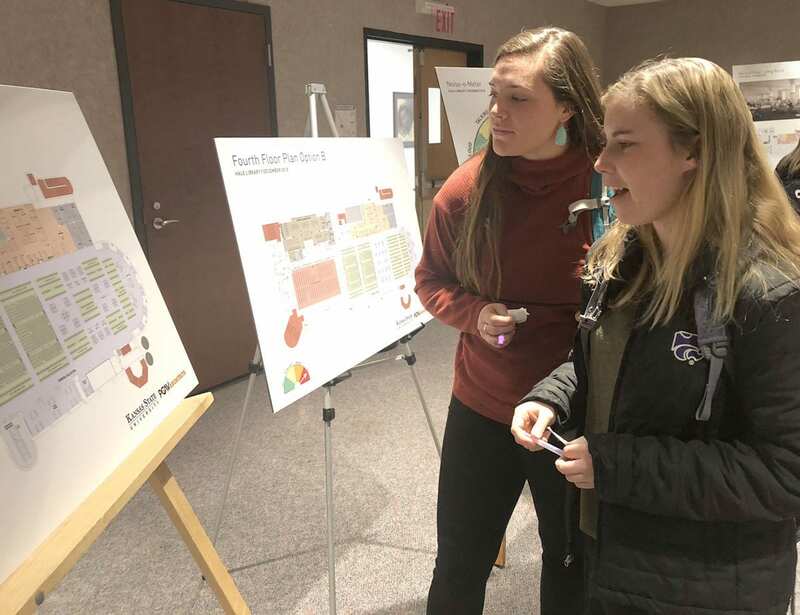 As attendees pored over proposed floor plans, they talked about how they used Hale Library in past semesters and what they’d like to see in its future. They even considered details like noise levels and various furniture styles and configurations. 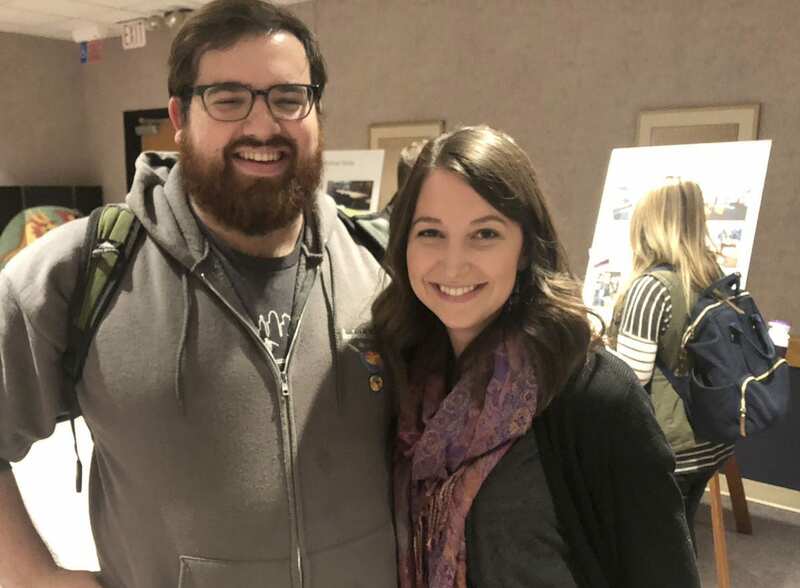 Brien Moylan, junior in construction science, pictured with interior designer Andrea Brundis ’13, PGAV interior designer. 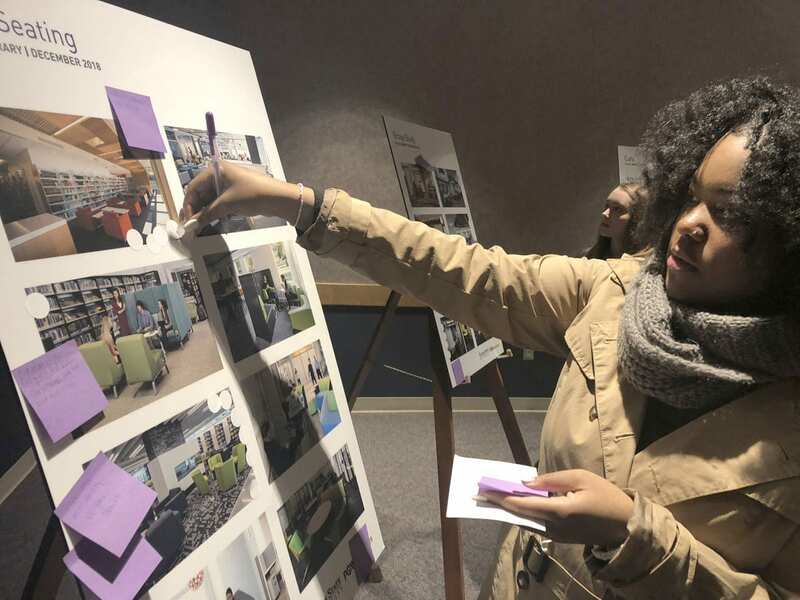 Over the past several weeks, architects have been making revisions to reflect some of the feedback they’ve received in meetings and in the open forum. We look forward to sharing more renderings, floor plans and timelines in 2019! Finals week is next week! Since Hale Library is temporarily out of commission, we wanted to highlight some study locations that might make things less stressful during this very stressful time of year. 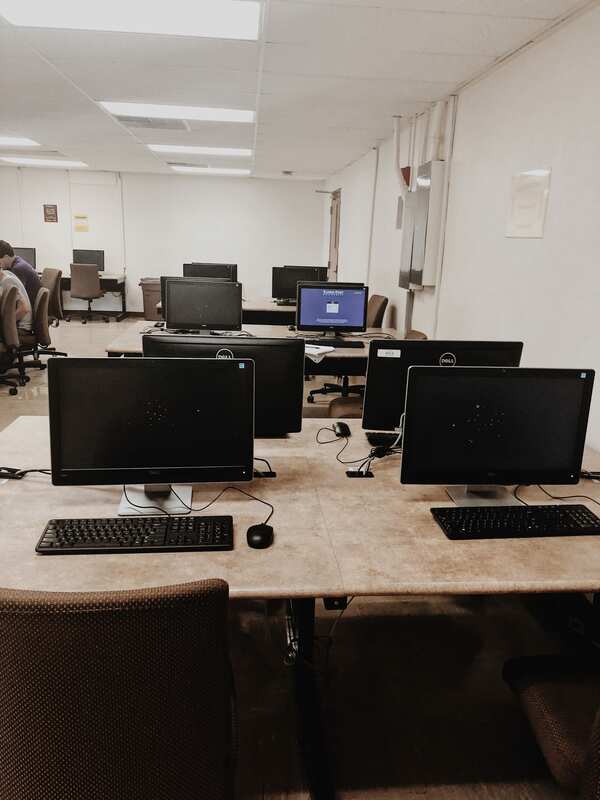 The full list of hours, dates and locations can be found at the Libraries website, but to give you an inside look, my coworkers and I did a quick tour of a few lesser-known study spaces. The following buildings were not highlighted in our beginning-of-semester post about study spots, which featured a massive picture of my head that still haunts me. All of these spaces are reserved for quiet study, which is the hardest to come by on campus during finals week. The Alumni Center was our first stop. 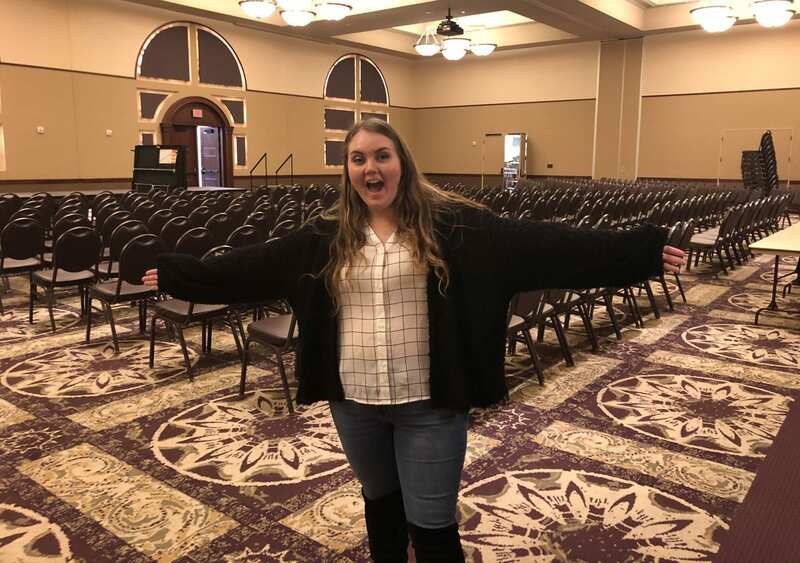 My coworker Rebekah, a senior in public relations and K-State Libraries student employee, shows off the space in the Alumni Center Ballroom on the first floor. In addition to setting up their massive space with tables and chairs, they have several small meeting rooms (just ask at the front desk about availability). The Alumni Center will also serve free coffee 8-10 a.m. on Monday and Tuesday (while supplies last). The KSU Foundation at 1800 Kimball Avenue is offering up their enormous conference room on the main floor. Two perks: It’s right next door to Bluestem Grille, and it’s on the aTa Bus line (Office Park/Grain Campus stop). 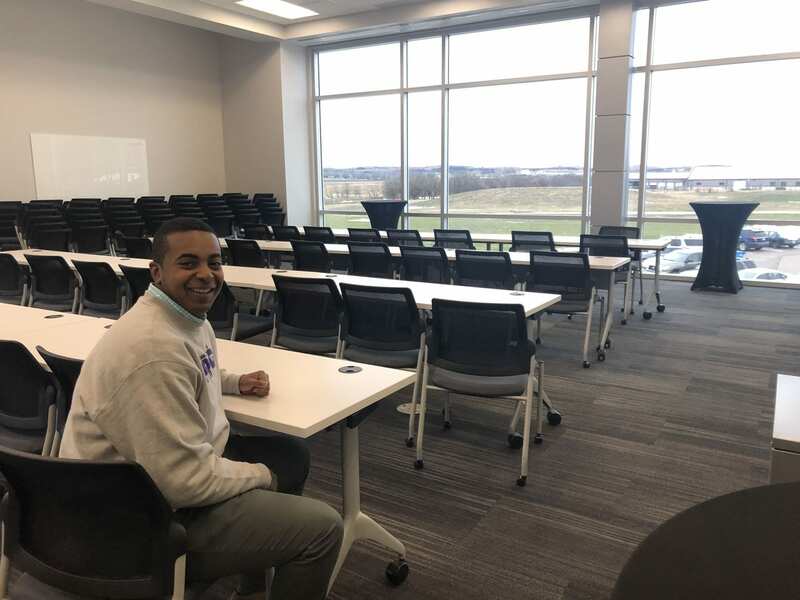 Avery, senior in political science and philosophy and KSU Foundation student employee, poses in their enormous conference room. This is one of the few spaces on our list of study spots that has great natural light. 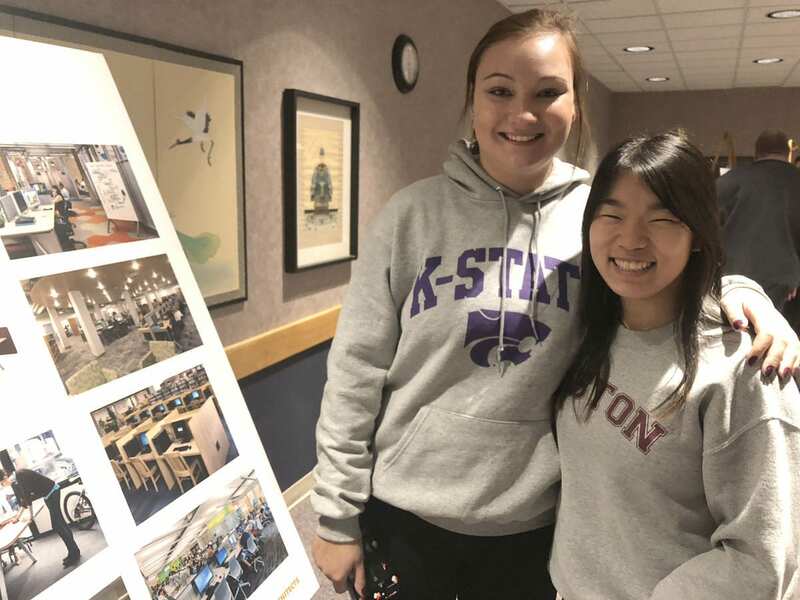 Students looking for space that’s open all night should head to the K-State Student Union. In addition to the usual Union study spots, they’ll have their ballroom set up for studiers; that area will stay open until midnight. 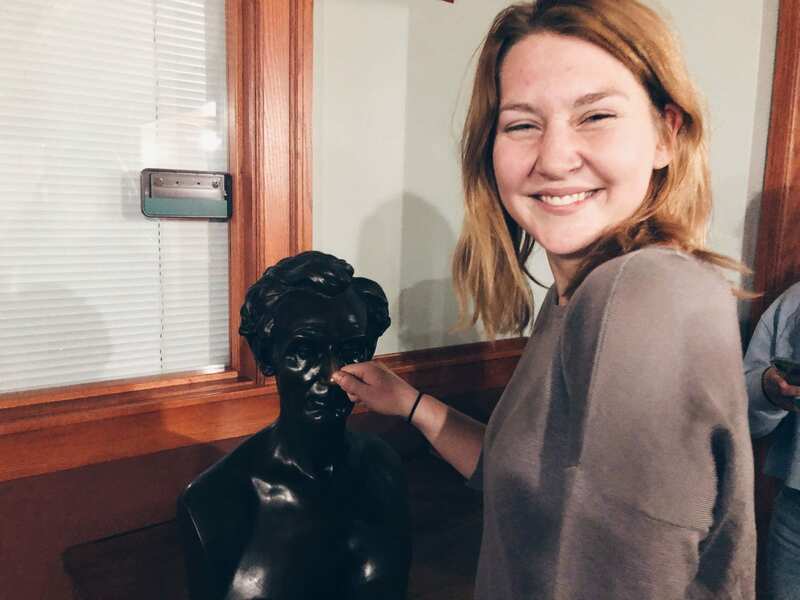 Emma, sophomore in marketing and K-State Libraries student employee, being a good sport for this blog post. Holtz Hall will be open from 9 p.m. to 2 a.m. Sundays through Thursdays, and they offer two dozen study rooms. 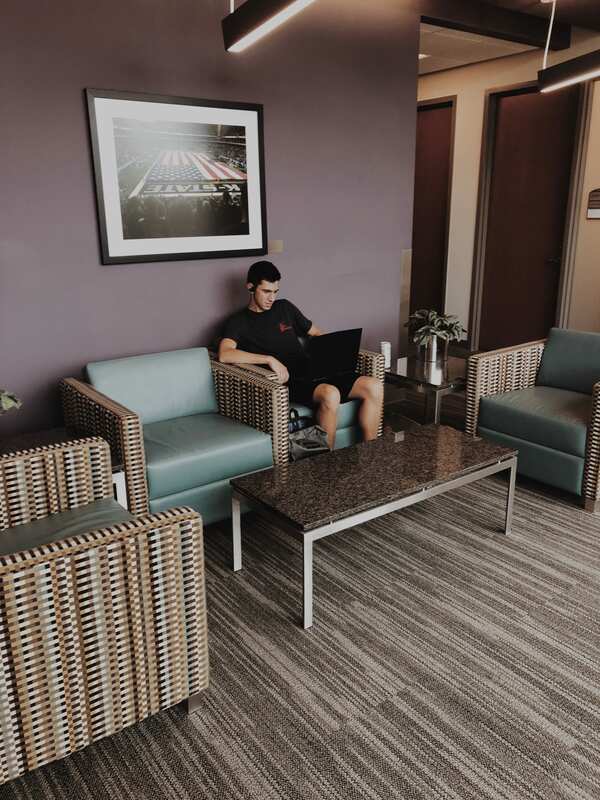 The Berney Family Welcome Center has twenty-three study rooms that would be great for small groups of two to four; they’re free from 8 a.m. to 11 p.m. Monday through Thursday (check at the welcome desk for availability). 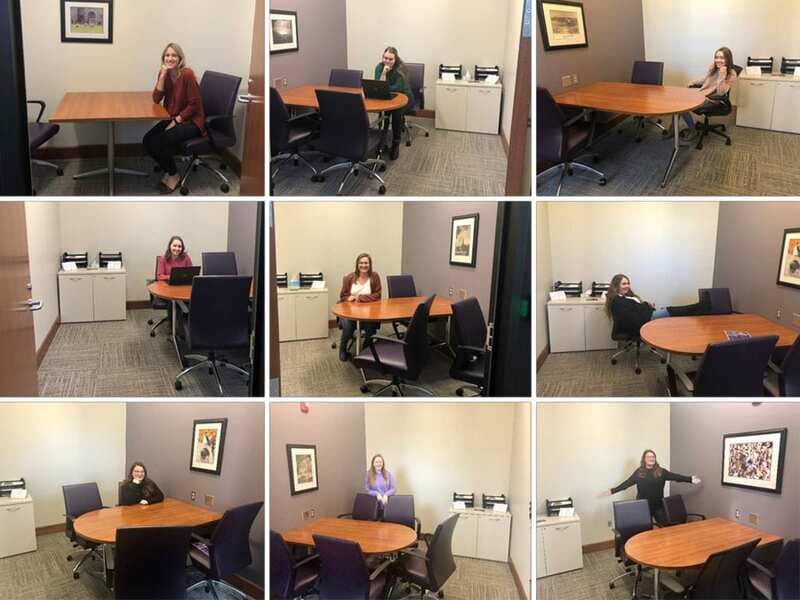 Nine of the twenty-three small meeting rooms in the Berney Family Welcome Center. Again, we have a guide online that outlines dates, hours, and details about these study spaces and many, many more (21 in all)! We hope these will help lessen student stress, even though finals week will remind us all again how much we miss Hale Library. Watch, read and wear all things Hale Library! Maybe it’s the coming holiday season, but we’re feeling reflective. 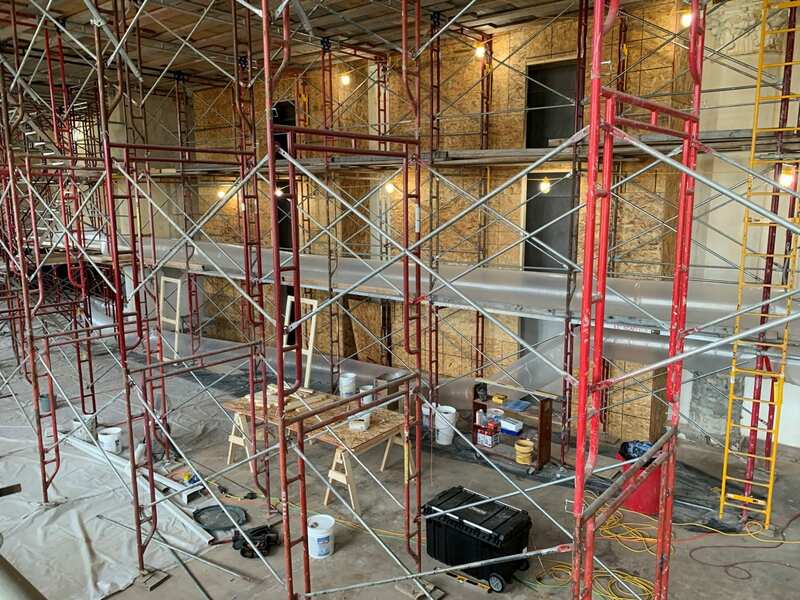 Join us in looking back at our post-fire Hale Library progress via some exciting releases (video, print, and apparel) that you might have missed. 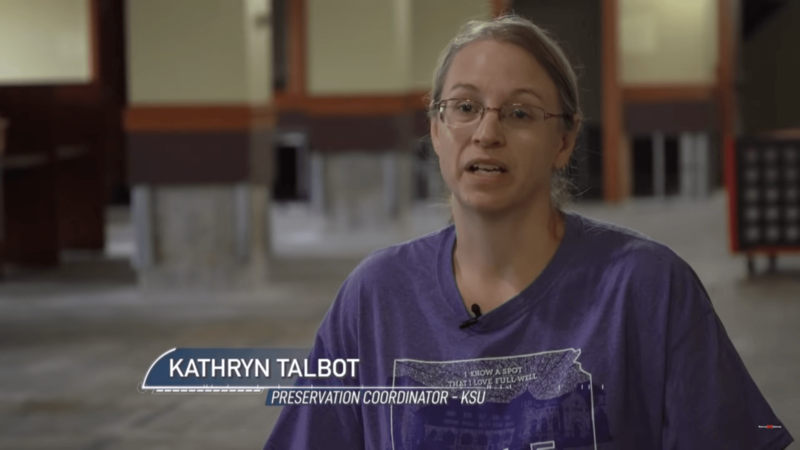 We are so excited about this KSU Foundation video that was presented at the Friends of the K-State Libraries gala. It includes some intense live footage that hasn’t been seen widely. 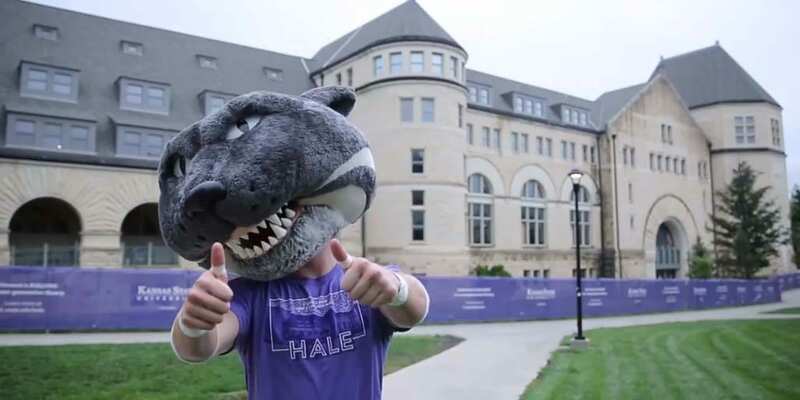 Hale Library: A Next Generation Library from KSU Foundation on Vimeo. That’s exactly what keeps us excited about coming to work every day and creating the news you read about Hale Library! 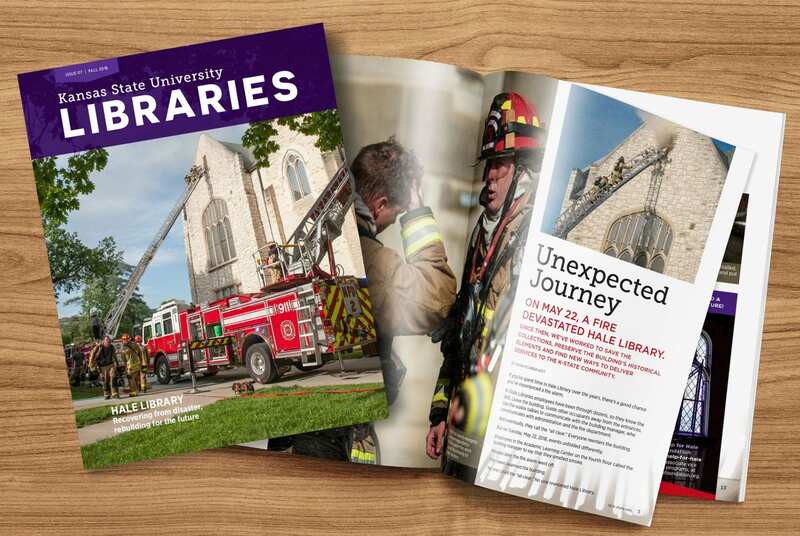 Speaking of reading, if you’d like a more in-depth version of what’s happened in the last six months, we hope you didn’t miss “Unexpected Journey,” in the most recent K-State Libraries Magazine. When we were planning this issue last spring, we didn’t think we’d feature firefighters on the cover. An overwhelming amount of work has occurred since May. This is a great place to get a recap, view photos not seen elsewhere and take in some inside points-of-view from our administrators and faculty. 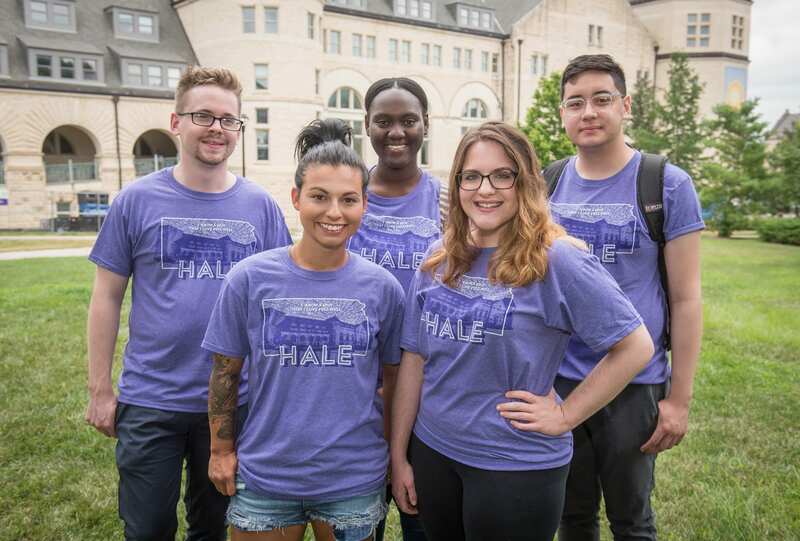 Finally, if you’re looking for the perfect gift for someone in your life who loves comfort, K-State and all things purple, consider the Hale Library t-shirt. On campus, it’s available at the Library Help Desk in the K-State Student Union, or you can order it online via the K-State Super Store. Proceeds go to the Help for Hale fund, which will assist with renovation efforts. K-State Libraries student employees, from left to right: Patrick Dittamo, Skyler Gilbert, Hawa Dembele, Carleigh Whitman and Andrew Le. This month we took some time out for expressions of gratitude. One of the highlights? A very special visit to the Manhattan Fire Department Headquarters. Left to right: Mike Haddock, A.J. Mueller, Battalion Chief Jason Hudson, Rebekah Branch, Carol Sevin, Brenna Leahy, Jesica Sellers, Robin Brown, Nick Clark, Captain Micah Hydeman, Darchelle Martin, Sarah McGreer Hoyt, and Captain Lou Kaylor. November 16, 2018. 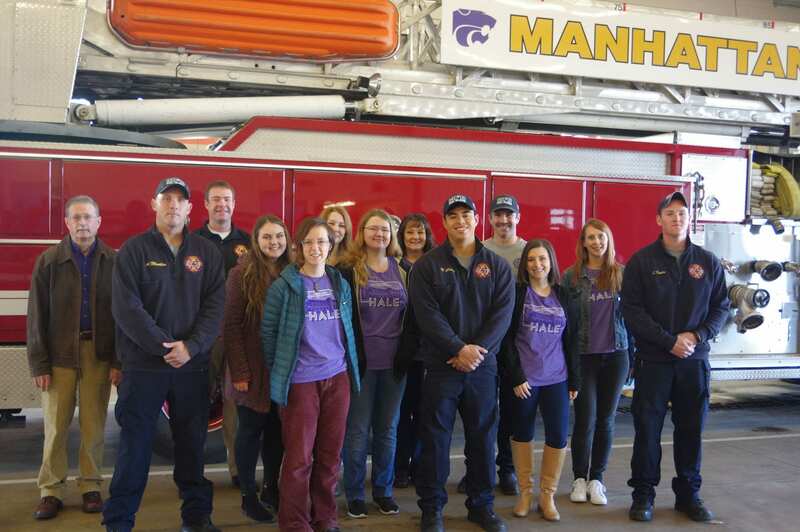 On November 16, a group of K-State Libraries employees met at Station 1 on the corner of Denison and Kimball. We were greeted by Battalion Chief Jason Hudson and his team. 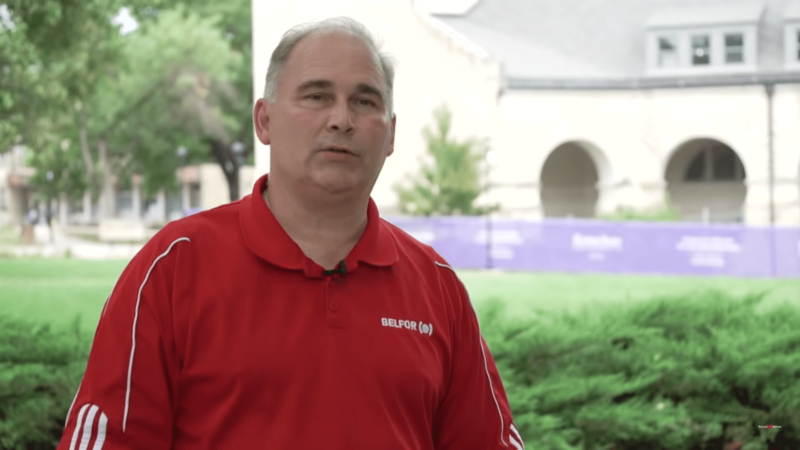 Hudson, who was a K-State freshman during Hale Library’s construction, was in charge of the scene on May 22. 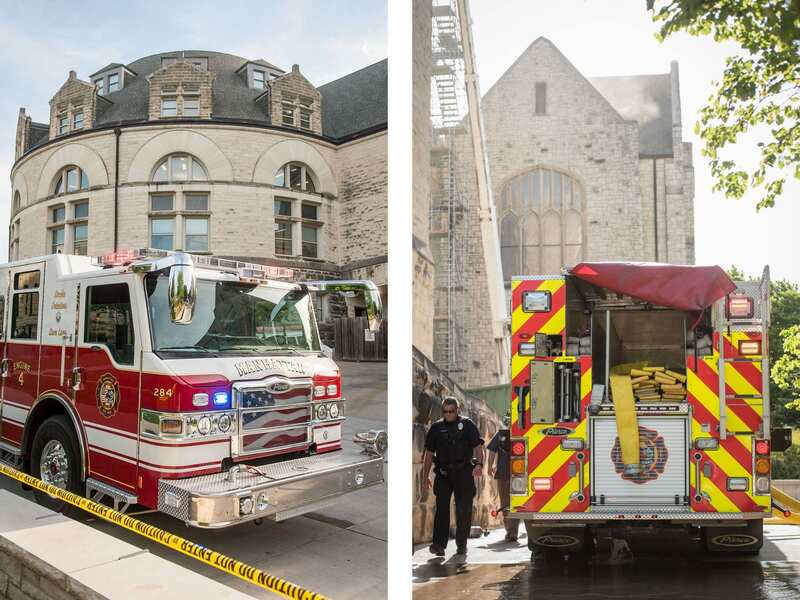 A fire engine extends its ladder onto the northwest corner of Historic Farrell Library. May 22, 2018. “So I get out of my vehicle and I talked to some folks that are outside already, and they’re like, ‘Yeah, there’s some smoke on the fourth floor.’ I was thinking cooking smoke, or something like that. 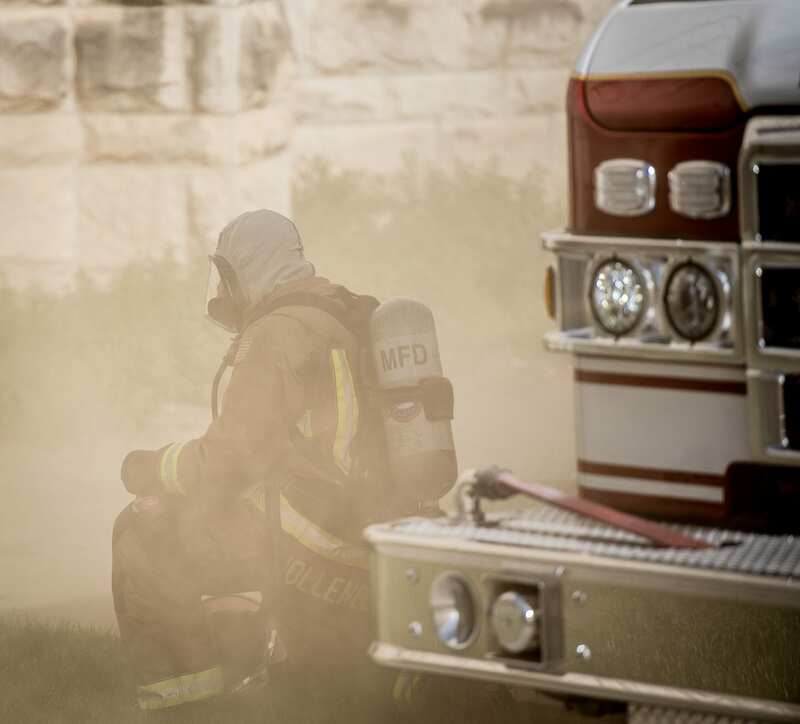 A firefighter stationed at the southwest corner of Hale Library sprays water onto the rooftop fire. May 22, 2018. “And I said, ‘Oh. We have a big fire.’ I actually thought the roof was going to come off the building. In fact, I moved trucks back thinking that the roof was going to burn off. That was my first impression of it. More than 70 firefighters and a dozen emergency vehicles responded to the scene. May 22, 2018. “I actually ended up going inside with my crews and I couldn’t believe… It was almost like, ‘This building’s taken a kill shot.’ I knew it immediately when there was zero visibility… we were fortunate that everybody made it out of there when they did, because it could have been bad. Had anyone stayed in that building thinking it was nothing they would have been overcome by smoke …. Firefighter Nate Hollenbeck rests after a shift inside of Hale Library. May 22, 2018. Hudson also talked about challenges the building presented. “[T]ypically we don’t like to be on top of fire. We’d rather be under it, pull the ceiling down and then putting water on. [In Hale Library] you can’t! There’s concrete [between the floors]. We spent a lot of time trying to pull ceiling, and we couldn’t do it, so we had to get on top of it and go down. 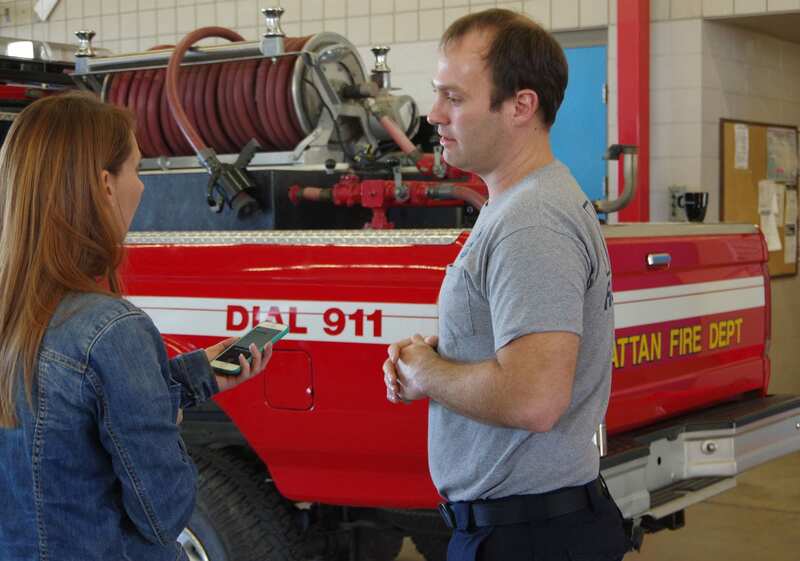 Captain Dan Newton tells Sarah McGreer Hoyt about his team’s experience fighting the Hale Library fire. November 16, 2018. Initially his crew didn’t go … but when they started getting radio traffic that smoke was coming from the eaves, they came to the scene. After an assignment clearing the Great Room, they went to the roof. At left: Crews access the roof via scaffolding that was erected as part of a roofing project. 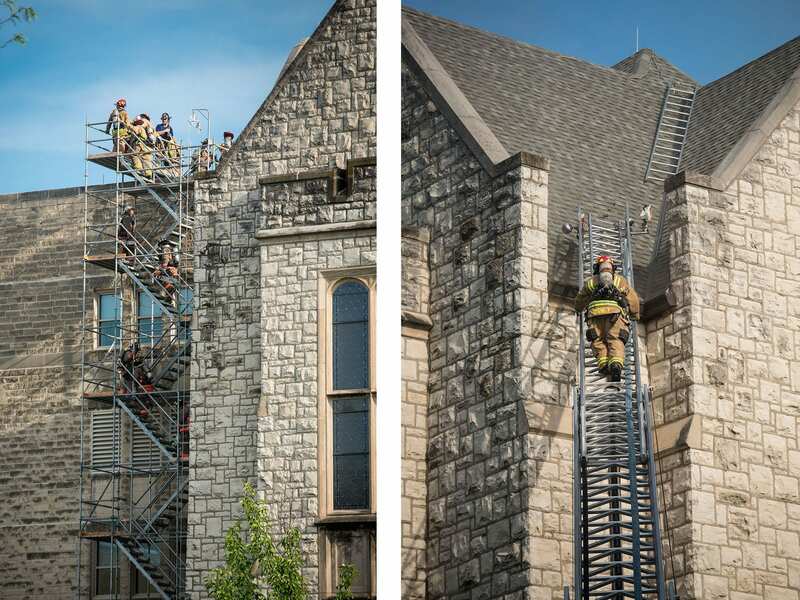 At right: A firefighter climbs an extension ladder to access the roof at the northwest corner of Historic Farrell Library. May 22, 2018. “[W]e did multiple revolutions on the roof, which was the best place to be. We spent several revolutions cutting holes, using special nozzles that you can stick in a hole and get water to confined spaces. It was a very tough operation. It’s always a great team-building experience when you have something big like that. 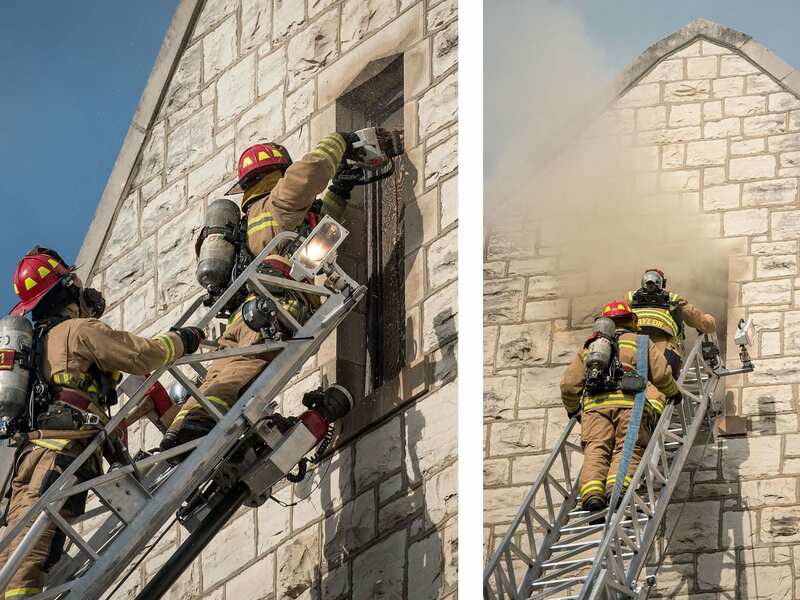 Firefighters cut through wood to access the attic via a small window on the east end of Historic Farrell Library. “I can just remember my whole entire crew cramping up … and getting to that point where knowing okay, we’ve pushed to our limit here … and you know so we did that multiple times, not just once …. MFD firefighters, from left to right: An unidentified firefighter, Nate Hollenbeck, Captain Clint Castor, Kody Songs and Louie Disney. We don’t always get to hear about the fire from those who experienced it first-hand, so we’d like to extend a huge thank you to Chief Hudson and Captain Newton. Thanks, too, go out to Captain Micah Hydeman and Captain Lou Kaylor, as well as Scott Helberg, Nick Clark, A.J. Mueller, Lawilson Horne and the rest of the crew. 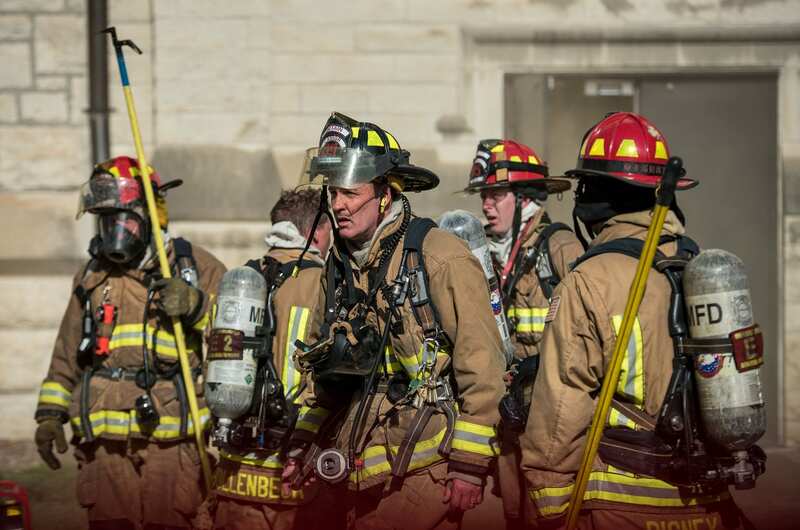 Thanksgiving, November 22, marks six months since the Hale Library fire, so it’s a fitting time to give thanks for the MFD and all of the other emergency personnel who were there that day, including the crews from Fort Riley, Blue Township, Riley County EMS and more. We’re deeply grateful for these and for all first responders this holiday season, and we’re wishing them health and safety today and always! 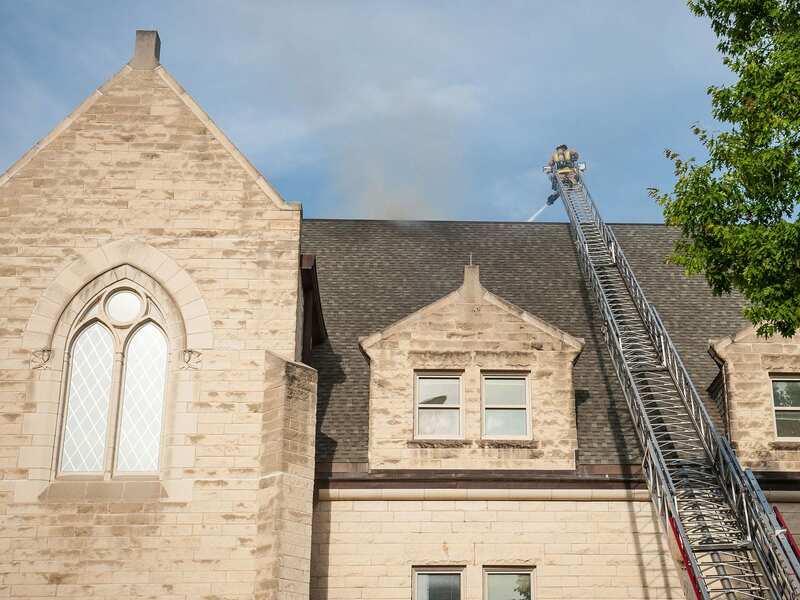 Photos of the May 22 Hale Library fire courtesy K-State University Photo Services. 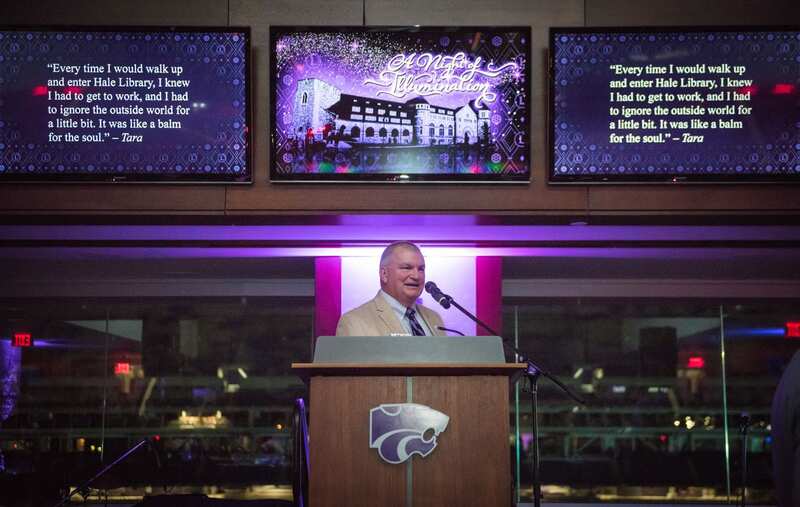 On November 2, 2018, more than 200 revelers gathered in the Bill Snyder Family Stadium for “A Night of Illumination.” The gala attendees—Friends of the K-State Libraries, long-time supporters and event sponsors, students and librarians—all held one wish in common: To see a new, renovated Hale Library functioning at the heart of the K-State campus. 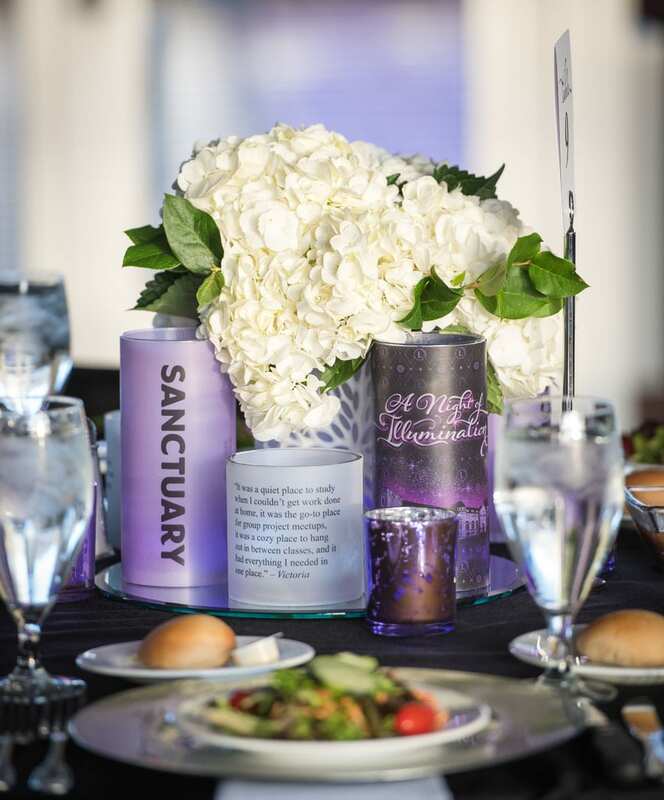 Clusters of white hydrangea and lavender candles punctuate the table arrangements. 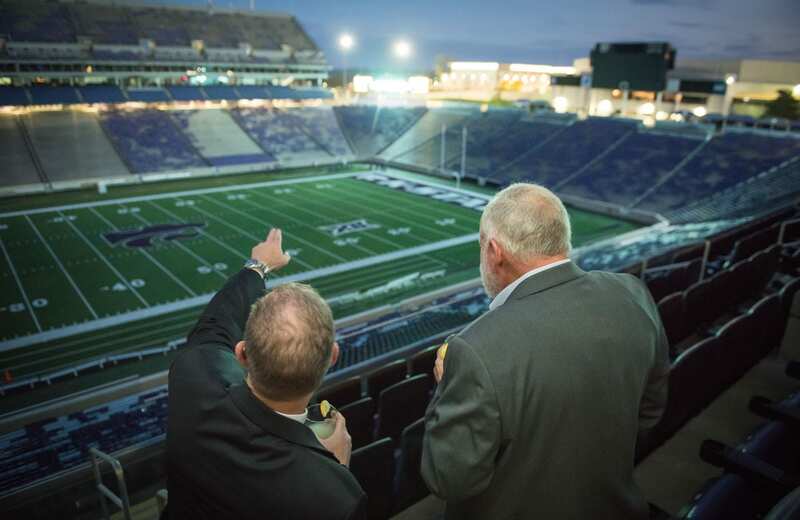 Guests enjoy the views afforded by the beautiful West Stadium Center venue. 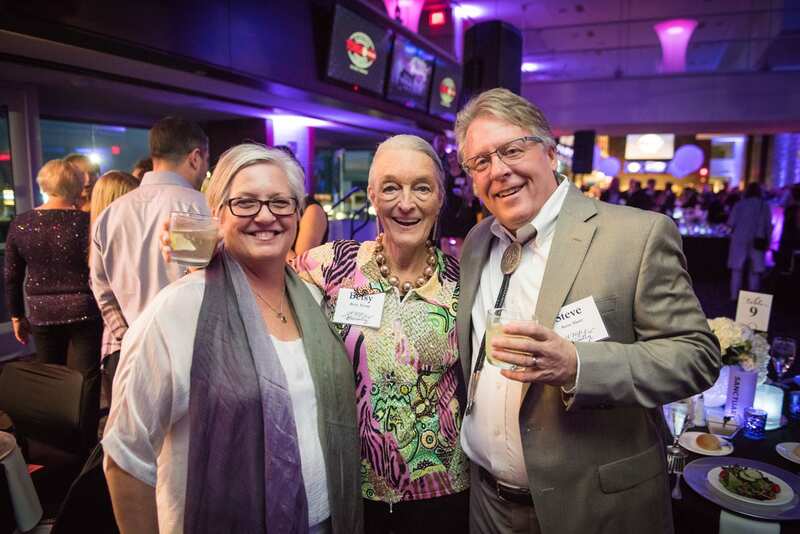 Gala co-chair Whitney Short, Betsy Young and Steve Short pause to smile for the camera. Long-time Friends member and former president Mark Knackendoffel kicks off the evening’s events. President Richard Myers listens to the presenters. Ruth Dyer and Mark Knackendoffel dance to music by Dr. Wayne Goins & the Rhythm & Blues Machine. Tiffany Bowers, Chair of the K-State Libraries Student Ambassadors; Andrew Kohls, Friends member; Sara Kearns, librarian and student ambassadors adviser; and Taylee Helms, student ambassador. Bowers delivered an impassioned testimonial about the out-sized role Hale Library played during her K-State career. 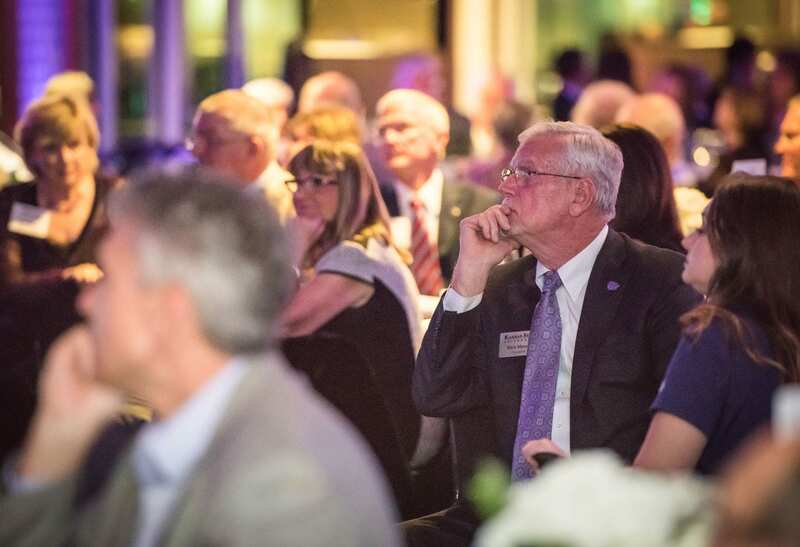 Thank you to everyone who planned, sponsored and attended “A Night of Illumination.” After a dark season in our history, it felt good to celebrate with light, music and our K-State friends. Now, as we end the recovery phrase, we look forward to sharing our vision for Hale Library. It’s done! 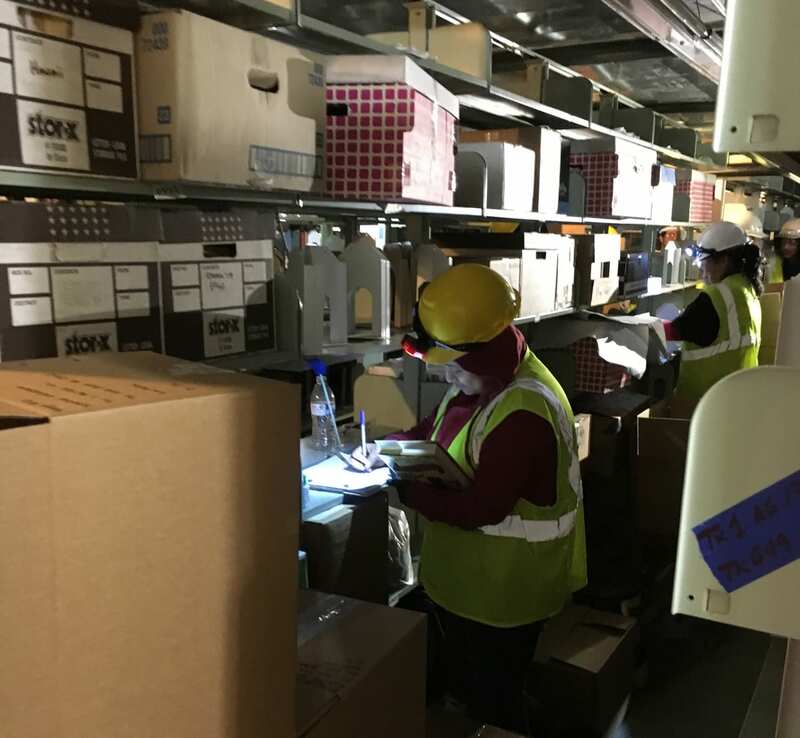 Thanks to hundreds of workers putting in thousands of hours, more than 1.5 million collection items have been packed out of Hale Library. The herculean effort was completed on September 20, a little less than 17 weeks after the fire. Maybe you work with objects in quantities of 1.5 million on a regular basis and can easily wrap your head around how big this project was. But if that’s not the case, we’ve crafted some comparisons to help everyone visualize the scope of the situation. 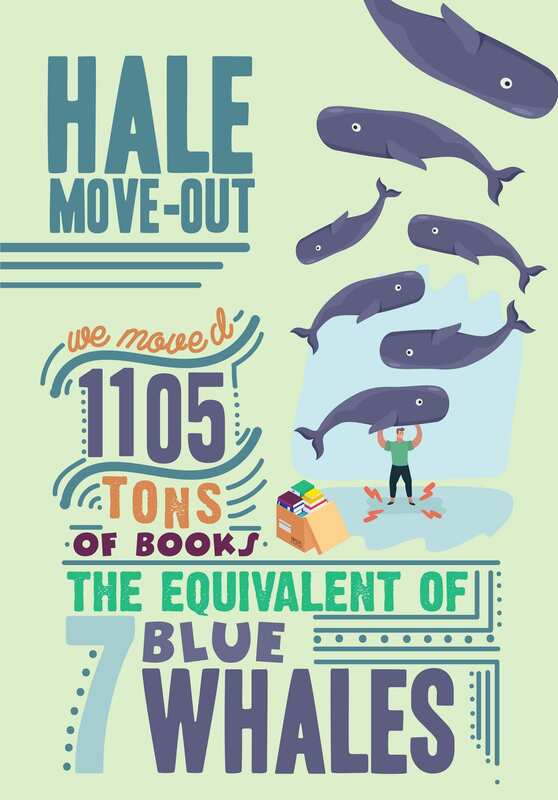 If the average storage box filled with books weighs 15 pounds and a large blue whale weighs 300,000 pounds, then 147,400 boxes would weigh more than 1,105.5 tons, which is the equivalent of more than 7 blue whales. 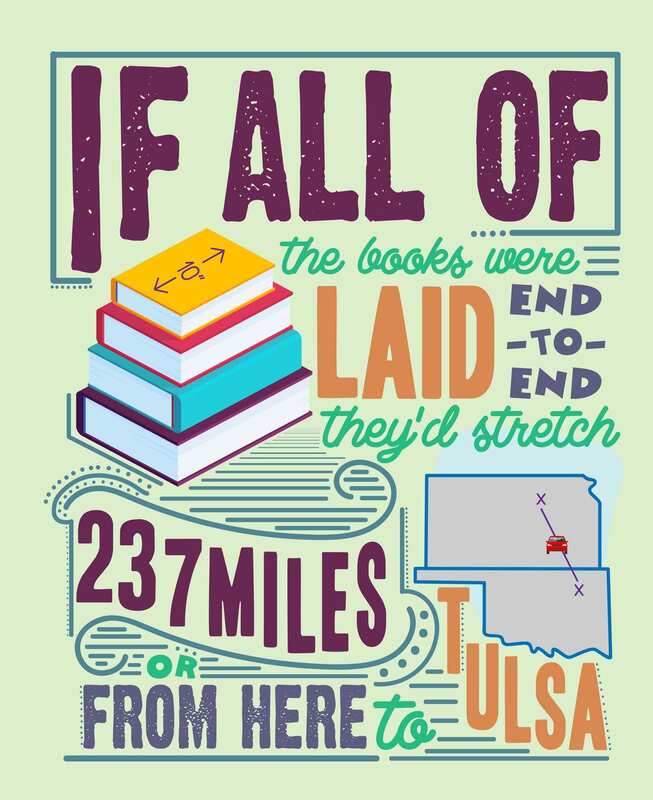 If each item measures 10 inches long and there are 5,280 feet in a mile, then all of Hale Library’s 1.5 million collection items laid end-to-end would stretch from Manhattan to Tulsa, Okla. If a storage box measures 12 inches and Mt. 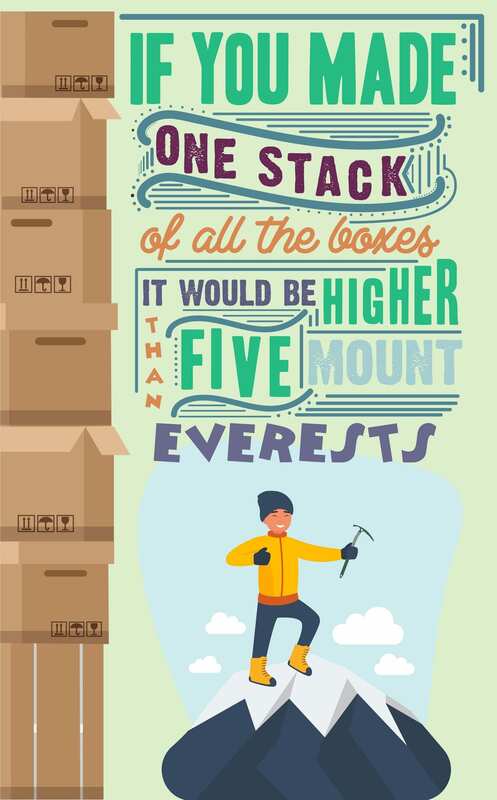 Everest is 29,035 feet high, then 147,400 boxes stacked on top of each other would stretch higher than 5 Mt. Everests. So how did this massive pack-out all start? The first things to leave Hale Library after the May 22 fire were the wet materials in Room 117. 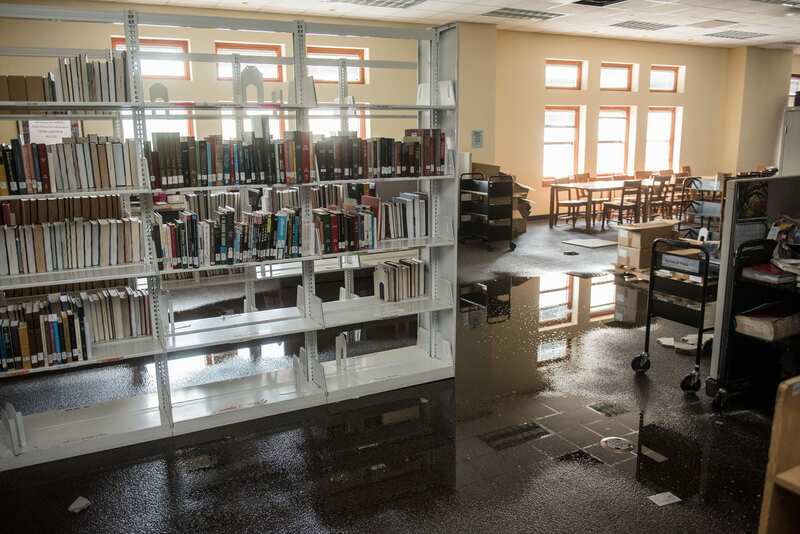 In addition to the items in Room 117, the books behind the Library Help Desk on the second floor were soaked, too. As water caused them to expand and press against each other, the wet volumes began to arc off of the shelves. After the wet books were packed out, their outlines were starkly visible in the soot that coated the white metal shelves. May 31, 2018. Those 4,000 boxes of wet books were shipped in refrigerated trucks to a Belfor preservation lab in Ft. Worth, Tex. The materials were freeze-dried, cleaned and treated with ozone. More than ninety percent were deemed salvageable. After the wet books were safely out of the building, volumes from second, third and fourth floors were packed up. 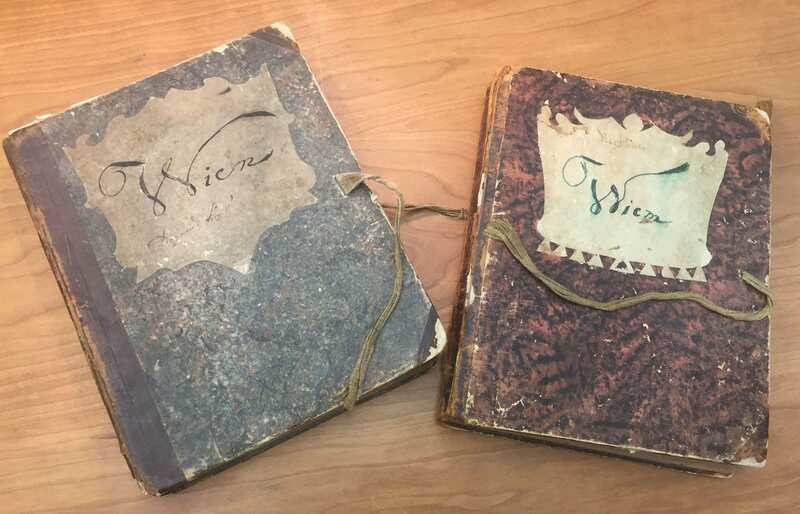 The last items to leave Hale Library came out of the Richard L. D. & Marjorie Morse Department of Special Collections on the fifth floor. Belfor workers pack special collections materials out of the Morse Department of Special Collections’ Stack H. August 31, 2018. A crew member packs volumes from the cookery collection, which is one of the top research collections of its kind in the United States. It contains thousands of cookbooks and related volumes that date from 1487 to the present. August 31, 2018. 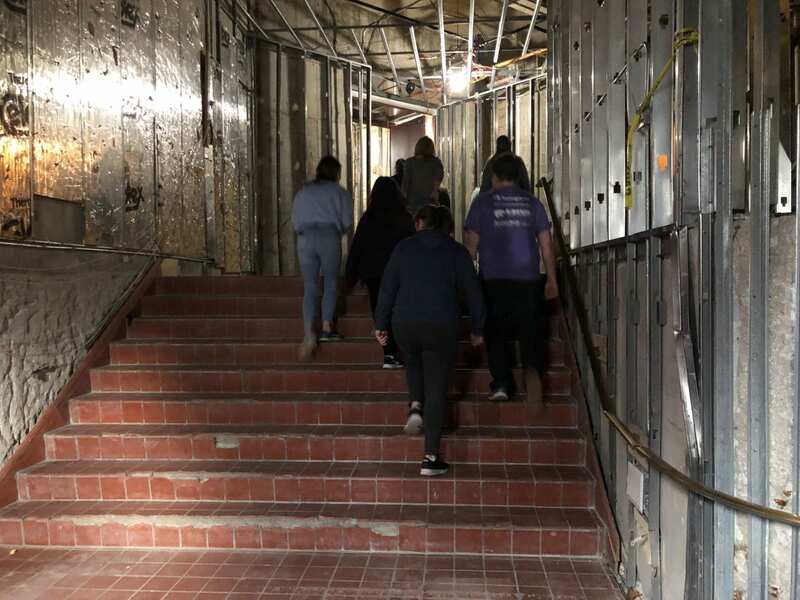 So from beginning to end, the pack-out started in late May on the hot, humid first floor, and it ended in late September in a chilly, air-conditioned Stack H, just above Hale Library’s fourth floor. Kathryn Talbot, K-State Libraries’ preservation coordinator, at work in the stacks. July 5, 2018. Does that give you a better idea of how big this project was? No? 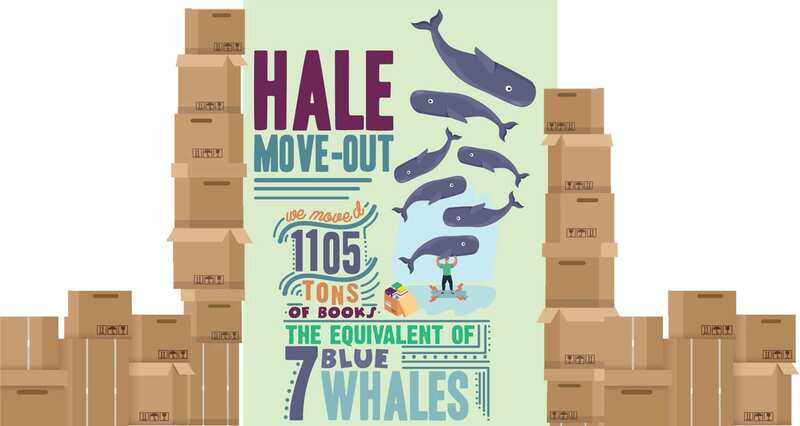 Here’s another story problem: If 15 books fit in each box, and 40 boxes were stacked on one pallet, and 24 pallets were packed onto every truckload that left Hale Library, then the 1.5 million items required 104 semi trucks. 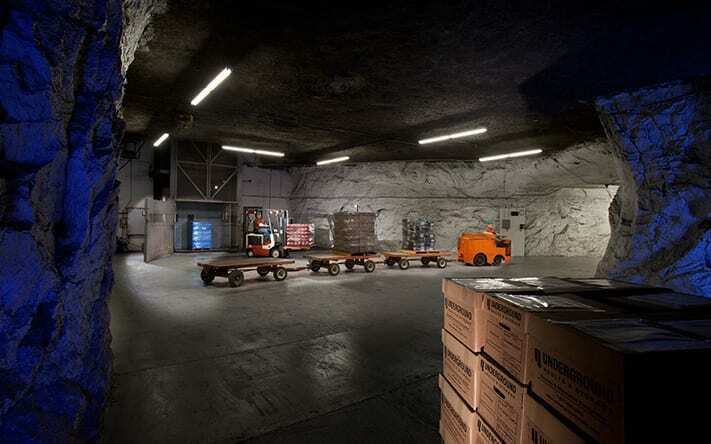 A semi truck backs a load of boxes into the Libraries’ cave space at Underground Vaults & Storage in Kansas City, Mo. August 13, 2018. 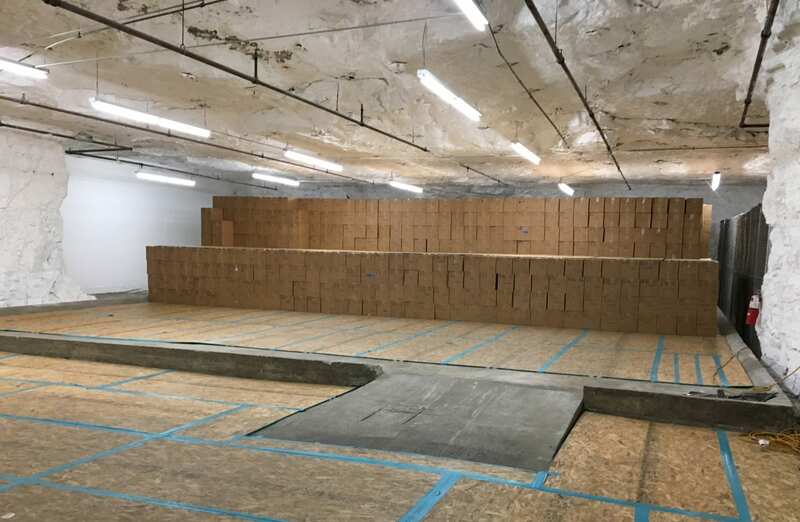 Until Hale Library is renovated, all of the books—approximately 147,400 boxes of them—will be stored in four different air-conditioned warehouses across the region. 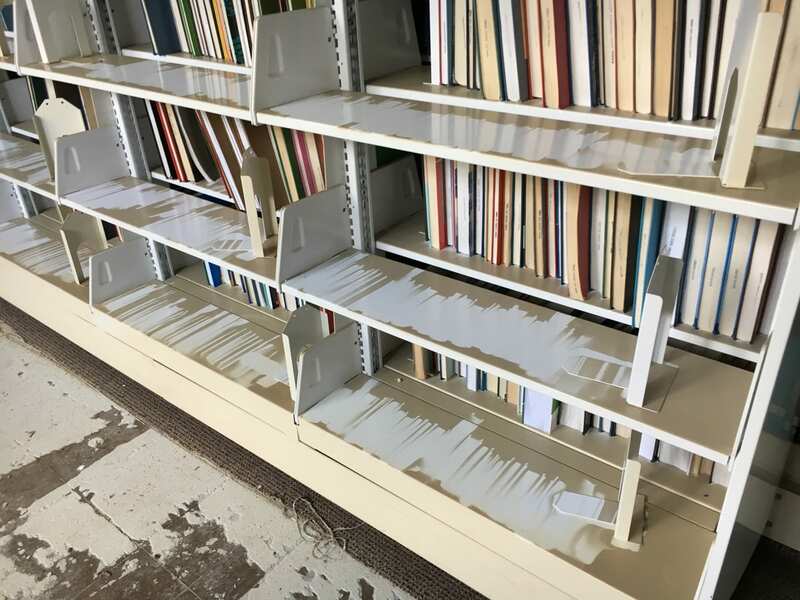 Because of the soot damage, books will be individually cleaned, re-boxed and stored until they can be returned to campus. In the Kansas City caves. August 22, 2018. It is a huge relief to have the entire collection safely out of the building and know that it will come home to a new, improved Hale Library. Thank you to everyone who worked on this project. We hope you can take a few days off to catch your breath: You deserve a break before you start planning how we’ll move it all back! Original infographics created by Katherine Kistler, K-State Libraries graphic design student employee. 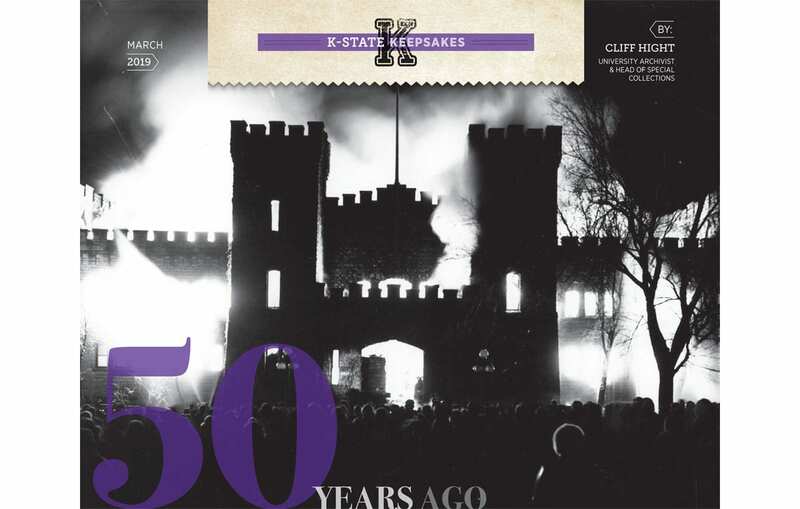 The last several months have been some of the darkest times in K-State Libraries’ history. Now, more than 100 days since the Hale Library fire, we’re at a turning point. 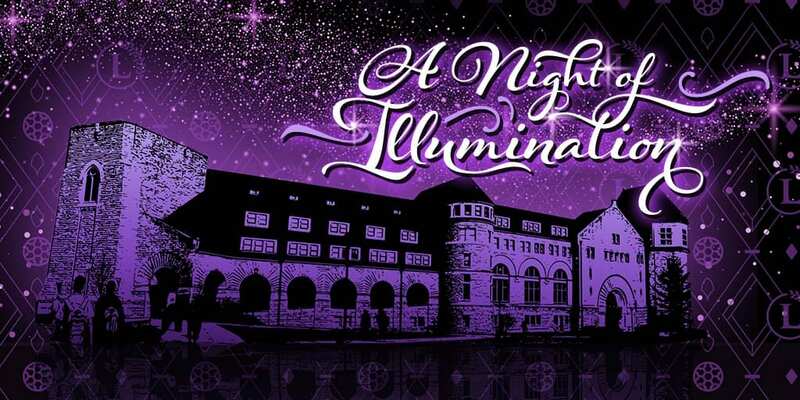 On Friday, November 2, 2018, the Friends of the K-State Libraries will mark this moment by presenting A Night of Illumination. This marks the twenty-eighth annual Friends event. 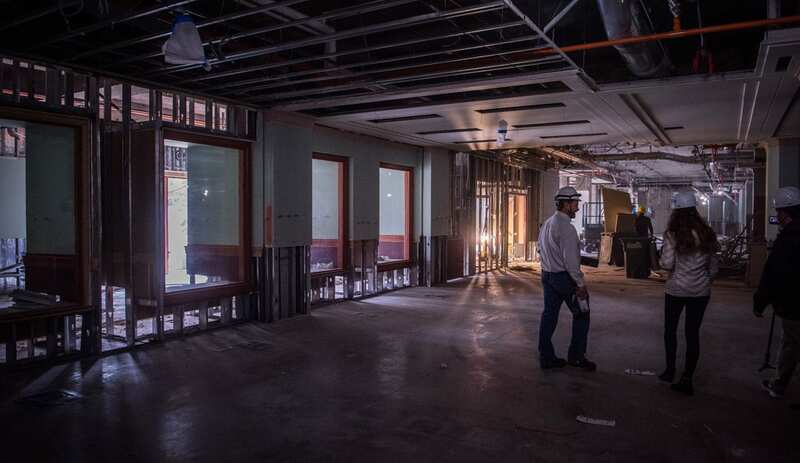 Except for a few celebrations that were held off-site during Hale Library’s construction in the ’90s, they’ve always been held in Hale Library. 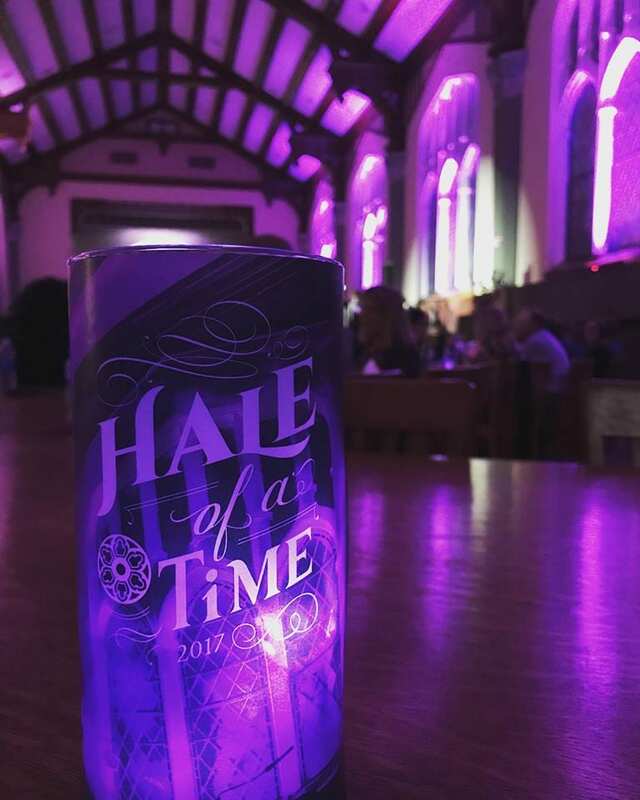 In 2017, the theme was “Hale of a Time,” and guests traveled to various food and entertainment stations throughout the building. 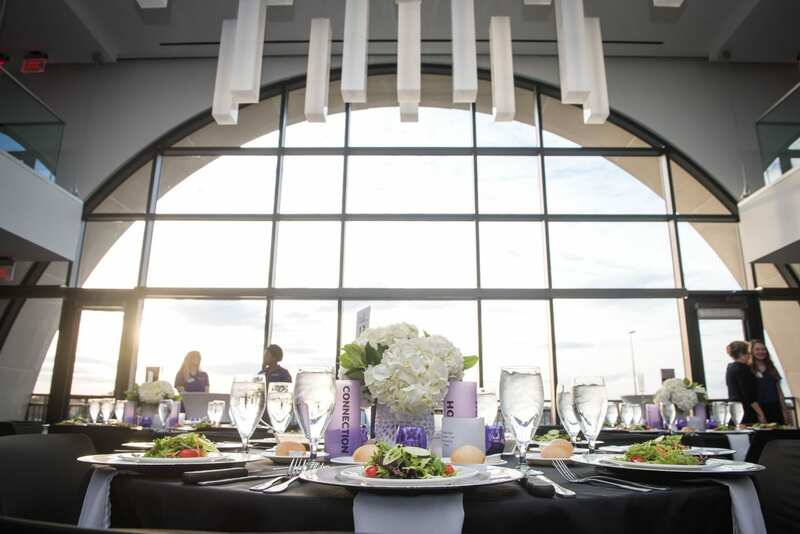 This year, we’ll gather in beautiful West Stadium Center, Bill Snyder Family Stadium. We hope some of our blog readers can join us to make a toast to resilience, new possibilities and boundless aspiration. 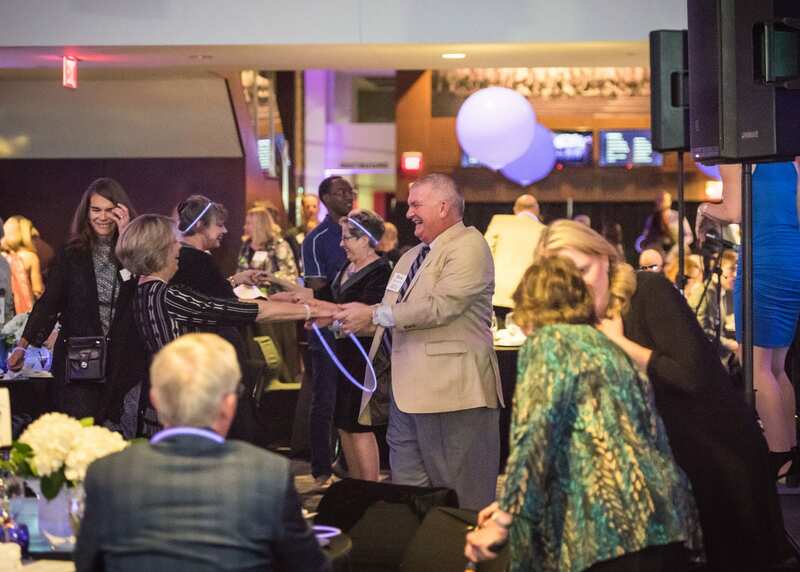 Our celebration in West Stadium Center won’t be the first time we’ve collaborated with K-State Athletics on a gala: In 2014 we teamed up to raise funds for improvements to a classroom used by Academic Learning Center, the athletic tutoring space in Hale Library. Guests will enjoy cocktails and hors d’oeuvres followed by dinner, dessert and a performance by Dr. Wayne Goins & the Rhythm & Blues Machine. We’ll also be able to share a glimpse of the vision for the new Hale Library from PGAV architects. 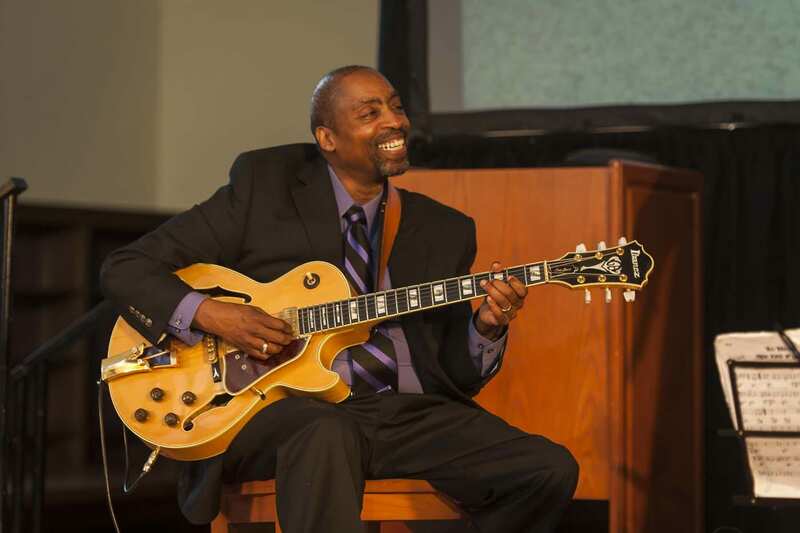 Dr. Wayne Goins always delivers music that makes a party feel special. 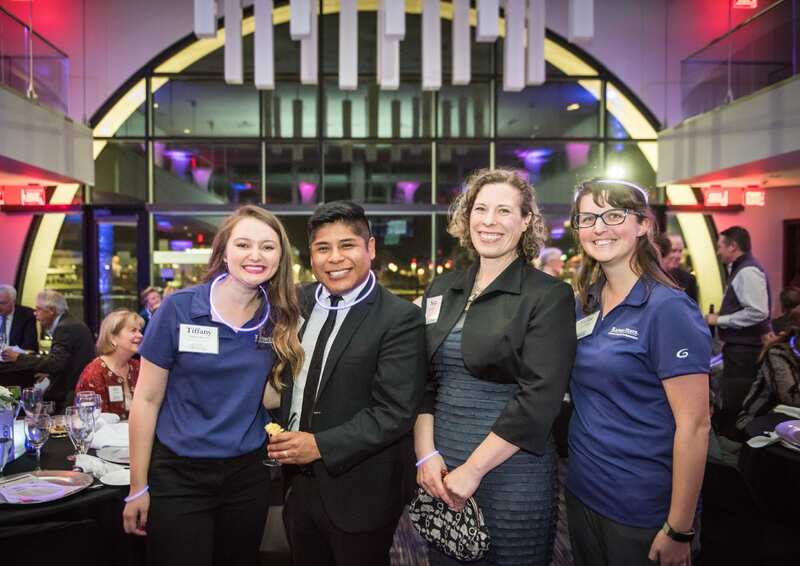 The 2016 theme was “Constructing the Future,” and the event raised funds for the first floor renovation. Once again, the food at this year’s gala will be impressive and plentiful. Dress is cocktail suggested but not required. Tickets are $100 and can be purchased online or via phone at 785-532-7417 by Friday, October 19. 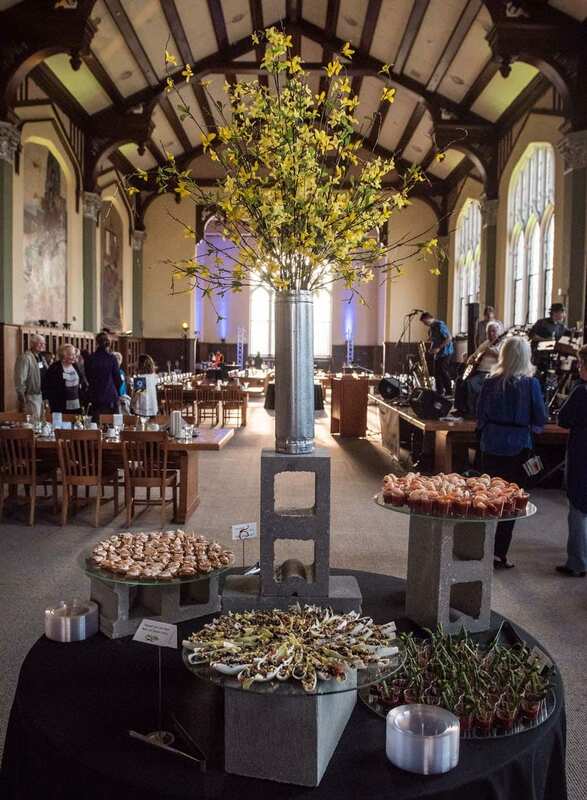 Proceeds leveraged by the event will go toward Help for Hale, a fund devoted to making Hale Library the light on campus that it has been for two decades. 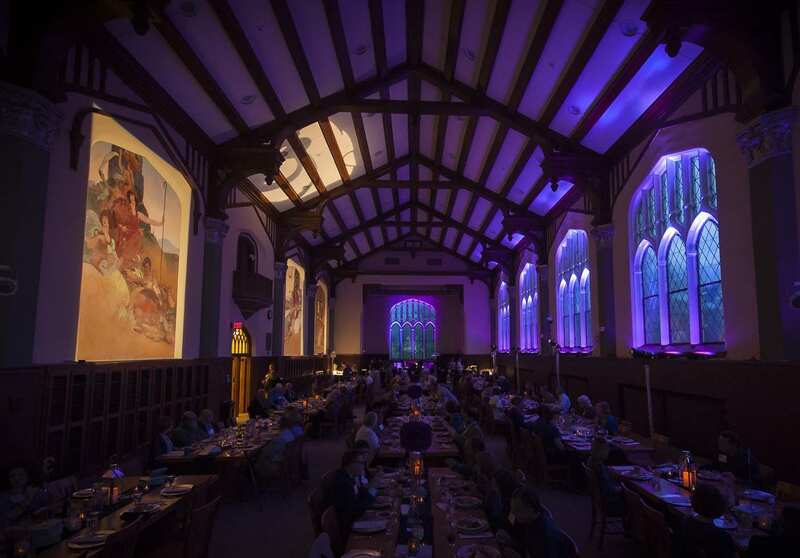 Attendees to this year’s gala will help raise the funds we need to return the Great Room and Hale Library to its full glory. Questions? Contact Darchelle Martin at 785-532-7442 or martin05@k-state.edu. As we walk across campus, we’re often stopped by fellow K-Staters and asked, “So how are you all doing?” Truly, we’ve appreciated the expressions of concern for the 100+ displaced Hale Library folks. On that note, we thought we’d catch up with four of our co-workers who share a combined 80 years of experience with K-State Libraries. Renee Gates, IT coordinator for Libraries’ Information Services & Technology (LIST), in her new Seaton Hall office. 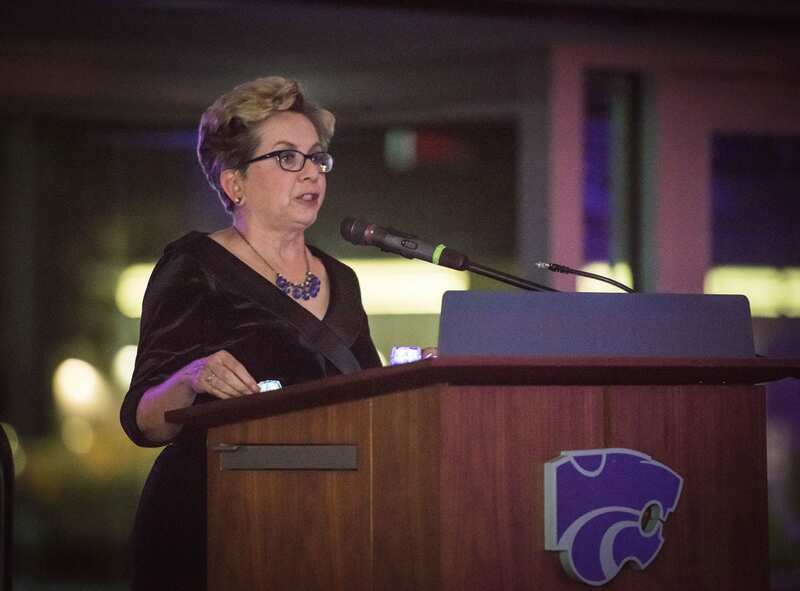 She has worked for K-State Libraries for 27 years. 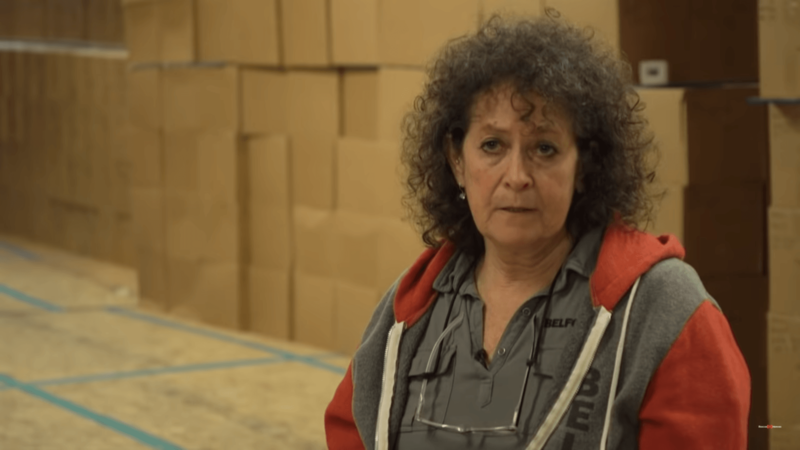 After all of the computers and printers were lost in the fire, Renee Gates was responsible for getting more than 90 employees set up with new technology. She and her team also travel between a dozen different buildings on campus to make sure everything continues to work smoothly. Renee, two of the four staff members on your team left Manhattan to pursue new job opportunities this summer. How are you doing? “Everybody has been really nice and patient with us. They understand we are short-staffed. 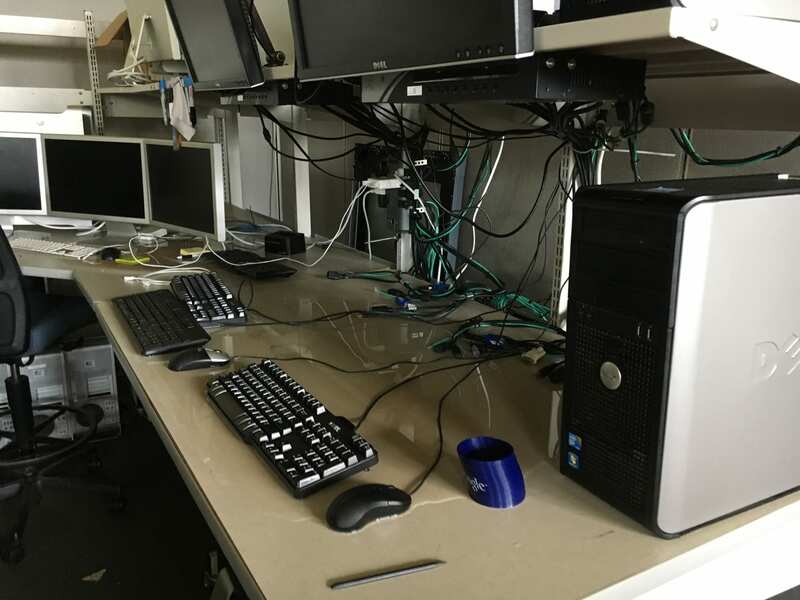 In addition to getting everyone set up on new technology, we’re doing a lot of inventory of the tech that was in an area of Hale Library that was declared clean or cleanable. Everything has to be plugged in and tested to make sure it works. Some things don’t because of internal issues like the effects of condensation. After the fire, I think in many ways our department had it a lot easier than other people. We had the most to do initially, but we were connected, we knew what was going on, and we had purpose. I think there was a lot more anxiety for people who weren’t as busy as we were. So that busyness helped get us through. 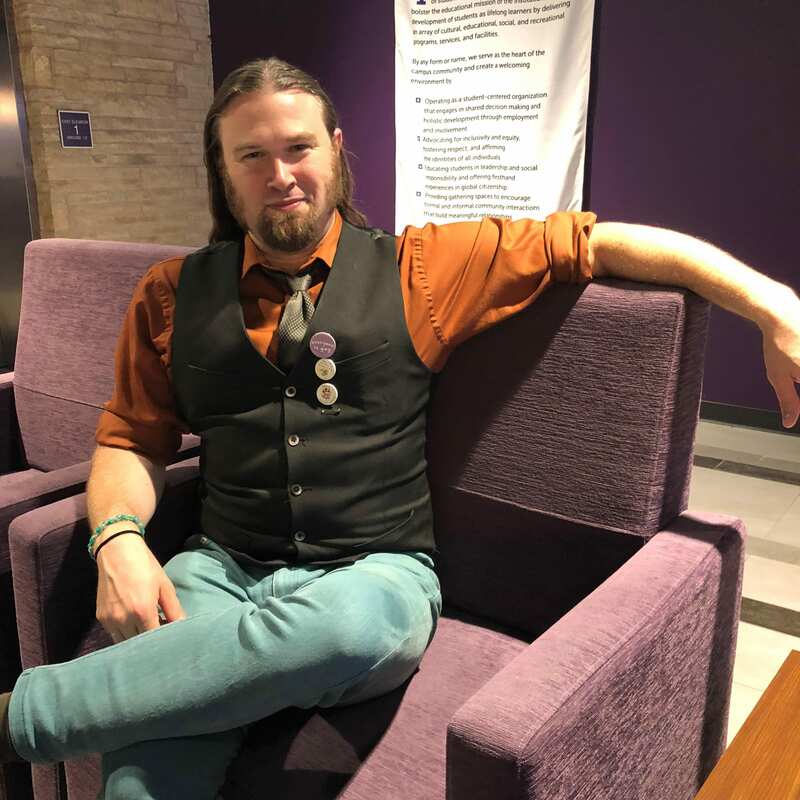 Dan Ireton, academic services librarian, is an associate professor who works primarily with faculty and students in philosophy, political science, and theater and dance. He’s been with the Libraries for 13 years. Dan, what do you remember about the day of the fire? “I was in my office, and my 15-year-old son was with me because he was out early that day and doing homework on a computer. We had this history in Hale Library that the fire alarms were sensitive to dust. One summer it seemed like a fire alarm went off every week. So the alarm goes off and it’s like, ‘Eh, okay, well… it’s the end of the day.’ So I scooped up my stuff. And I remember thinking so clearly, ‘Do I need my laptop tonight? Nah, I’ll get it in the morning,’ and I left it and we went home. What’s different about your job since you aren’t working out of Hale Library? 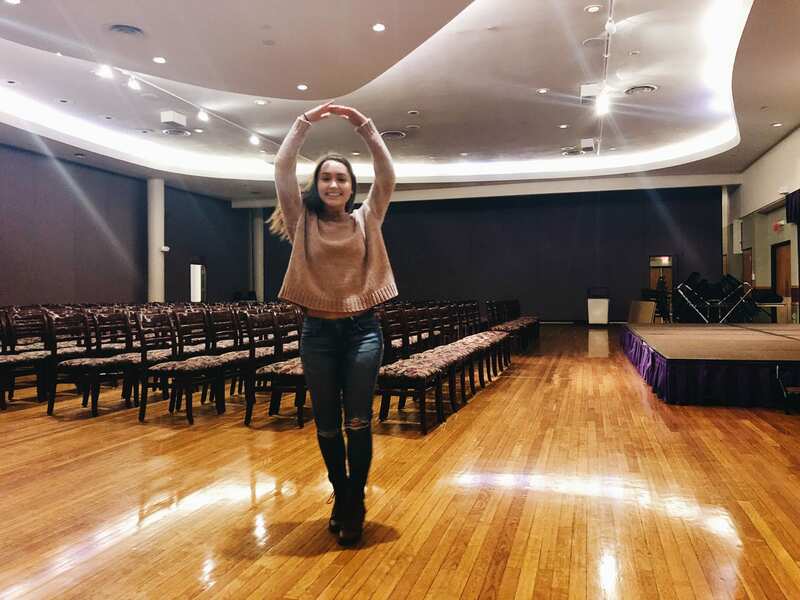 “A couple of librarians and I have gotten office spaces within our respective disciplines, so I am in in Nichols Hall with the Theater Department. I’ve tried to become more entrenched with their faculty and students, and that’s been great. I see them every day, and it’s very easy for them to find me and for me to be a resource for them because I’m physically there right now. Mary Bailey is the continuing resource librarian. 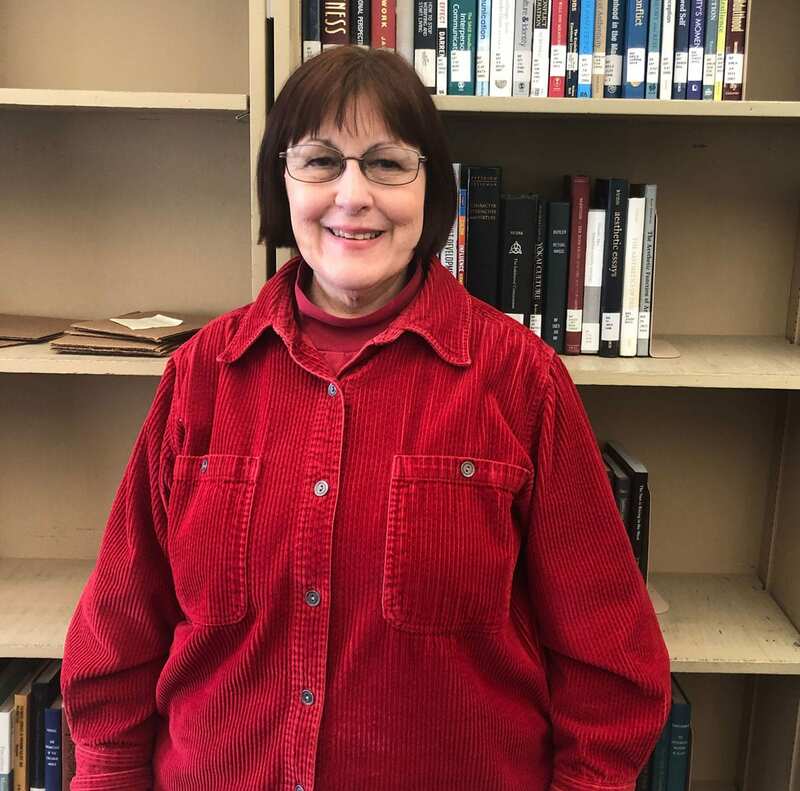 Her career in military, public, school, and higher education librarianship has spanned 40 years. She’s currently in the Unger Complex. 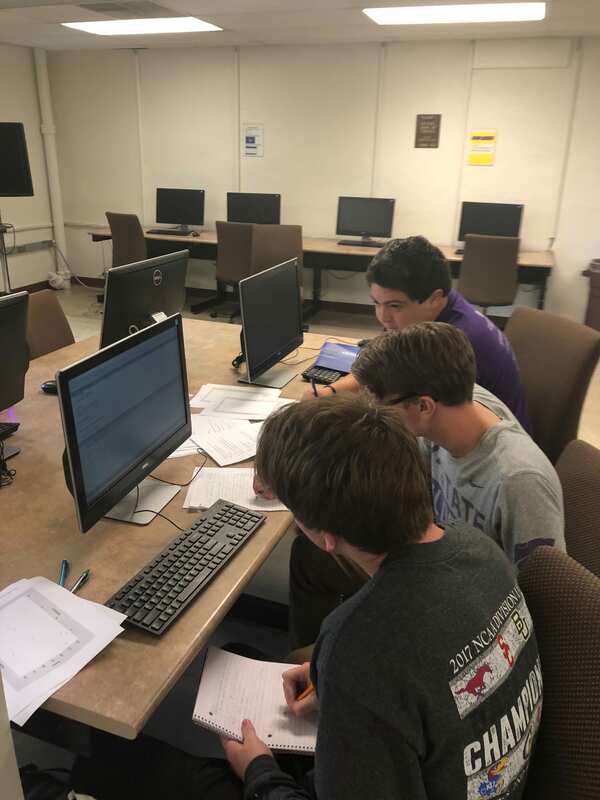 “Part of our work is to make sure that when a K-Stater is off-campus that they can access all of the databases and online resources that the Libraries pay for by simply signing in with their K-State username and password. This isn’t your first time working out of the Unger Complex, is it? 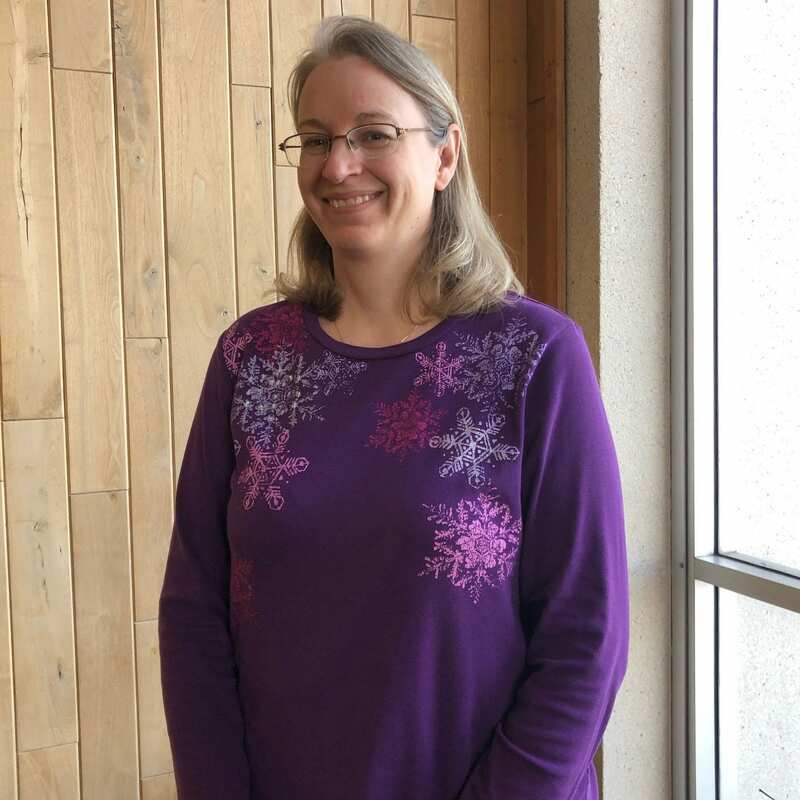 Carolyn Hodgson has worked for K-State Libraries for 22 years. Currently, she’s in charge of the reserves materials collection and works out of Seaton Hall. What do you remember from the day of the fire? “The fire alarm went off at 3:58, and we just thought it was a normal fire alarm, so I picked up my purse and went to my exercise class. When we got out, we could smell smoke and hear the sirens. People were going ‘Yeah, the library is on fire.’ Then I got home and had all these messages on my answering machine, asking if I was okay. Like Carolyn, we are all excited to see what the future of Hale Library holds. We’re reminded, too, that libraries aren’t just about buildings—they’re about the people who work there, the people who use them and the people who believe in their value. We know our blog readers fall into one or all of those categories. Thank you! Interviews were conducted and transcribed by communication student employee Rebekah Branch. Transcriptions were edited for clarity and brevity. We’ve witnessed a lot of things go down on the fourth floor of Hale Library over the years: students camping under tables with blankets and pillows during finals week; physical anthropology study sessions that featured skeletons and piles of bones; and, well, let’s be honest, we’ve seen some fourth-floor stacks activities we wish we hadn’t. 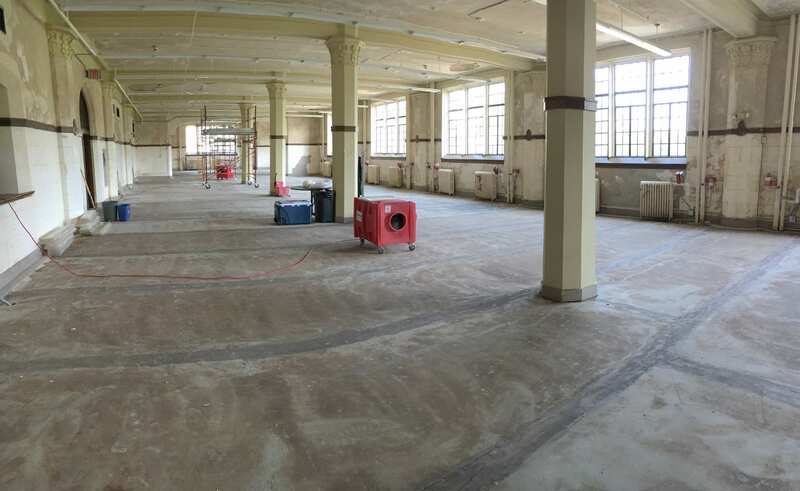 But we’ve never seen fourth floor as a woodworking shop … until now. 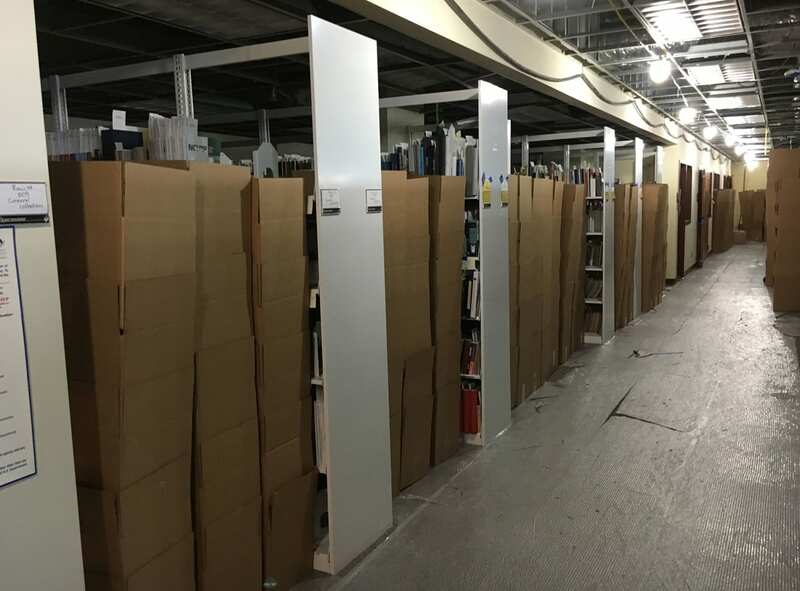 A lot of materials — like the entire physical library collection and one of the murals — have been packed out so they can be cleaned and stored until Hale Library renovations are complete. 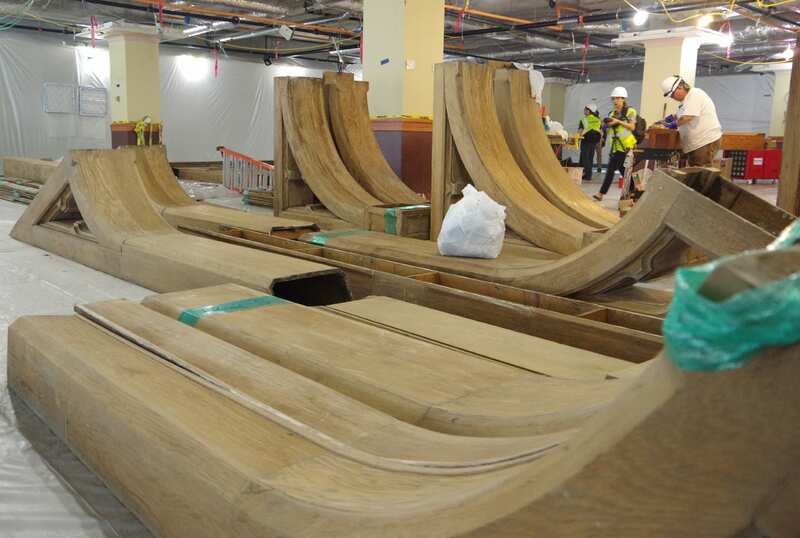 Clean wooden beams from the Great Room ceiling fill Hale Library’s fourth floor. The Great Room woodwork is staying, though. Crews are cleaning and stripping the beams. 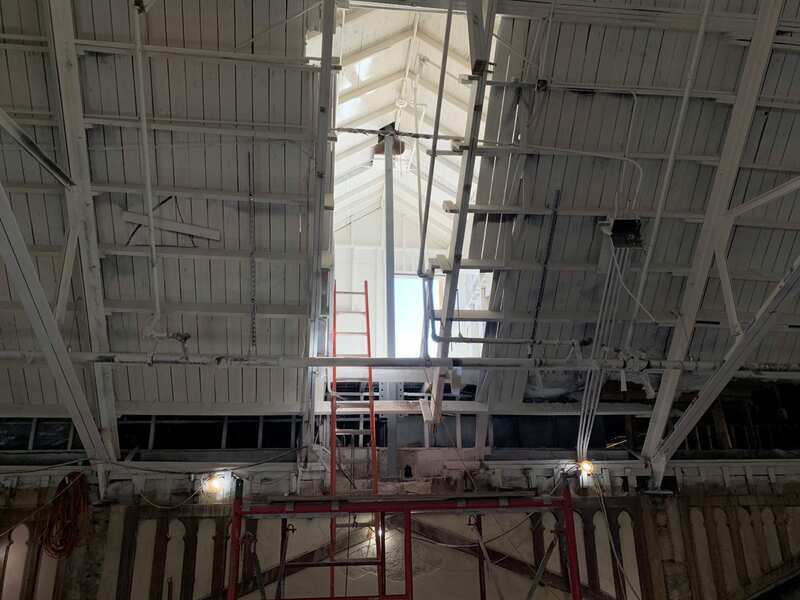 Eventually, they’ll be refinished, and when the roof and ceiling are repaired and the space is ready for renovation, the beams will be reinstalled. The fourth floor woodworking space is walled off with plastic. 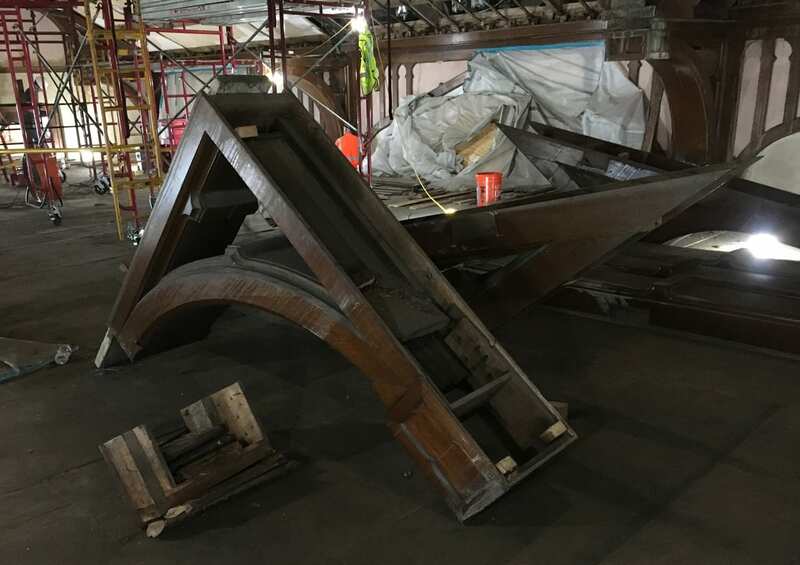 Crew members from John Canning Co. clean and remove varnish from two decorative arch braces that hung in the Great Room. A worker from John Canning Co. cleans a piece of Great Room woodwork. Another worker applies stripper to remove coats of old varnish. 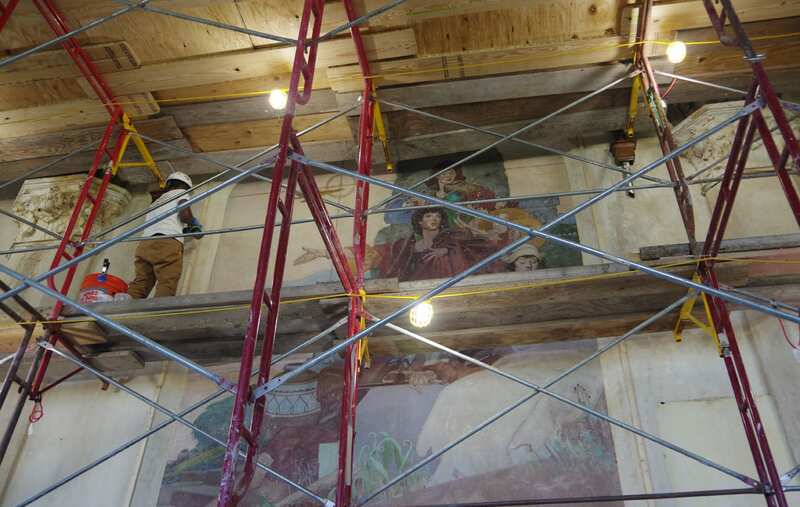 Meanwhile, back in the Great Room, conservators continue to monitor and stabilize the David Hicks Overmyer murals. John Canning staff members have cleaned the murals, removed the damaged layer of varnish, stabilized areas of paint and applied a new layer of varnish. 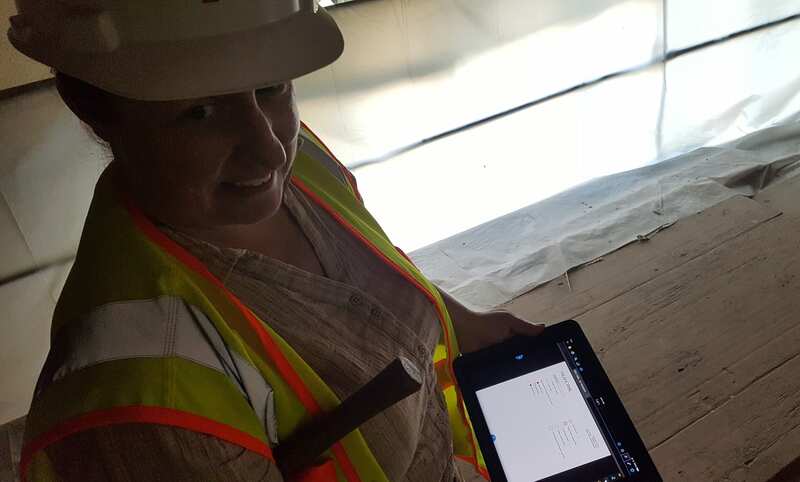 Julia Manglitz, an architect from TreanorHL Historic Preservation, stands on one of the ledges supported by scaffolding in the Great Room. She explained to us how she tests the condition of the plaster by “sounding,” or tapping the wall with a mallet and listening for how hollow it seems. A figure from the “Arts” mural is covered in white spots of thermoplastic adhesive, which is used to stabilize flaking paint. 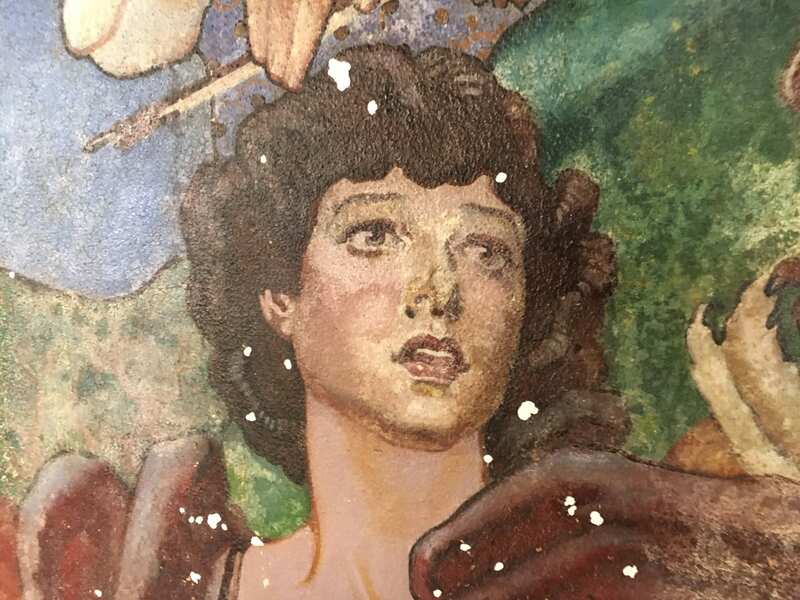 Additional mural restoration is on hold until two things happen: First, the plaster walls need to be more thoroughly dried out, and second, the rest of the Great Room restoration needs to be more advanced so that the murals aren’t re-damaged during that process. To prevent the murals from getting damaged while the rest of the Great Room is renovated, conservators have covered them with a felt-like fabric that’s attached to a tack strip that runs around the perimeter of each painting. 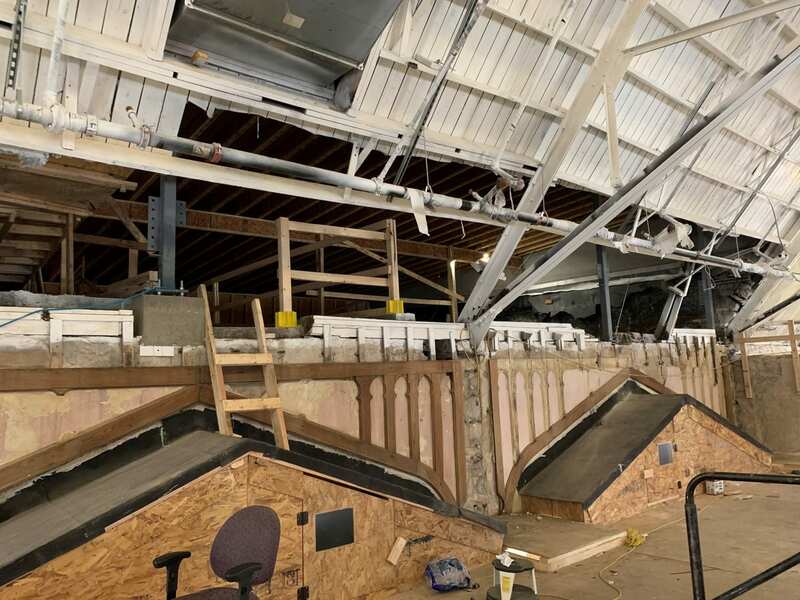 In the temporary “dance floor” space above the murals (which are barely visible at right), the roof joists are exposed. 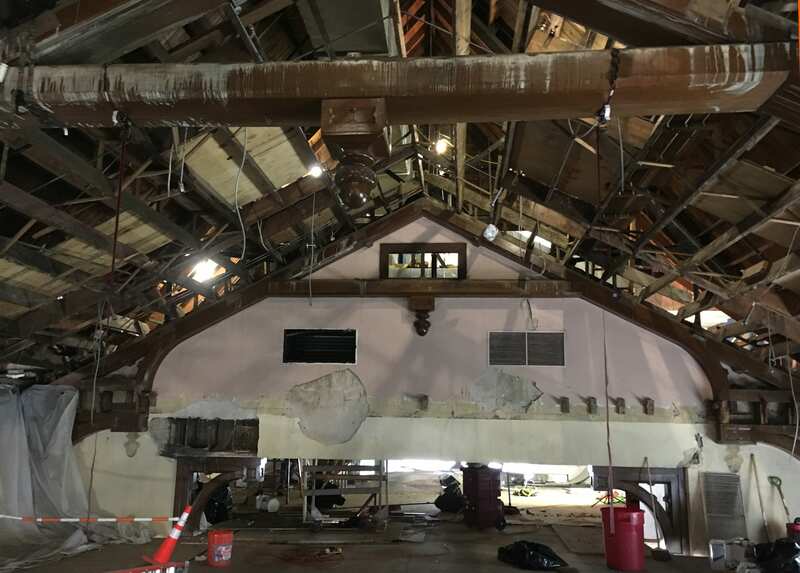 Up above the murals, the Great Room’s decorative woodwork has been removed, and the ceiling has been completely torn out. 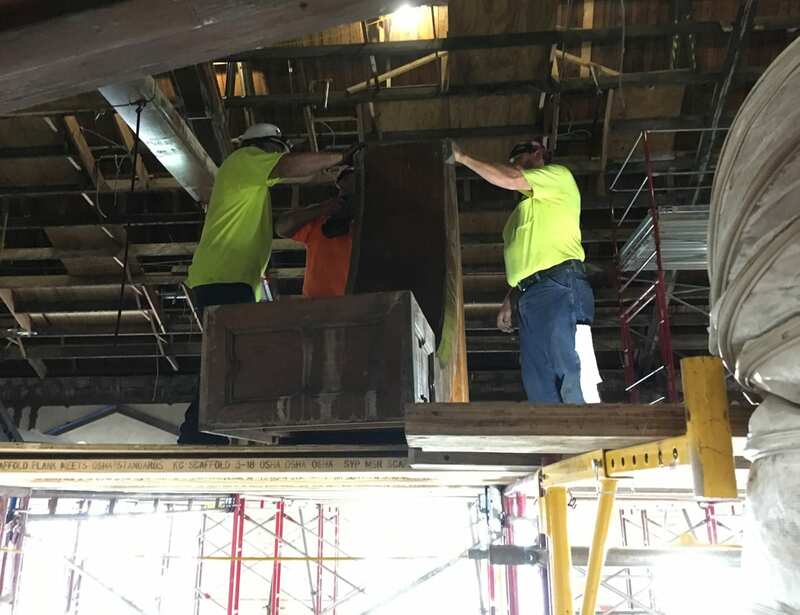 Crews from Hutton Construction are moving in to start replacing the roof and ceiling in the 1927 building. 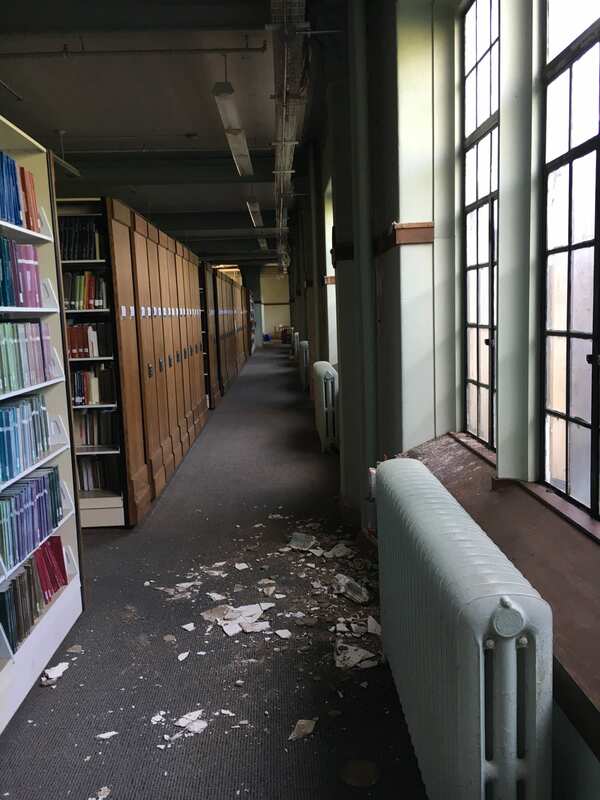 Elsewhere in Hale Library, most of the recent action has centered on cleaning toxic soot from all surfaces and scraping up the carpet glue. Since that process is nearly complete, the size of the Belfor Property Restoration crew has been scaled down. 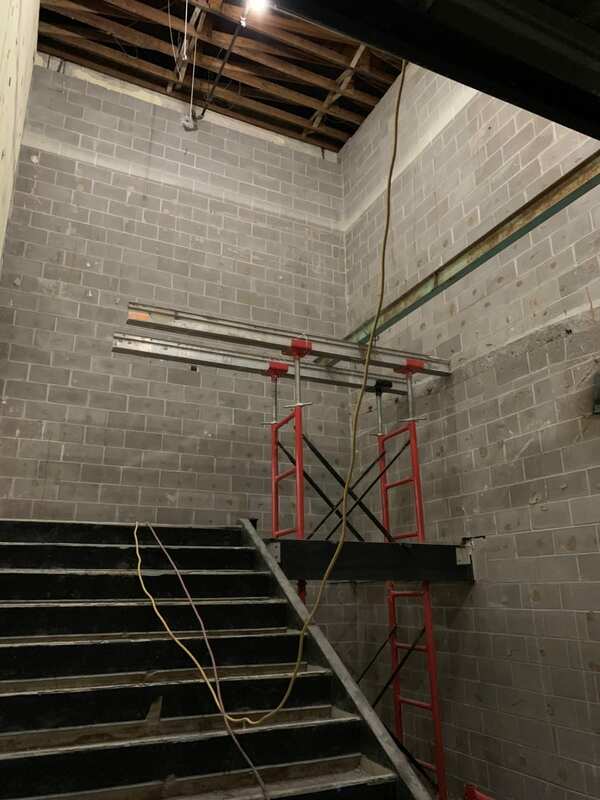 Your daily dose of vertigo is brought to you by the scaffolding in Hale Library’s southeast stairwell, where they recently cleaned walls, railings, light fixtures and the ceilings. The process of scraping carpet glue on Hale Library’s third floor was a lot labor intensive and a little gross and sticky. Library or roller rink? After the glue was scraped off, the concrete and tile floors were cleaned and polished. 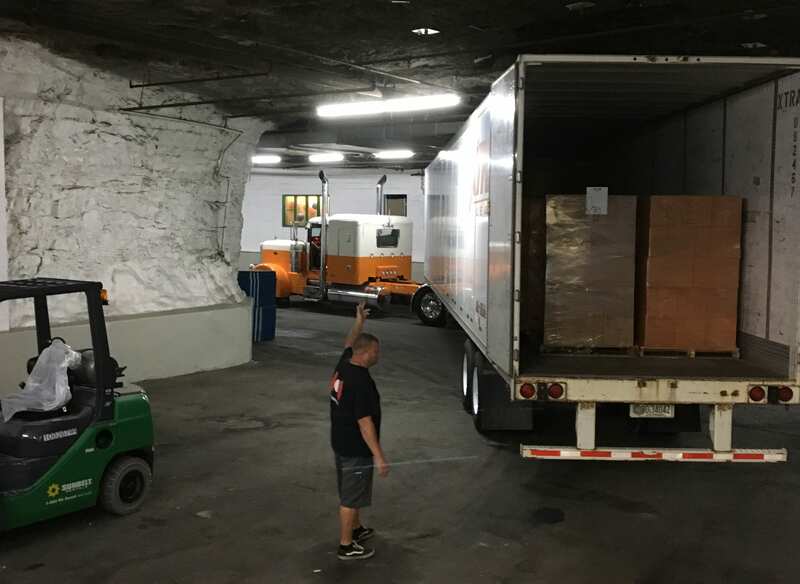 Even though the Belfor folks are starting to leave Manhattan, they aren’t taking a break: As organizations across the Carolinas assess the devastation wrought by Hurricane Florence, Belfor will be on the ground with their massive semi-truck command center and their amazing people. We wish them a safe assignment as they begin recovery efforts there. It’s been eighteen weeks of damage assessment and drying out, packing collections and planning. 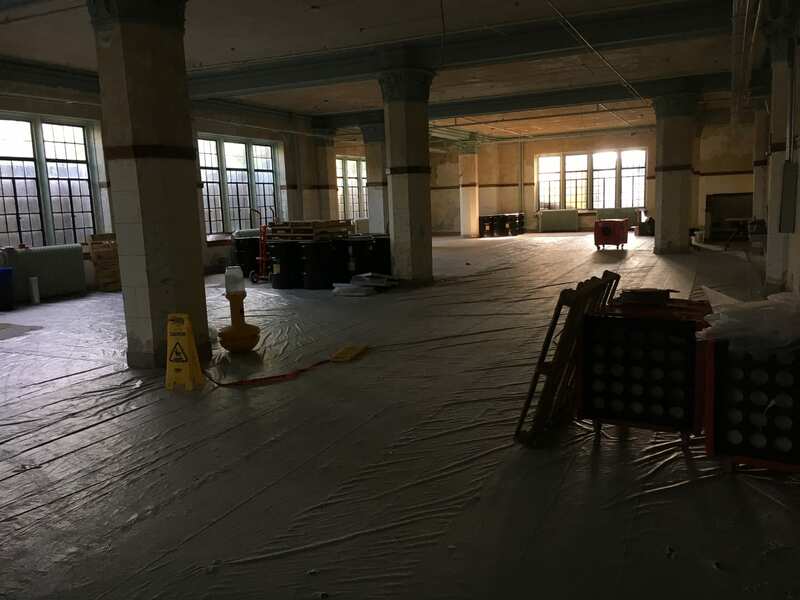 The space is a clean slate, and in forthcoming posts we’ll be able share a lot more about the Hale Library of the future. Hi! My name is Brenna. 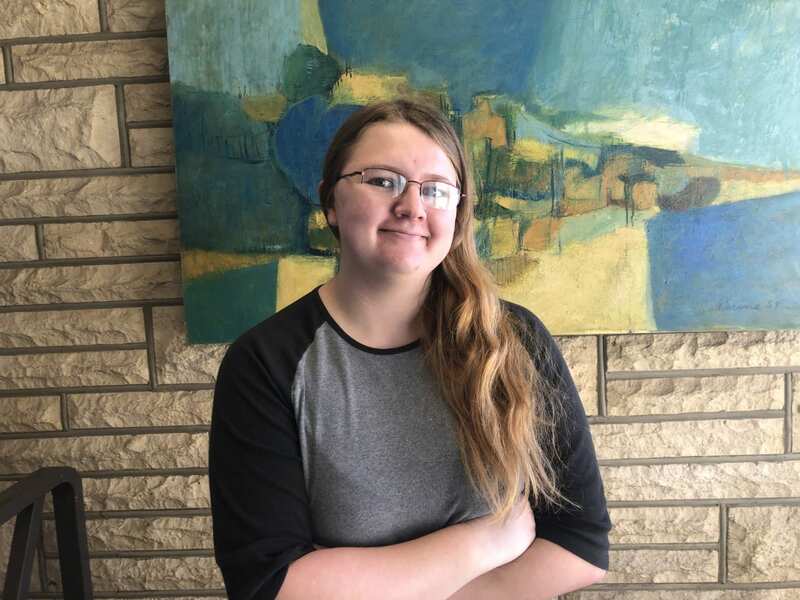 I’m a junior from Conway Springs, Kan., majoring in English. 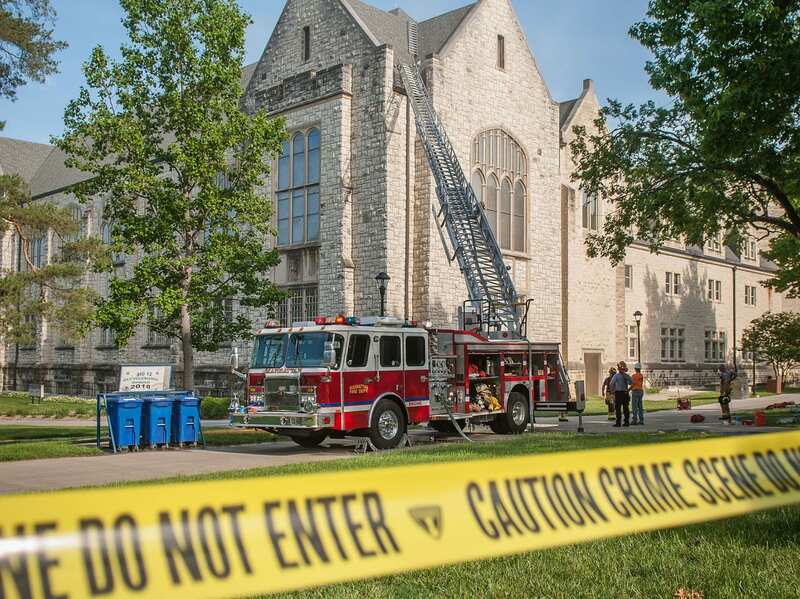 I was hired as a communications student employee for K-State Libraries about two weeks before Hale caught on fire, and as someone who basically lived in the library last semester, I was pretty upset when I heard what had happened, especially when I realized the extent of the damage. This is me, looking a little sleep-deprived at work. The K-State Student Union has stepped up in amazing ways, especially by hosting Library Help and IT Help desks. Everyone knows about it as a study spot, though. I decided to take a mini-tour to see what other study locations around campus are my favorite! Here are a few out-of-the-way areas you might not know about. 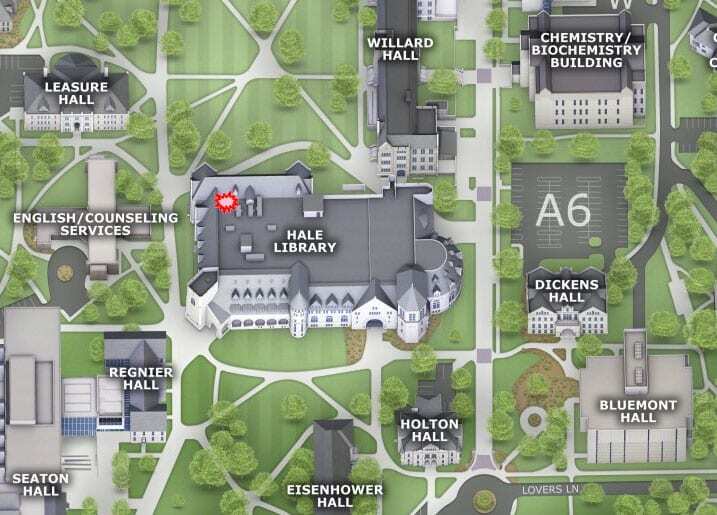 I used the “Hale recovery” tab on the K-State interactive map to find locations that would be good on-campus study spots. The map itself was incredibly helpful since it has the hours listed as well as the room numbers or floors. My first stop was Calvin Hall’s third floor, which is advertised on the map as a location with group study space, printing capabilities and a computer lab. The group study spot was extremely comfortable with rows of cushioned chairs and a pretty relaxed atmosphere. The very nice grad student who I talked to said that it’s typically pretty empty, except for right before class starts. There is also a charging station with both Android and iPhone compatible cords for those days when you find yourself without a charger. You can also find a computer lab with a printer in Room 318. Charging station with cords for Androids and iPhones in Calvin Hall. Friendly Calvin Hall grad student. Eisenhower Hall 121 was the next place I visited. 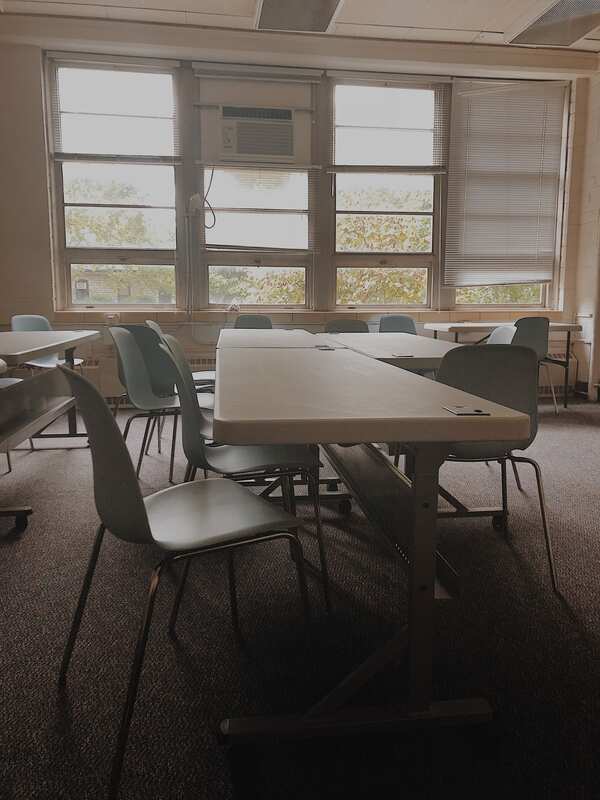 This room is a designated quiet room, and it had a lot of outlets surrounding the desks, which is always a plus. There was no one there at all, and it was really easy to find. There is a chalkboard there if that helps you study. Unfortunately, there is no printing in Eisenhower for students, so plan accordingly! Tables in Eisenhower 121, a quiet study room. The College of Business Building is home to some amazing study spaces. Rooms are available for both quiet study and group study. Even the open study spaces on the first, second and third floors were relatively quiet. The very friendly student I talked to said that the areas are generally heavily trafficked and that it can be difficult to grab a study room. However, there were so many different seating options and arrangements outside of study rooms. Nearly all of the chairs I saw also had desks near them. Printers are available, and they are located near the first, second and third floor elevators and in the back of the computer lab located in Room 3121. Seating options in the College of Business Building. Study room in the College of Business Building. The computer lab in the College of Business Building, Room 3121. Next up, Justin Hall! 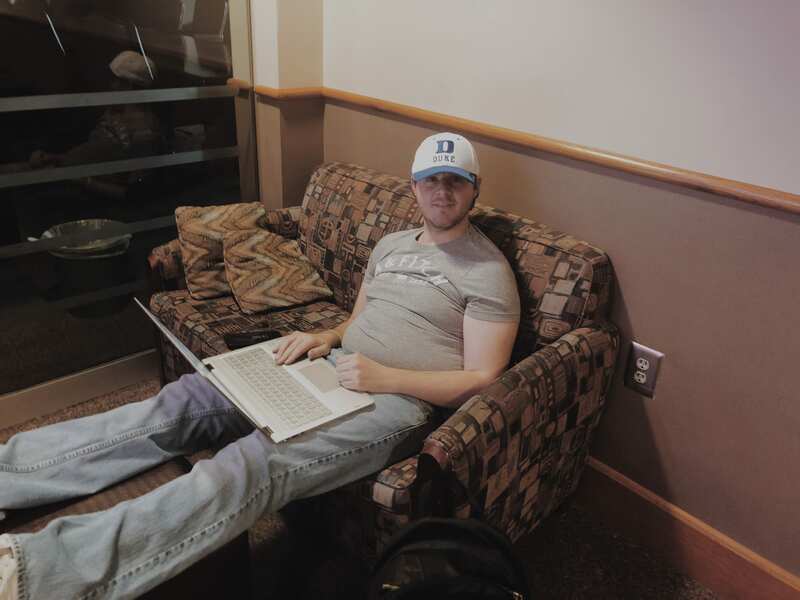 Justin Hall has a quiet study room (Room 301) on the third floor and group study locations on the first floor in an open area. The printer in Justin Hall, which is located by the group study area. Right by the entrance to Justin, there are tables with chairs for groups, and farther back in the first floor is another group of comfortable chairs—these do not have desks, but it was quite a bit quieter than the area by the entrance. Printers are available both in the quiet study room and in the group study location to the left of the main entrance. Quiet study in 301 Justin. Dickens Hall has 24/7 printing available! It is a computer lab, so it has a lot of computers and a printer available. They’re located in Room 1, which is in the basement. You can access it through the back entrance on the north side of the building or the wheelchair accessible entrance throughout the night. Rows of computers in the basement of Dickens Hall lab. The computer lab in Dickens Hall. 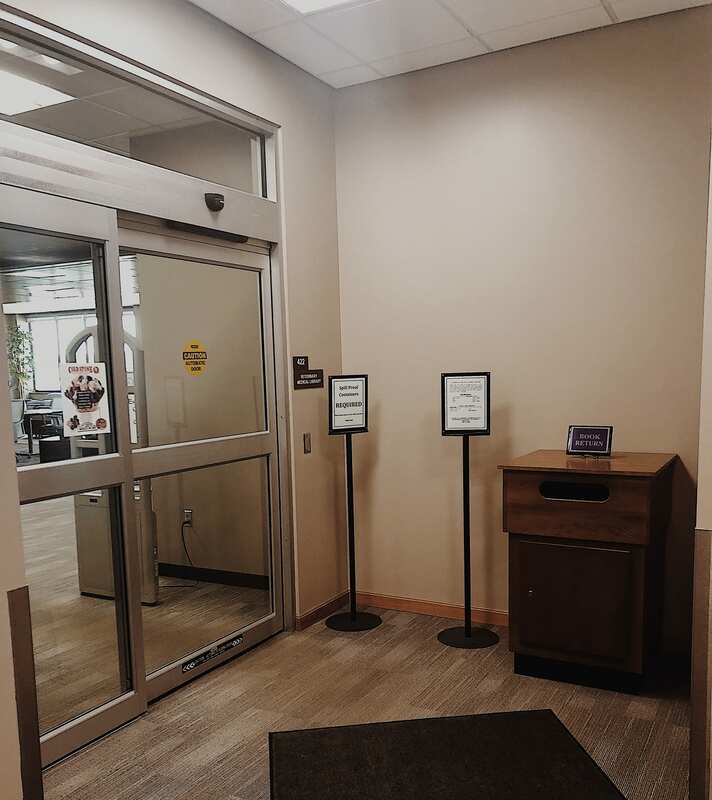 Wheelchair accessible entrance to the computer lab in Dickens Hall. The Vet Med Library is located on the north side of campus in Trotter Hall, very close to the K-State Rec. Its amazing booths might just be worth the trek. It’s open 8:00 a.m. to 5:00 p.m. and has public computers, scanners and a printer. The printer does cost a small amount because it doesn’t accept CatCash. 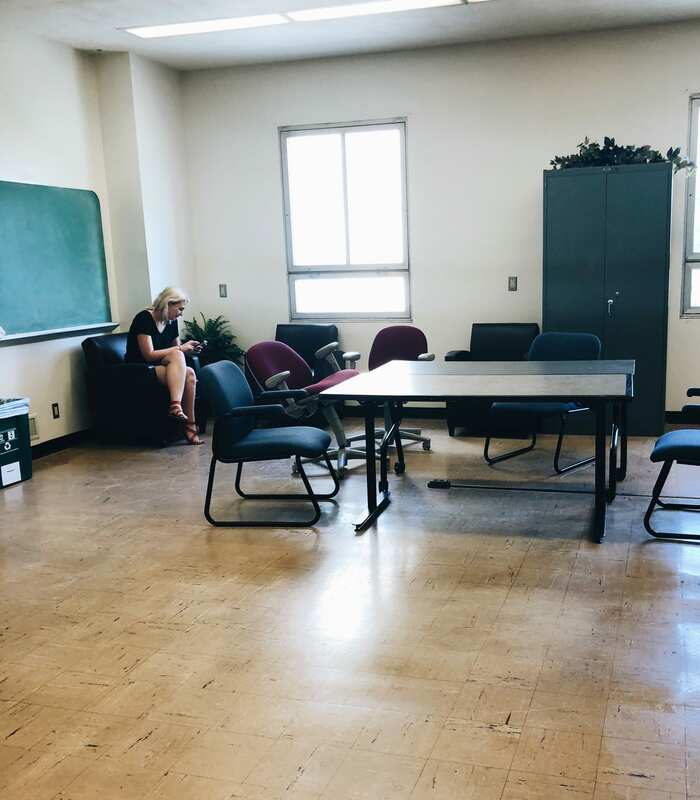 There is an open group study area as well as a room specifically for quiet study, Room 422. It is located on the fourth floor of Trotter Hall and is to your right when you get off the elevators. The chairs are comfy, and there is a variety of seating arrangements, including those booths—they’re now my favorite spot because they have outlets on the table and are incredibly comfortable. Entrance to the Vet Med Library on the fourth floor. Group seating in the Vet Med Library. Booths in the Vet Med Library. I found a ton of study spots that I did not know existed before this year, and some of them I really loved. If you’re like me, you’re missing Hale Library, but there are great spots out there. Go find your new favorite spot—and let us know about it! We have only shared a small percentage of the thousands of photos that have been taken of Hale Library since May 22. This week we wanted to share a few more that are meaningful to us. Some are powerful illustrations of the reality of the devastation inside the building; others show how far we’ve come in the recovery process. We’ve also included a few that are laden with memories and our hope for the future of Hale Library. Here’s looking at you, Hale: A drone’s eye view of the building taken after the fire gives a sense of the phases of construction over the years. Historic Farrell Library (1927) is at the upper left. The white square inside the red circle is a temporary roof that covers areas damaged in the fire. June 21, 2018. There’s one aspect of the recovery that’s hard to get across in these blog posts: It’s dark in there! We share photos that are as well-lit as possible, but in those instances, the light source isn’t Hale Library’s lights; they’re either natural light from the windows or temporary lighting. An alcove on the first floor, south side of Hale Library. June 11, 2018. 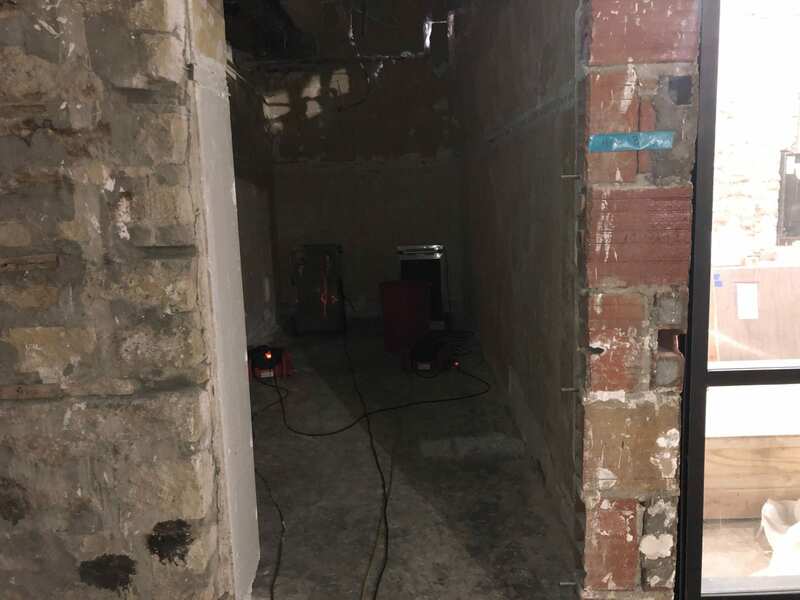 The electrical infrastructure was seriously compromised, so the building is operating off of temporary construction power supplied by portable units rather than “house power.” As soon as you walk away from a space that’s lit up with construction lights … you’re in the dark. 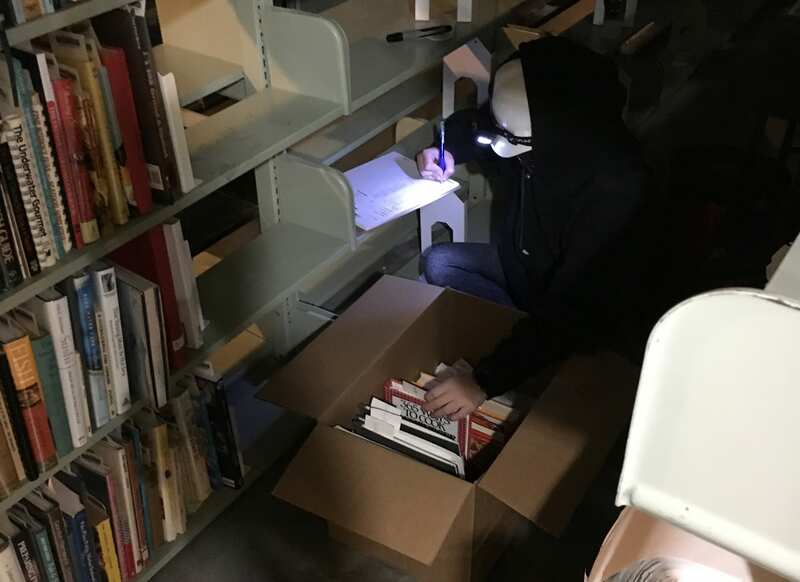 More than once the power has gone out on the workers removing the books from the stacks. Now imagine that you’re working in here, and those light bulbs go out. August 13, 2018. Fortunately, the building is nearly empty now. We’ve come a long way in the last sixteen weeks. The majority of the collection has been packed out, the duct work is completely clean, and the process of removing soot from all other hard surfaces is nearly complete. Our services have been successfully relocated, too. The reserves collection surrounded by water pooling on the carpet. May 24, 2018. 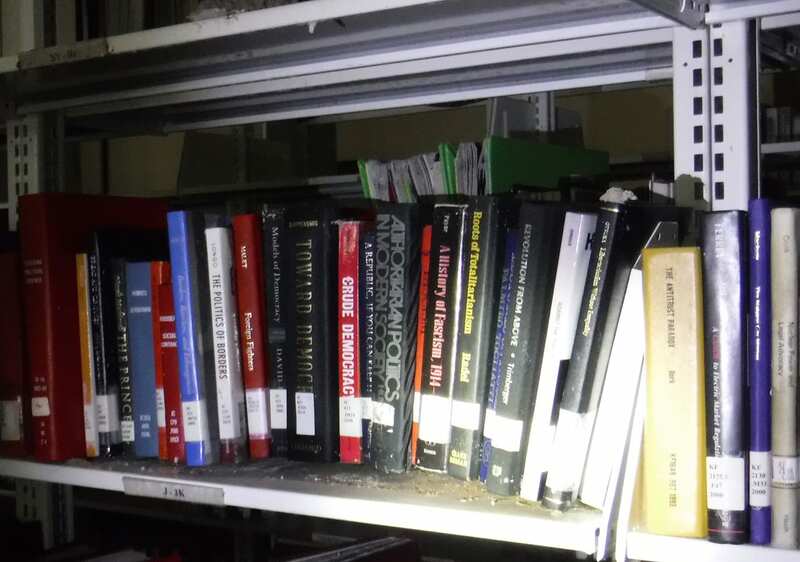 The reserves collection, which includes a lot of textbooks, was located behind Library Help on the second floor. Now students can access reserves at branch libraries and the new Library Help Desk at the K-State Student Union. IT computers sit in puddles of water in a cubicle on Hale Library’s second floor directly below the Great Room. May 24, 2018. These days, the IT Help Desk is up and running in the Cat’s Pause Lounge on the top floor of K-State Student Union. And those two sodden and sad locations in the photos above? They’re awaiting their next act! 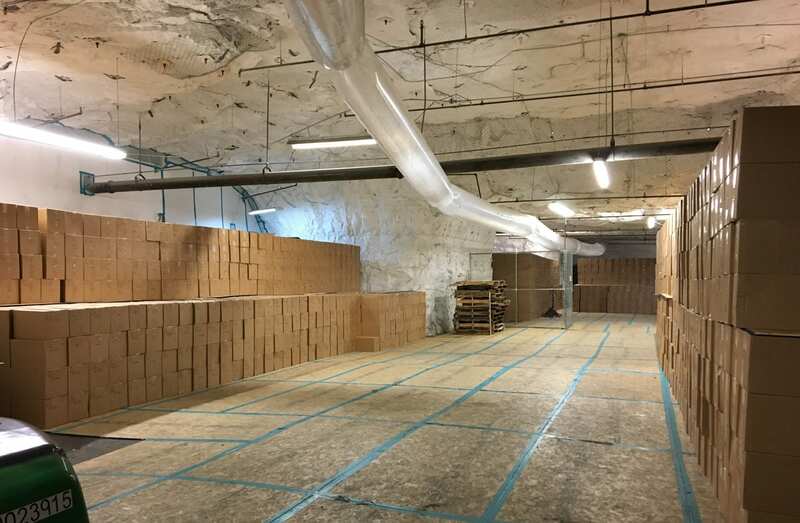 The second floor office area is clean and empty; at rear of photo, the reserves shelving is wrapped in plastic. September 5, 2018. Room 212, former home of IT Services, is a blank canvas. August 10, 2018. If you’ve been on campus since the first Potter film came out in 2001, you probably know what we’re talking about. The Great Room has inspired comparisons to the Great Hall in the Harry Potter movies for nearly two decades. More than one student has said that just being there made them feel smarter and more focused. Post-fire, it looked as if the Harry Potter Room had a brush with some dark magic. A hole in the Great Room ceiling from a wand misfire? Nope, it’s from fire. July 20, 2018. 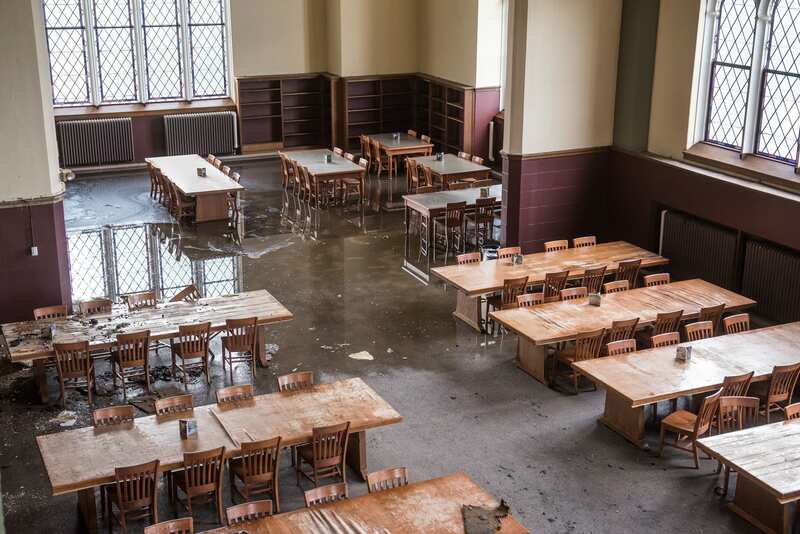 Water pooling across the floor, warped tables. May 24, 2018. This Hagrid-sized acorn fell from the ceiling. Now, most of the woodwork has been deinstalled (in a much more deliberate and careful manner). It will be refinished prior to reinstallation. August 6, 2018. These days, it’s gratifying to see the space wiped clean and buzzing with activity. 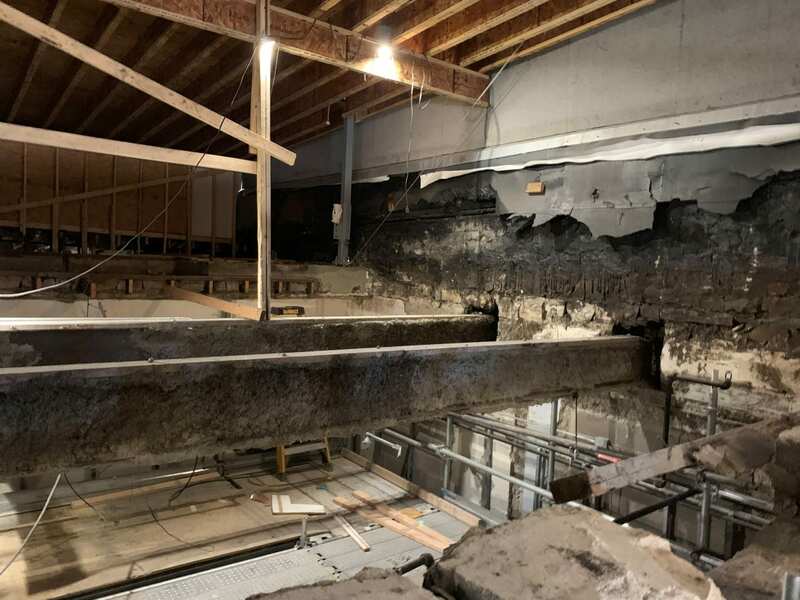 We’re moving forward, and the team of conservators, architects, construction workers and craftspeople executing the recovery and restoration plan are wizards at what they do. 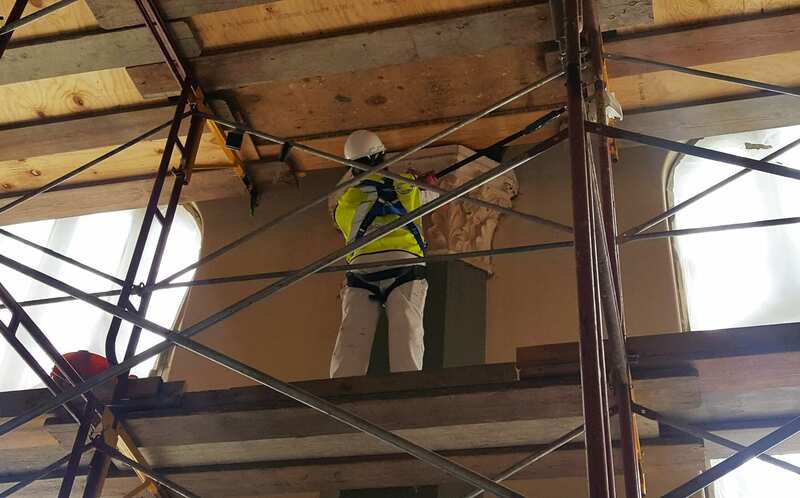 A worker removed paint from a plaster capital to allow water to evaporate from the walls more quickly. July 20, 2018. A worker at left removes paint from a pilaster to speed the drying process. At center, a conservation specialist examines fragile portions of the “Arts” mural. July 20, 2018. Belfor workers make their way from the first floor to second. 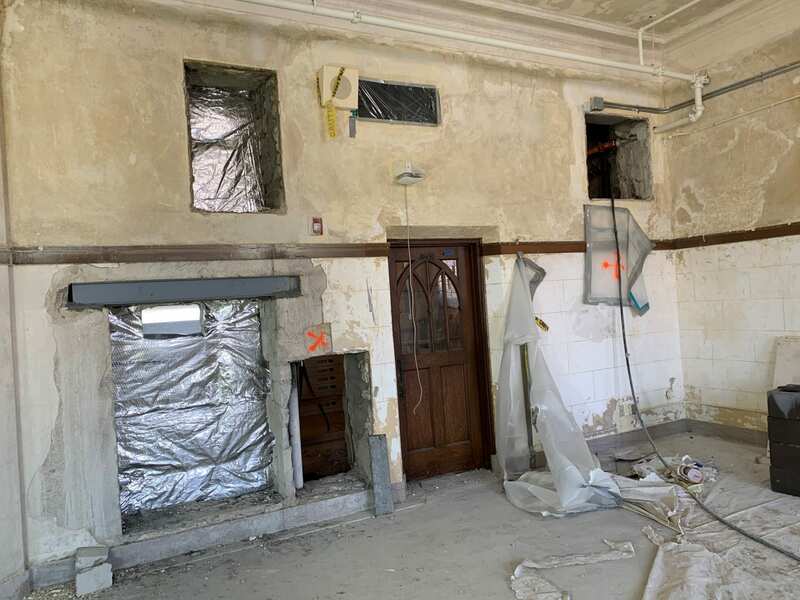 Since this photo was taken, the wooden display cases to the right and left of the second floor entrance have been removed. June 11, 2018. Here’s a less-known Potter-themed room for any die-hard fans out there. Room 117 on Hale Library’s ground floor was not a well-trafficked space. 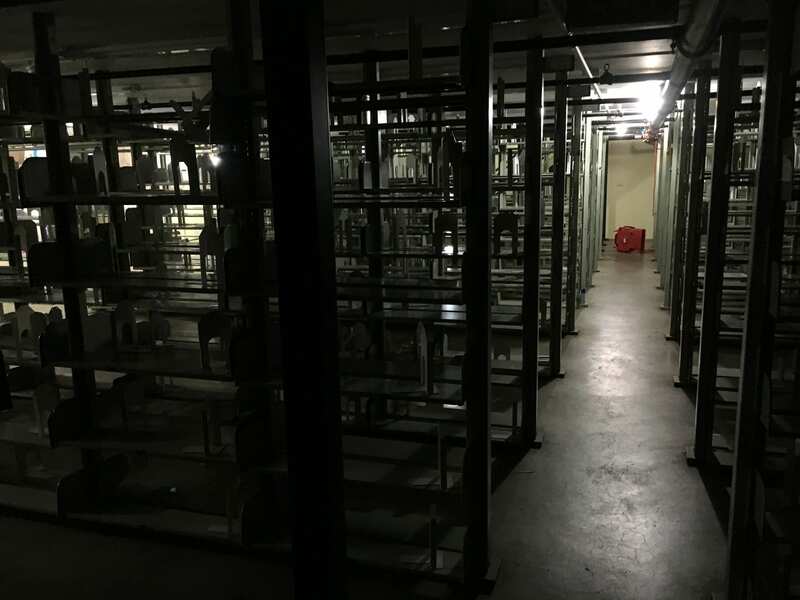 It was home to rows and rows of moveable compact shelving. 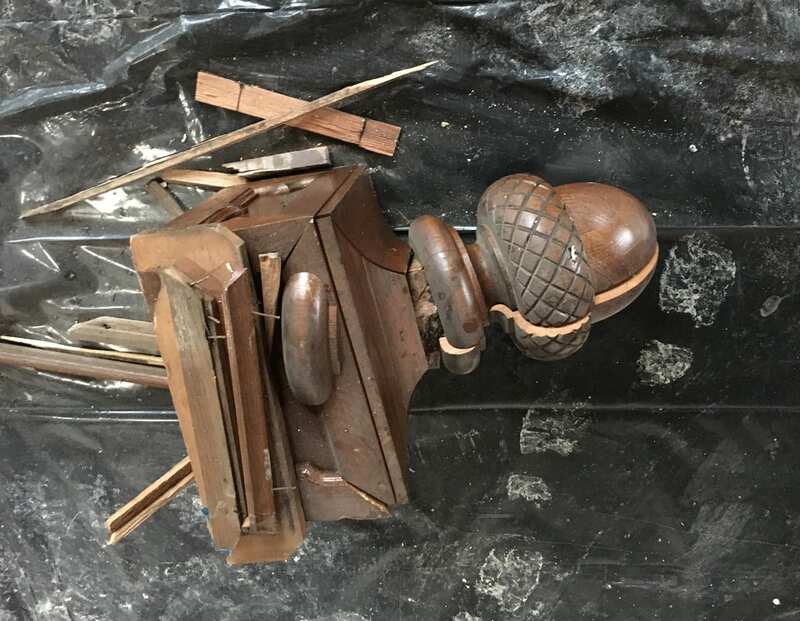 The bulk of the collection that experienced water damage was located in Room 117. Fortunately, most was deemed salvageable. May 25, 2018. Those who took time to uncover the library’s secrets, though, were aware that Room 117 was generally cooler when the rest of the building was hot, warmer when the rest of the building was cold, nearly always quiet and usually had vacant tables next to some enormous banks of windows. No space in the library, save perhaps the Great Room, offered more beautiful natural light. The shelving is gone and Room 117 stands empty. August 24, 2018. Another view of Room 117 facing west toward the English Department Building. August 24, 2018. How is all of this Potter-themed? A few of our student employees dubbed it “The Room of Requirement.” It always had what you needed. We can’t wait to see what need the Room of Requirement—and all of these now-empty spaces—fills in its next life.